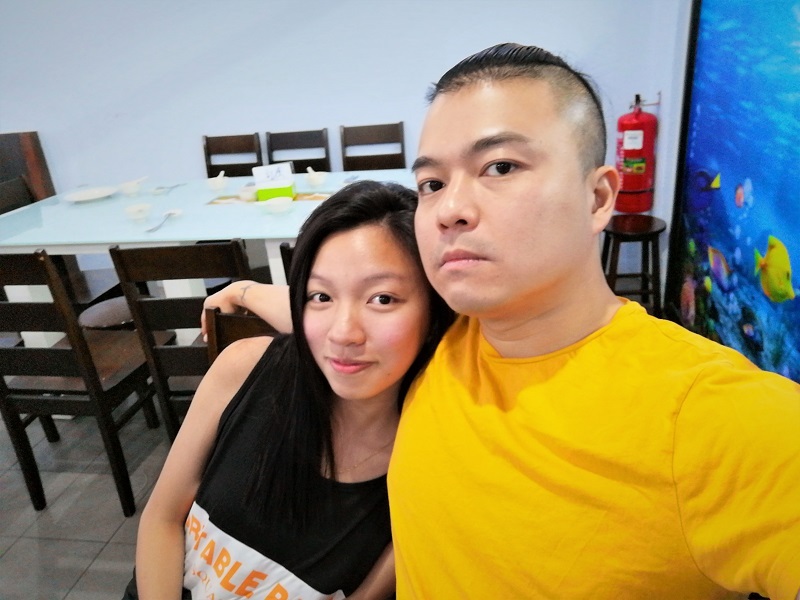 Mandy was craving for some crab on Saturday night so we headed to Sun Ocean Seafood Restaurant in Puchong so she can get her fix. 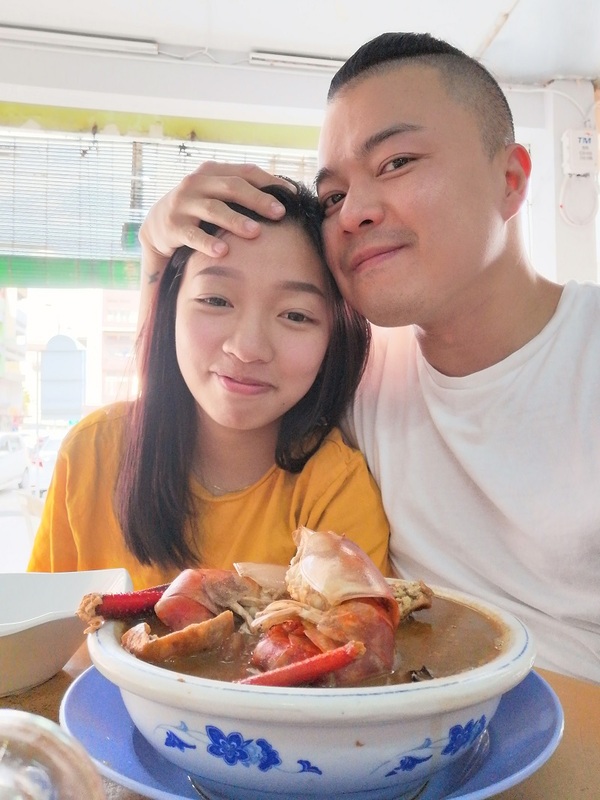 Crab is her favorite food – we’ve eaten crab at Pulau Ketam, crab at KKB during Valentine’s Day, and crab in Kuching during CNY in the past few months. She eats these scarlet crustaceans about once a month! 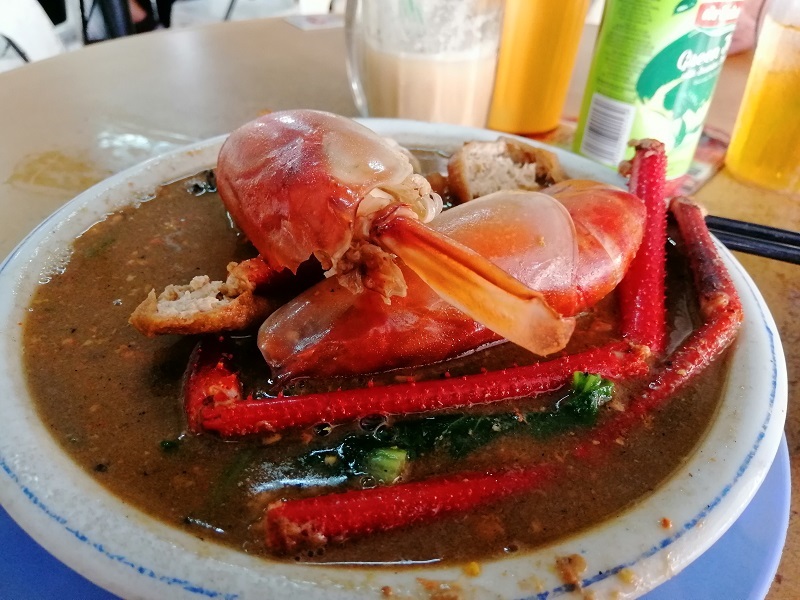 呂 I enjoy eating crab when it’s peeled like in 1 Michelin star Raan Jay Fai and I love the Alaskan king crab I had in Korea but I find it too troublesome to bother with harvesting the flesh of local flower and mud crabs. 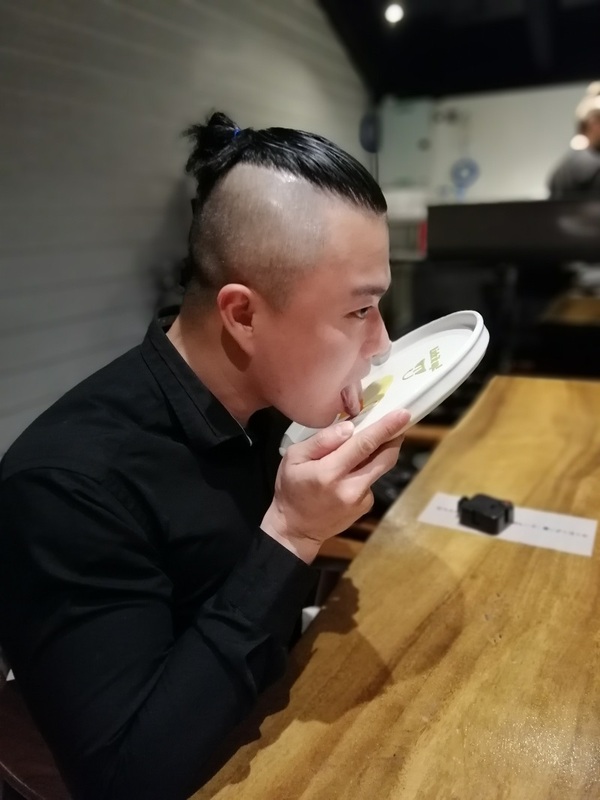 I enjoy eating fish more, especially steamed fish. 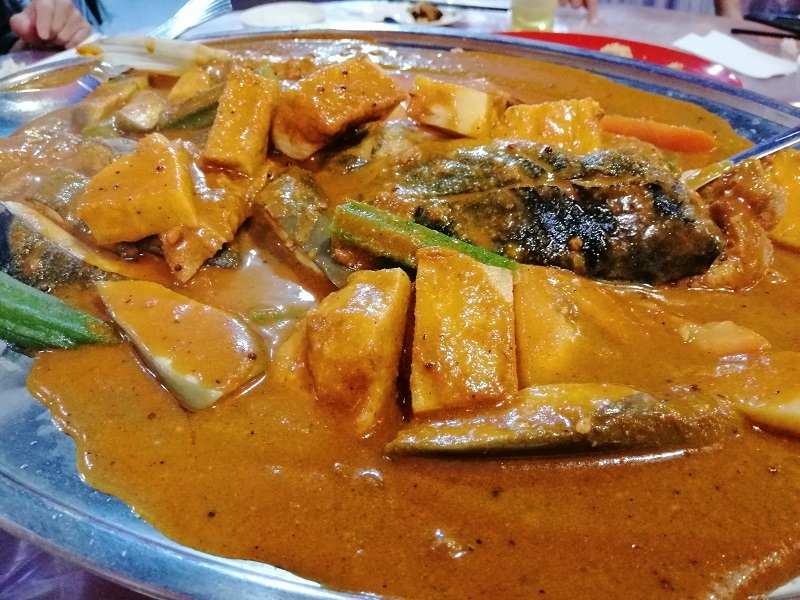 This is asam tilapia (RM 39) which was recommended by the colourful waiter. 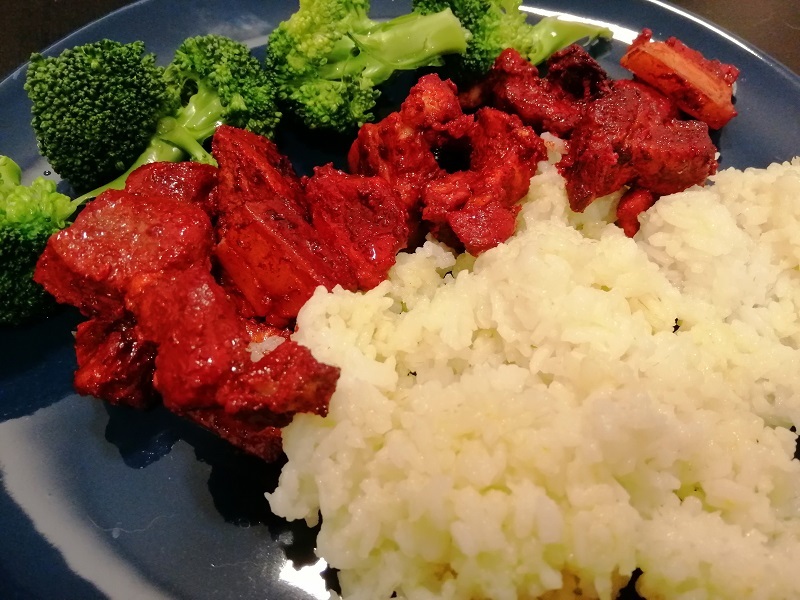  The savory asam sauce goes very well with rice! There’s a fair bit of meat on the tilapia too. The restaurant also served us a bowl of complimentary bitter gourd 勒 and tofu soup. It tasted slippery and starchy. Quite decent for a free soup. 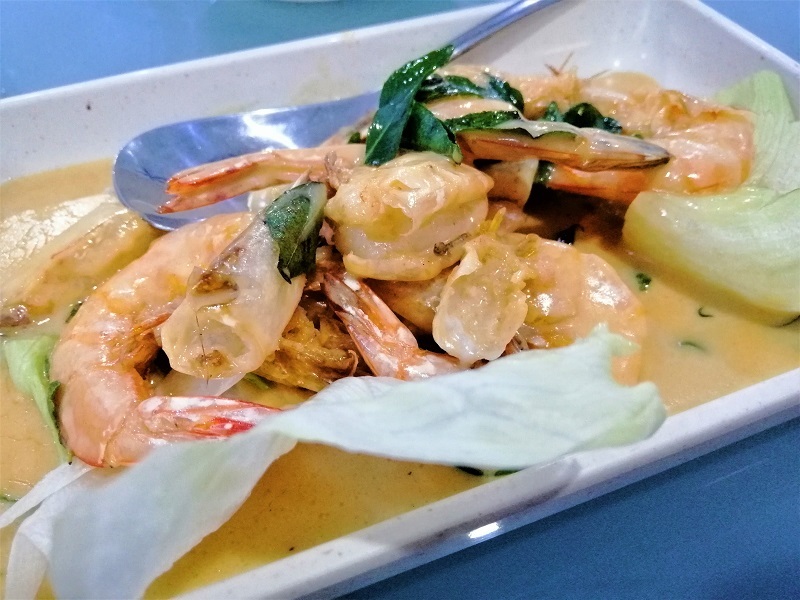 Mandy also had butter prawns (RM 20). 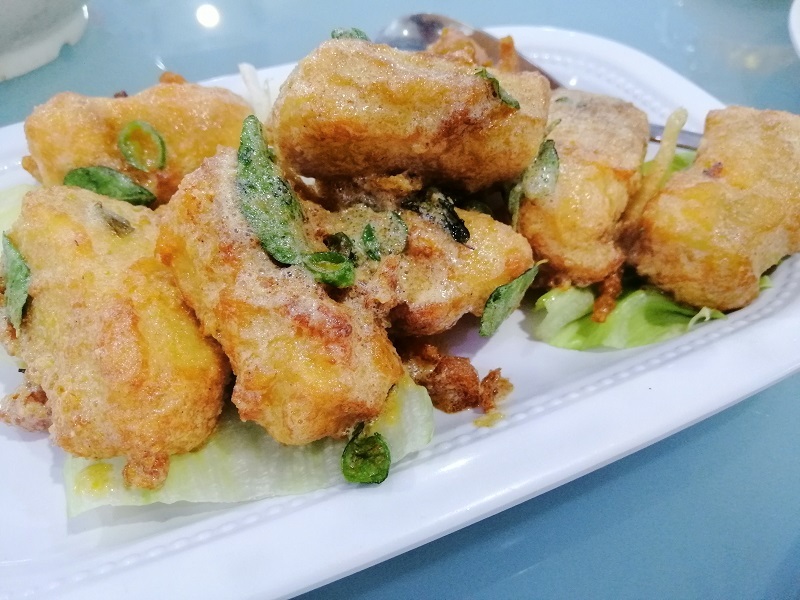 戀 You can choose either “dry butter” or “wet butter” – the former is deep fried strands of crispy butter and the latter is more like a buttery sauce. I tend to prefer the wet type since the sauce goes better with rice. 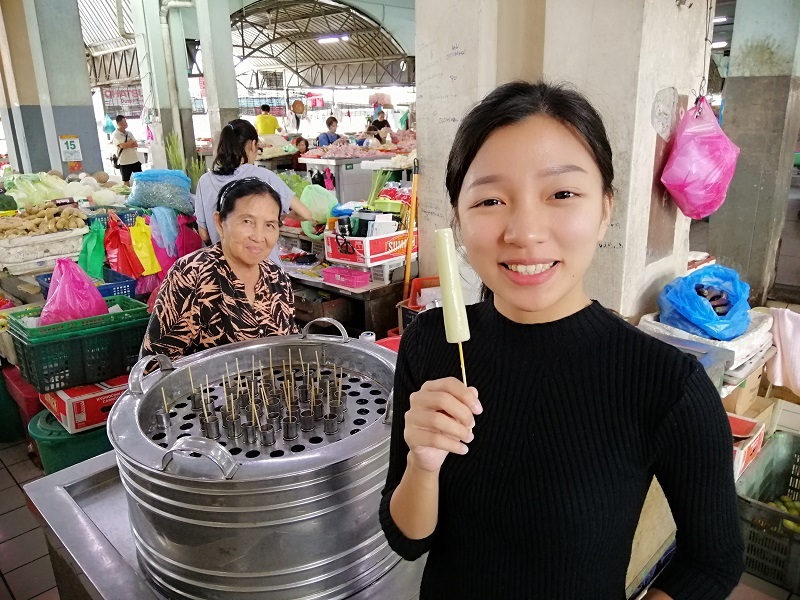 She also wanted tofu so we got salted egg yolk tofu (RM 12). 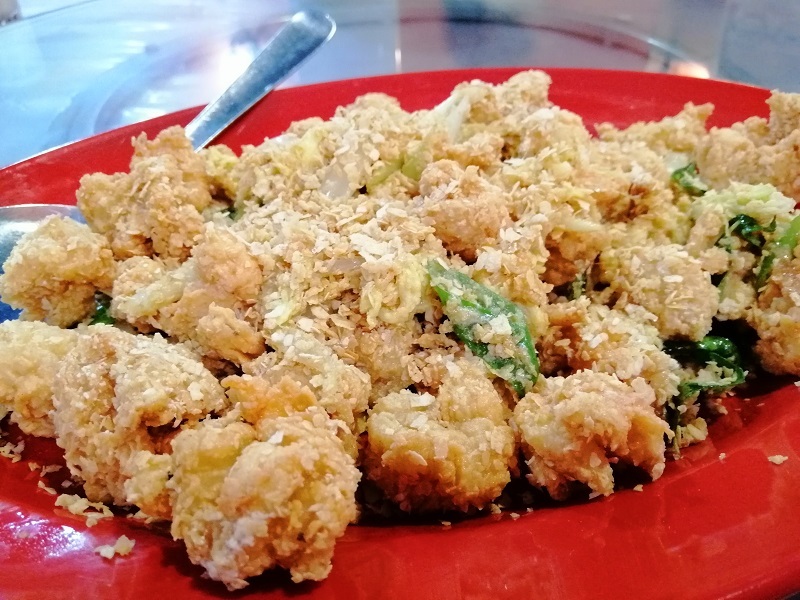  The tofu is homemade and coated with salted egg crust before being deep friend. I don’t like tofu but my dad and Mandy loves tofu so I’ve grown to tolerate it. 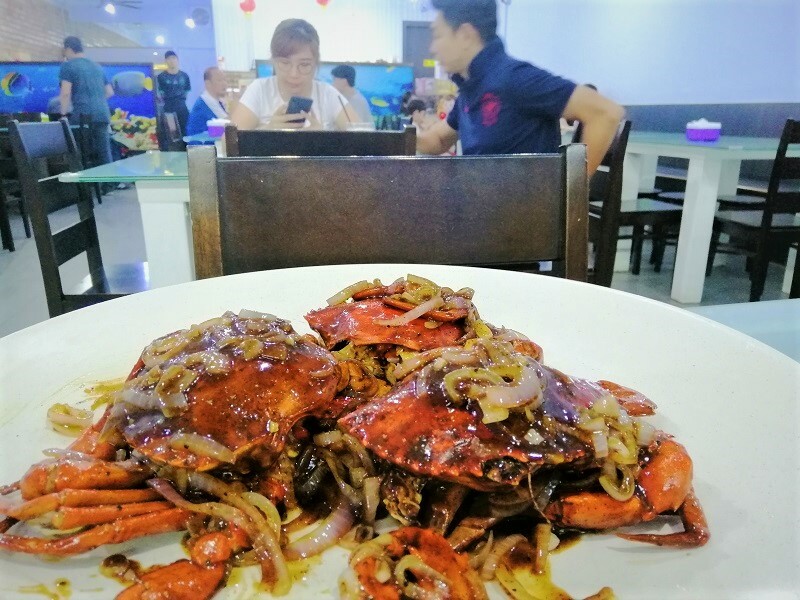 This is the main dish – black pepper crab (RM 68). 蓼 They gave us 3 medium crabs but the “medium” here was quite tiny. The crabs had tons of roe though! Crab roe filled the shells and the body. I love crab roe and the black pepper sauce was delicious! 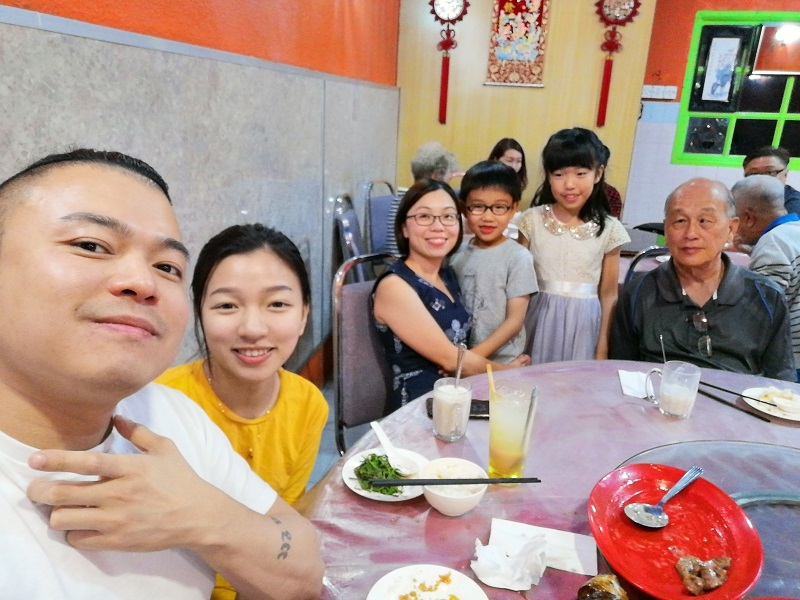 My bro Eddy and his wife came down to KL so I went to Kota Raya to meet them. 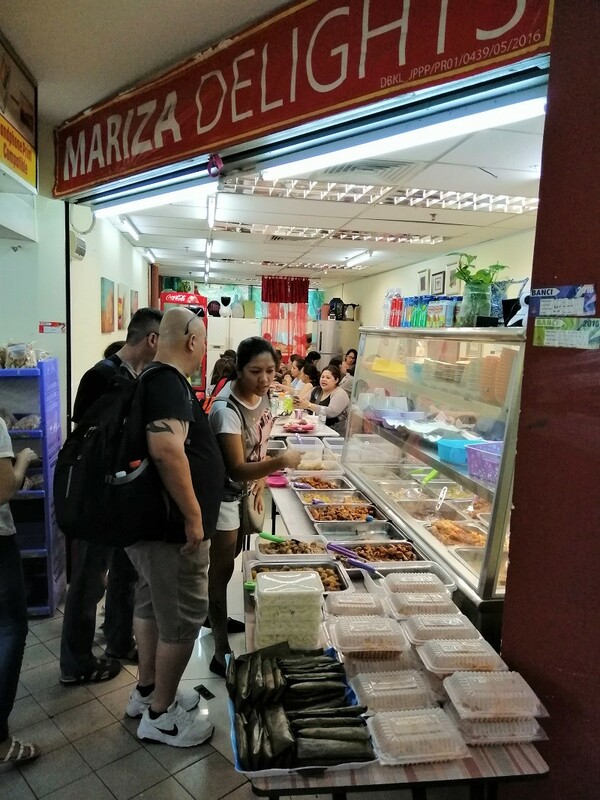 We had lunch at the stall formerly known as Mariza’s Delights. It’s under new management now but they haven’t saw it fit to replace the banner hanging over their shop. 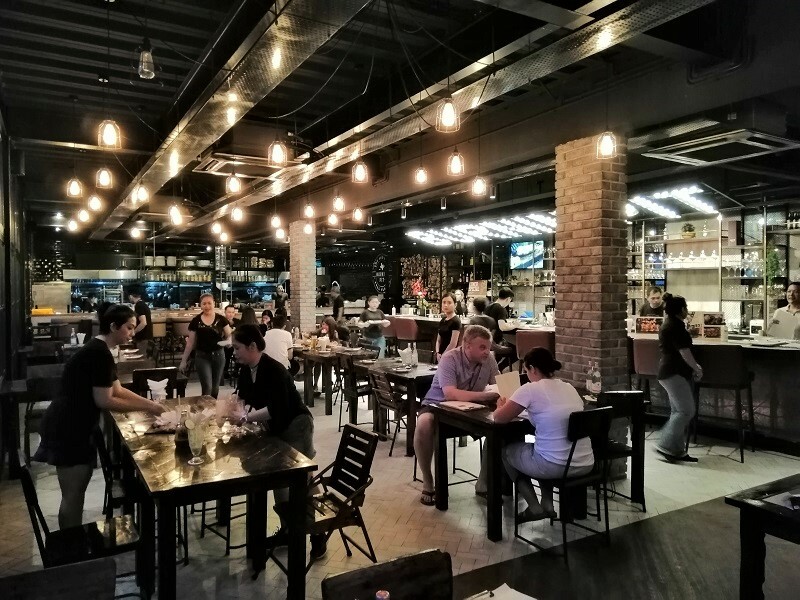 Kota Raya is a Filipino hub in downtown Kuala Lumpur – it feels like a mini Manila!  This shop came highly recommended so we went to check it out. It’s a Pinoy chap fan stall with various dishes you can pick and choose from. The interior was PACKED with Filipinos! 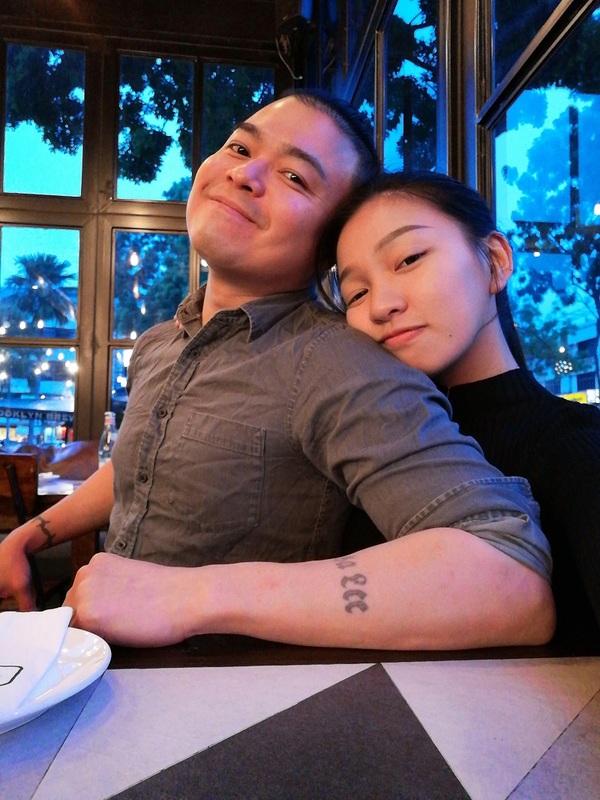 You have to be comfortable eating with your knees pressed against the person beside you and having the plump back of the person behind you rest against yours. ️ It’s that kind of place. I believe travel guides use “full of character” to describe places like this. The food was slightly unfamiliar but I liked the pork soup with plantains and the pork cooked in thickened pig’s blood. 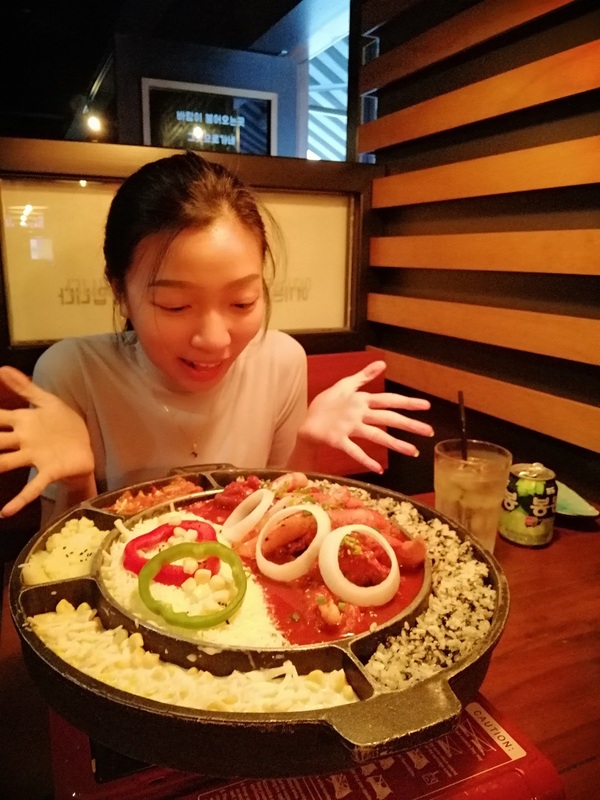  However, all of the dishes were cold. 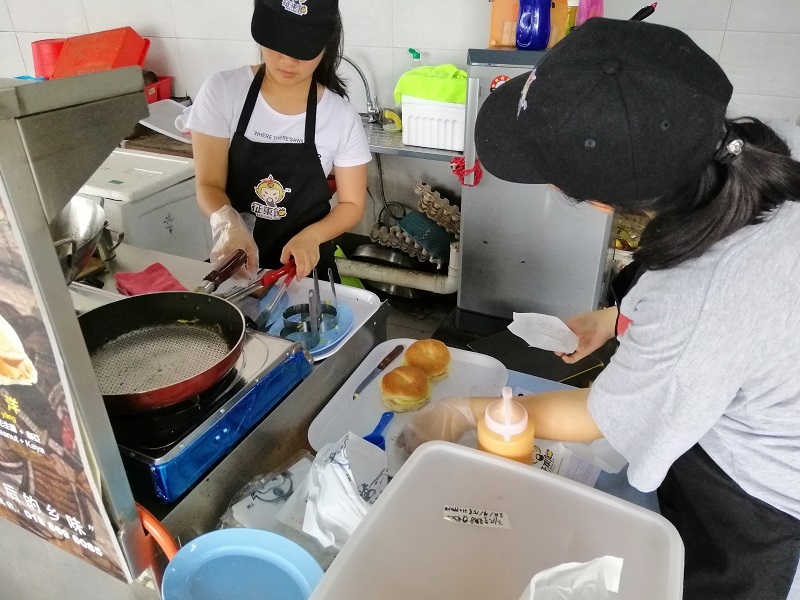 It would have been a lot better if they’re cooked to order, but this is a chap fan stall. 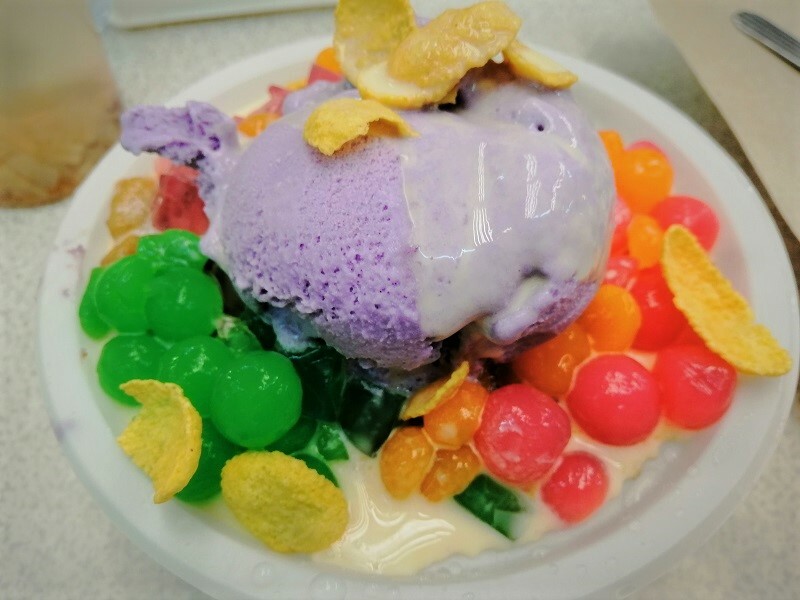 I also ordered a halo-halo.  I had halo-halo during my trip to Boracay in the Philippines and I enjoyed it very much. It’s a complex dessert with condensed milk, milk, coconut cream, yam ice cream, various jellies and a baked scorched milk custard. They go very well together and there’s so many textures going on, it’s like an adventure! Very nice. 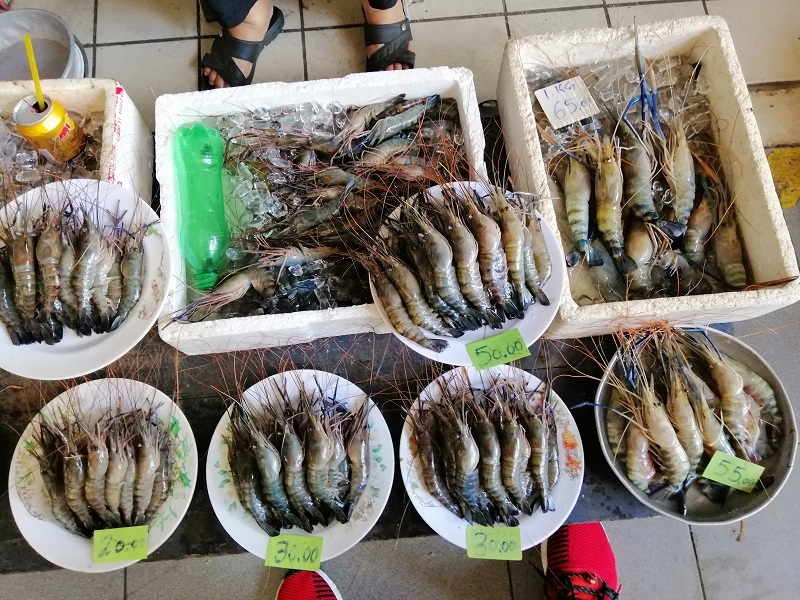 The bill came up to RM 112 for 6 pax, which is a surprise for this kind of stall. 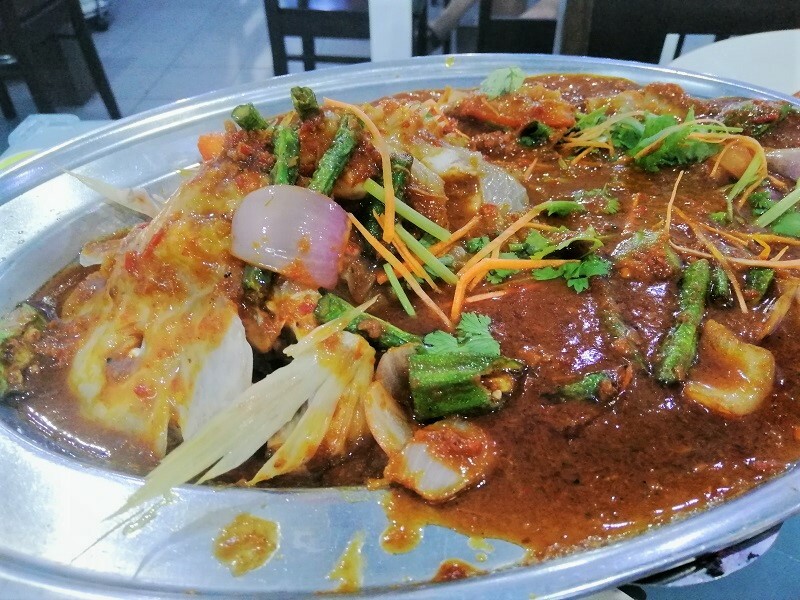  That works out to almost RM 20 per person – quite a lot for this type of dining experience. It was fun to experience the Philippines in the middle of KL though. 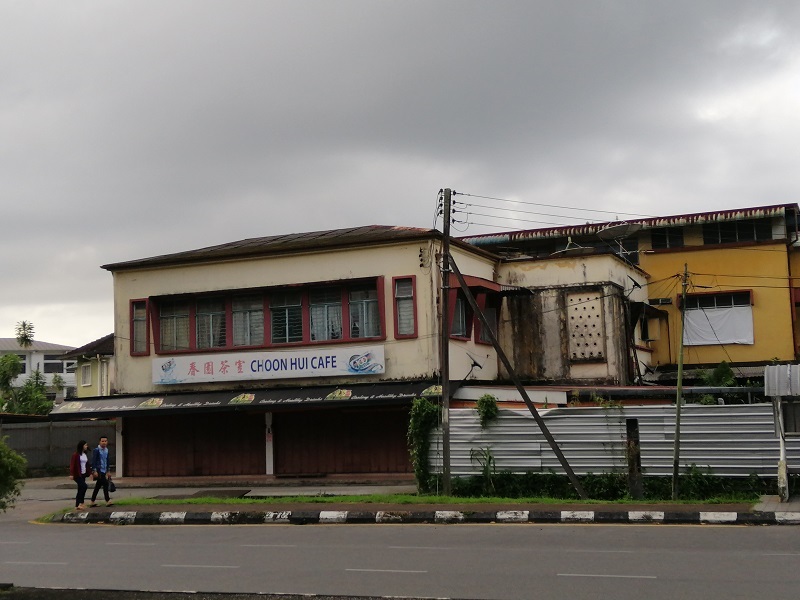 Kota Raya had many grocery stores selling imported food from the Philippines. I picked up several different flavors of Lucky Me! Pancit Canton. 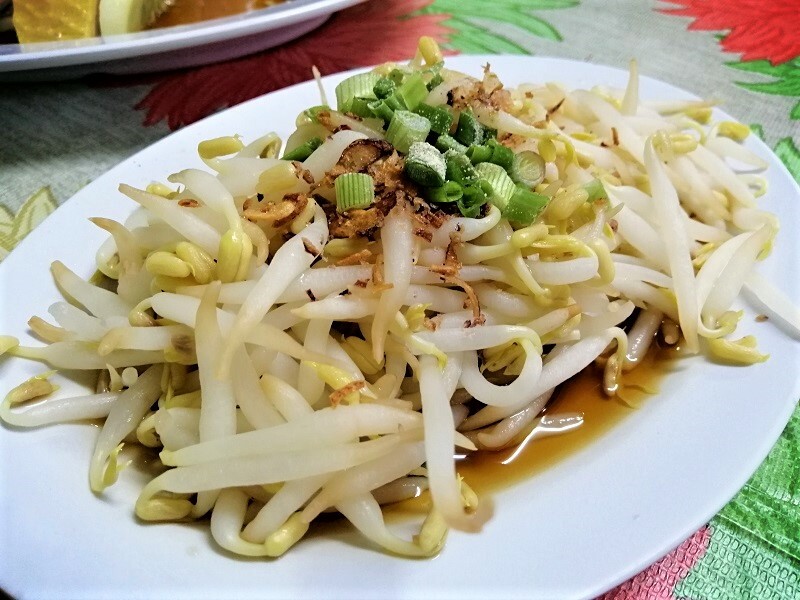  This is a dry noodle from the Philippines that I’ve heard a lot of good things about. 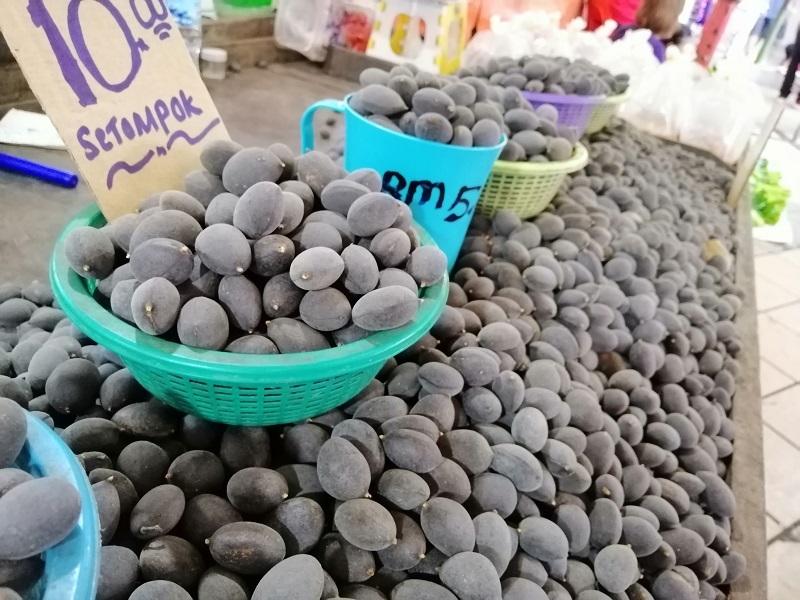 They’re selling it for around RM 11 per pack or RM 2 per packet. I tried the Lucky Me! Pancit Canton Xtra Hot Chilli Flavor that night. 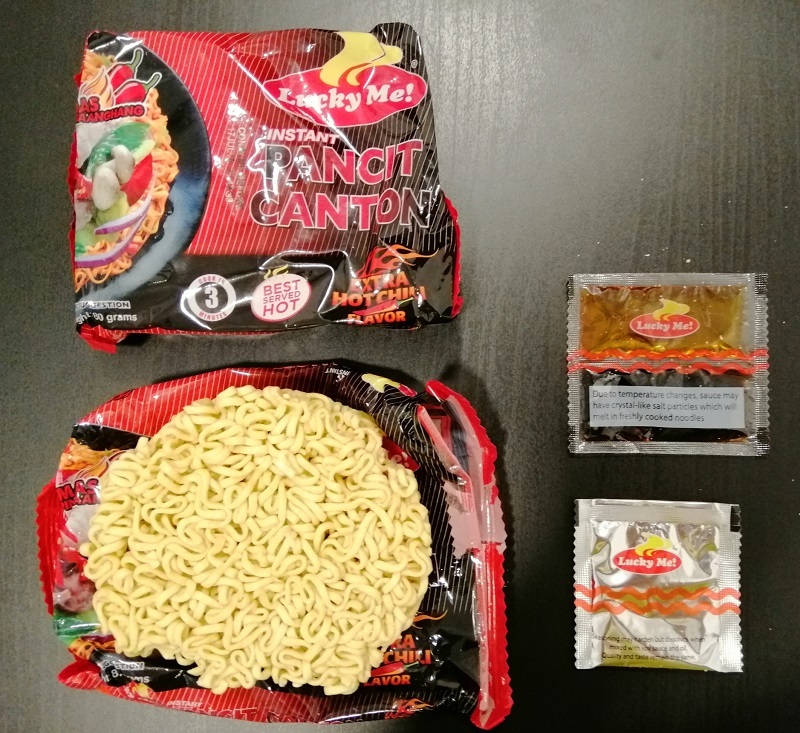 ️ Each noodle brick is 80 grams, similar to Indomie. There’s a powder sachet and a twin liquid sachet containing light soy sauce and chilli sauce. 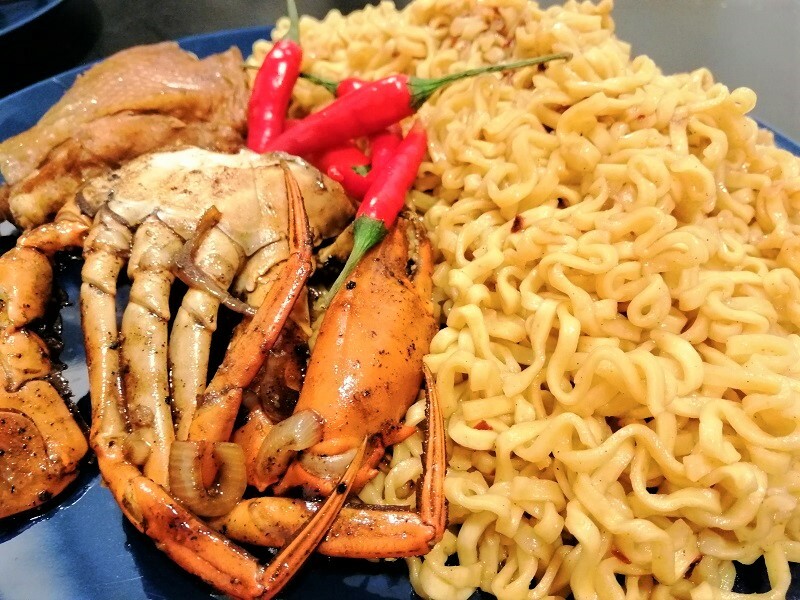 I ate 3 packets of Pancit Canton (literally Cantonese noodles) with the leftover crab and ayam pongteh. 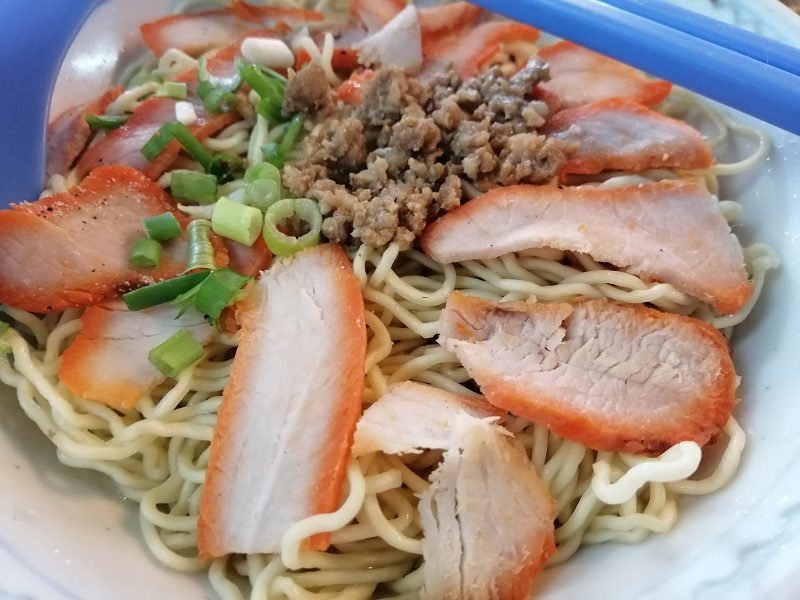  It was decent but light years behind the Indomie/Mi Sedaap benchmark, which I consider the best in the dry noodle class. I gave it a 6/10 and Mandy rated it 7.5/10. We both rate Mi Sedaap as 10/10. However, a Filipino commented on my Facebook the moment I posted my review to disagree.  He said he felt Lucky Me! 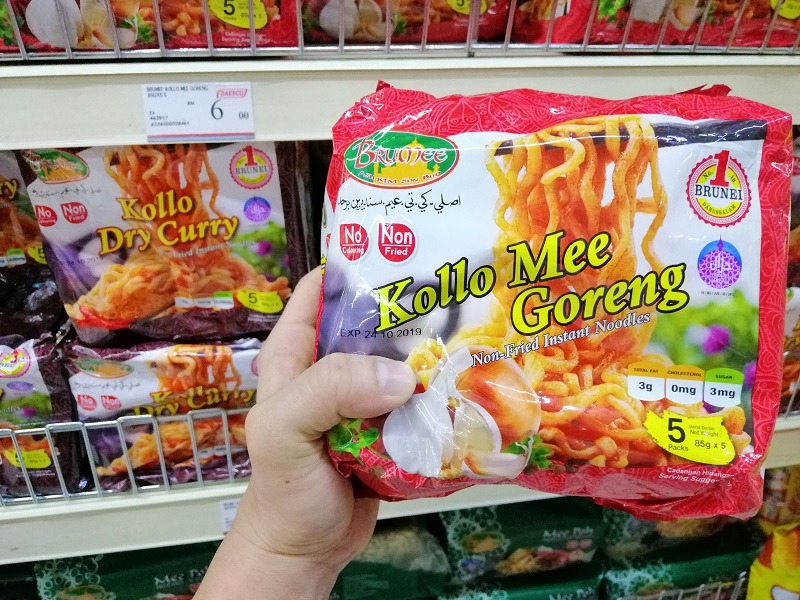 tastes better than Indomie and gave me some tips to improve the flavour, like adding 2 sachets of flavor to 1 packet of noodles. 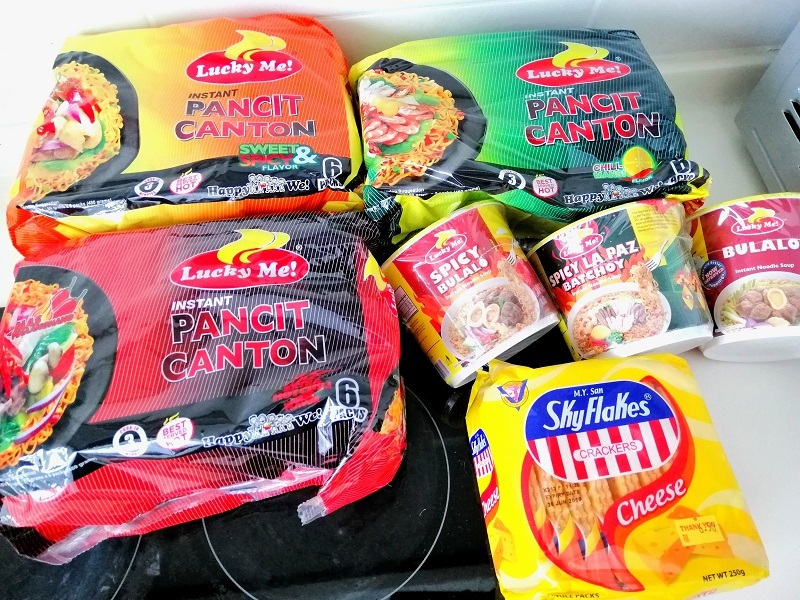 I like the loyalty Filipinos have to their home country but from a neutral taste perspective, Indonesia is still the king with their Indomie/Mi Sedaap duopoly. Haha. It is true. I have turned 38. The big 4-0 is looming close, practically nipping at my heels.  That said, I’m pleased to report that I still receive comments and messages expressing surprise that I’m 38. I hear I look youthful. Although, truth to be told, there are fewer of these remarks as I grow older. No matter. 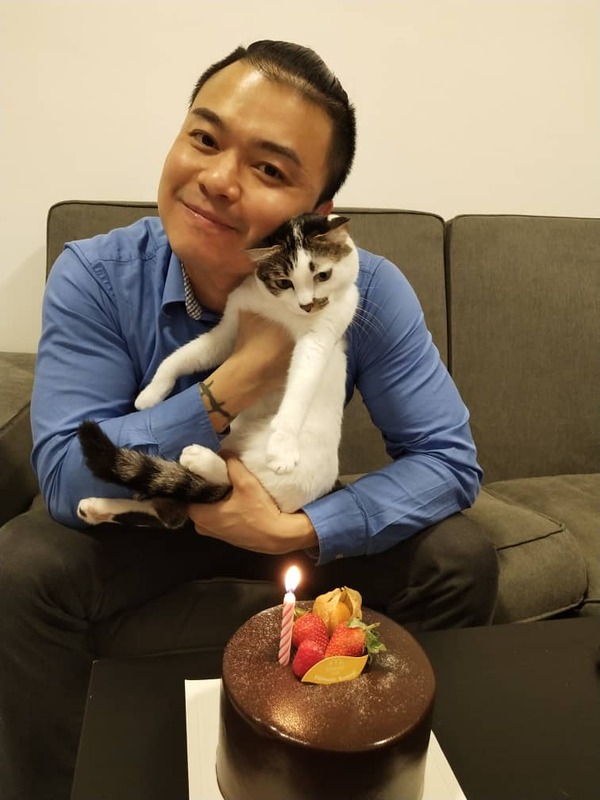 My (much younger) girlfriend gave me a birthday surprise when I got home last Friday. I already expected something coz she has been asking me strange questions the past week. She also called to enquire when I’ll be reaching home, which is quite suspicious. 樂 I told her I’ll be back 15 minutes later than I actually would and quickly barged in the moment I got home. Hahaha. I’m terrible. She was still in the midst of lighting a candle at that point. She later told me she planned to turn off all the lights but I unlocked the gate and ran in so quickly she didn’t have time to do so. 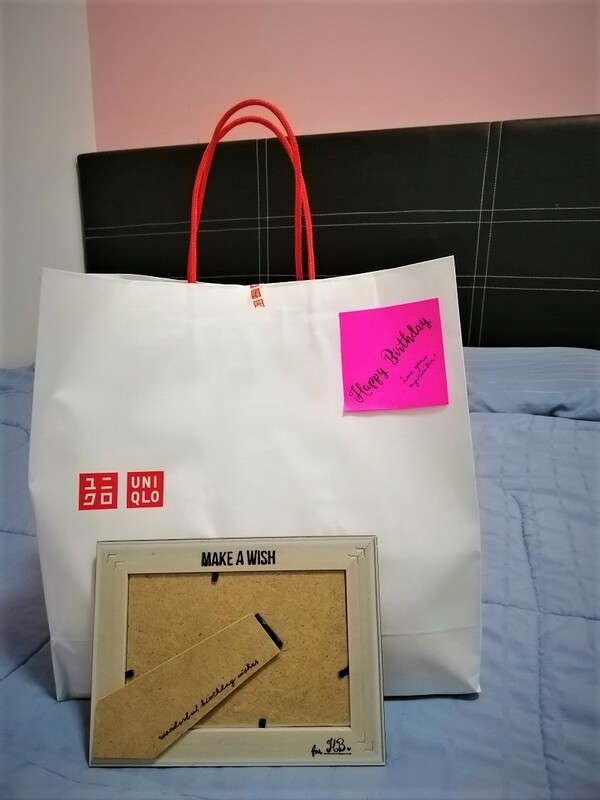  She also prepared a lot of gifts on my bed for me to discover! 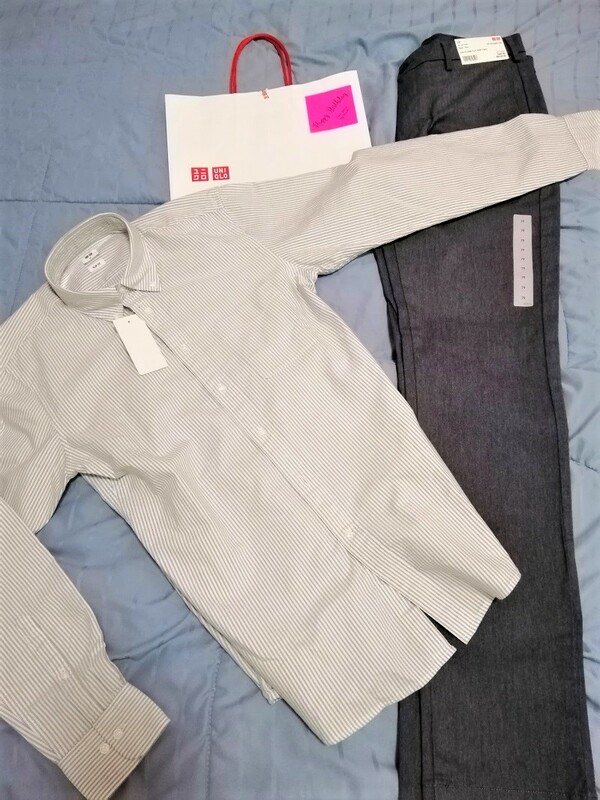 She got me dress pants from Uniqlo coz I tore 2 in a row at work. She also bought me a shirt so I have more options to wear. 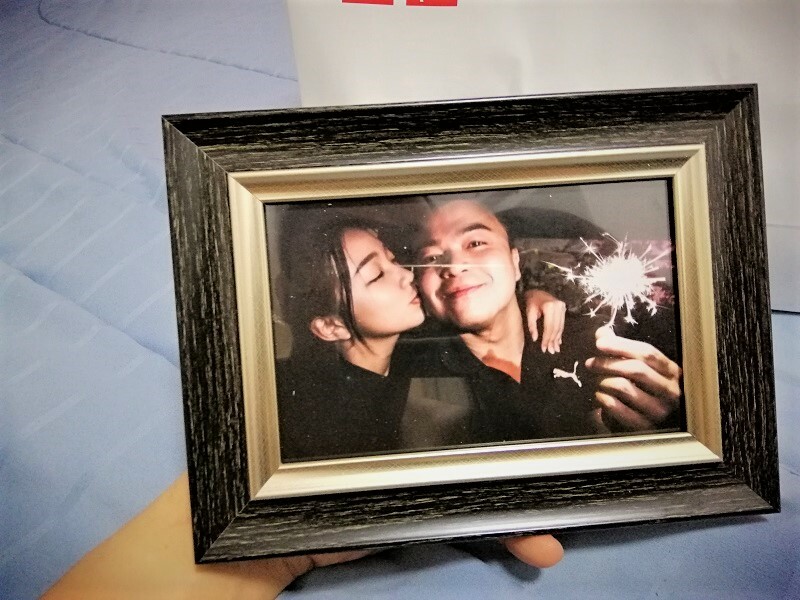 Mandy printed a photo of us she liked and got a frame so we can put this at the bedside cabinet too!  My cat periodically flattens this frame though so I have to right it every few days. She also cooked mayo prawns with condensed milk for me! 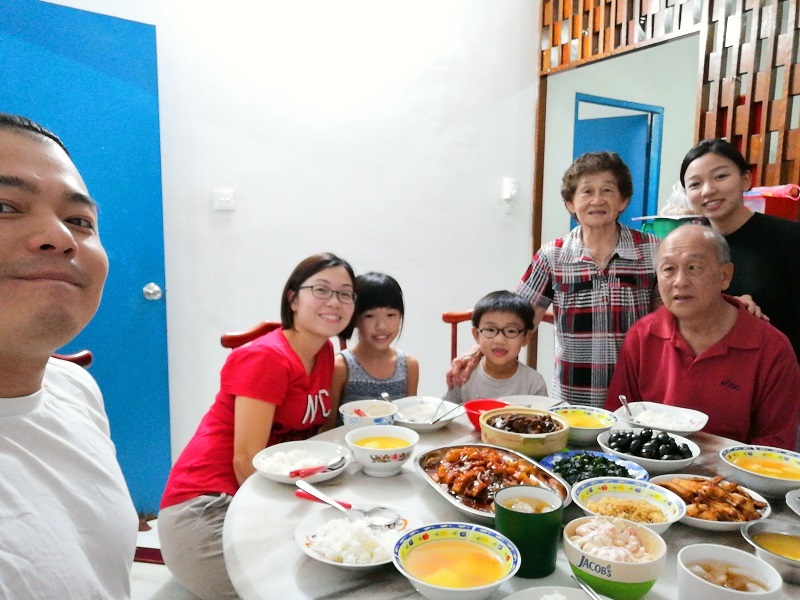 戀 That’s my grandma’s recipe that she asked for during our Chap Goh Meh trip to Sibu recently. It’s best paired with 3 packets of Mi Sedaap and century duck eggs. 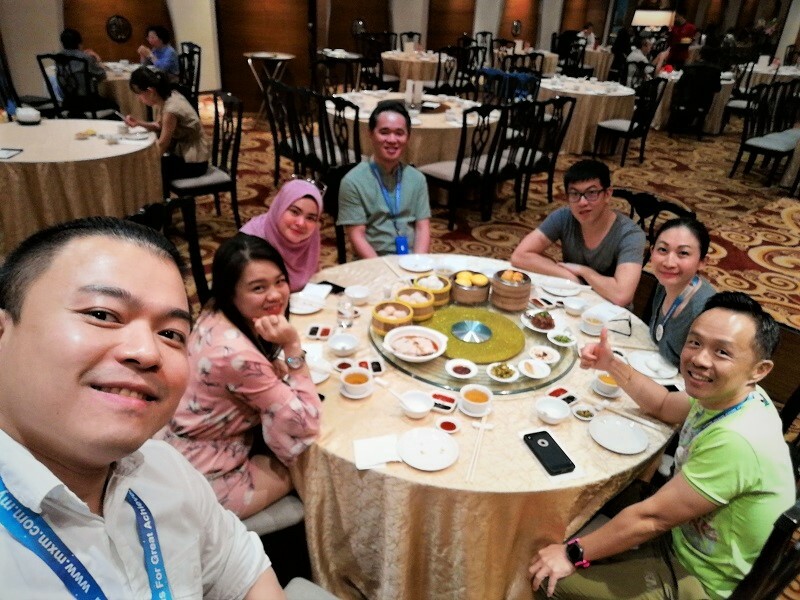 I had work the next day (Friday) and our boss Sam took the entire SPU team out for a dim sum lunch at Eastin Hotel. 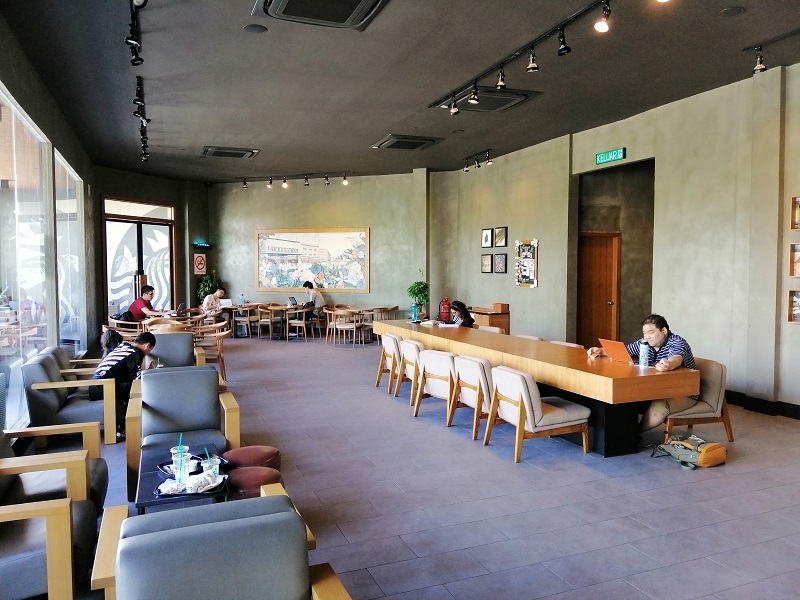 寧 Our office is in Phileo Damansara and there aren’t a lot of great food options here. Ee Chinese Cuisine in Eastin Hotel is definitely one of the better ones! 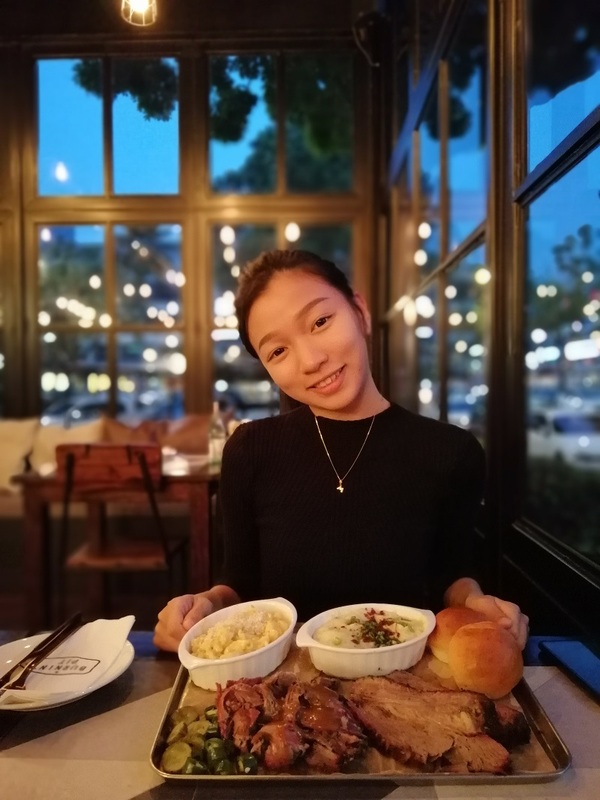 The restaurant is really nice and the food is great too! I ate till I was stuffed. I got to eat everything I wanted during my birthday weekend. Happy 38th to me!  Now to get back on my diet. I really stuffed myself last weekend. I hardly ever go to Desa Sri Hartamas nowadays coz it’s so far from my house. 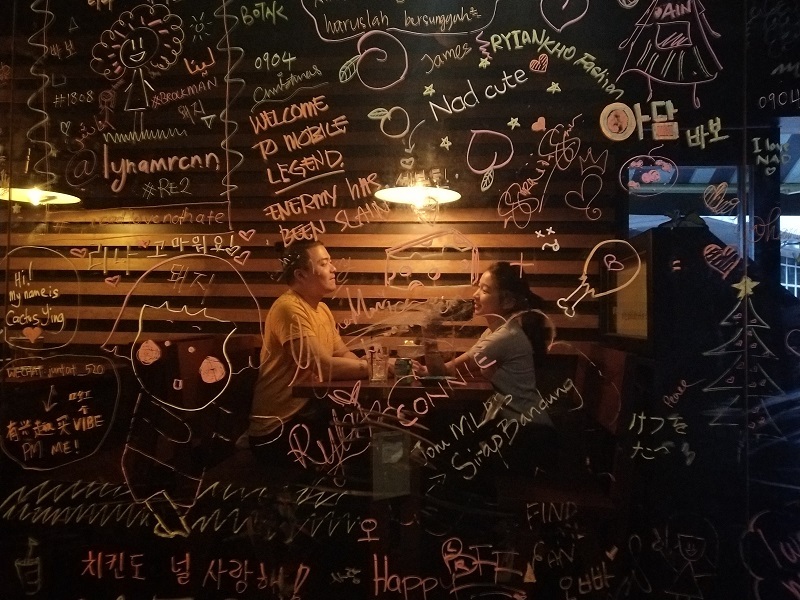 I like the place though – it’s a small community of Korean  and Japanese  expats and the F&B options there reflects this unique demographic. Our dinner plans for date night was to start out at The Café Chicken for Korean Fried Chicken. This was previously named WOW Chicken. I was misled by Google into thinking The Café Chicken was still open. Upon venturing up to the dingy first floor, I popped my head into a dodgy bistro and asked where it was. One of the staff inside told me it’s permanently closed.  We walked around the area and Mandy suggested Burnin’ Pit. 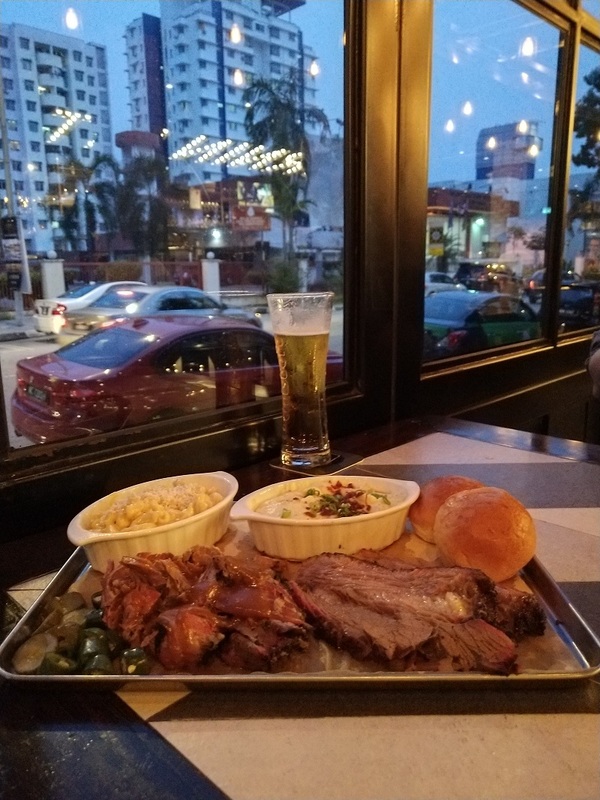 Burnin’ Pit serves Texas style BBQ – a variety of meats grilled low and slow. 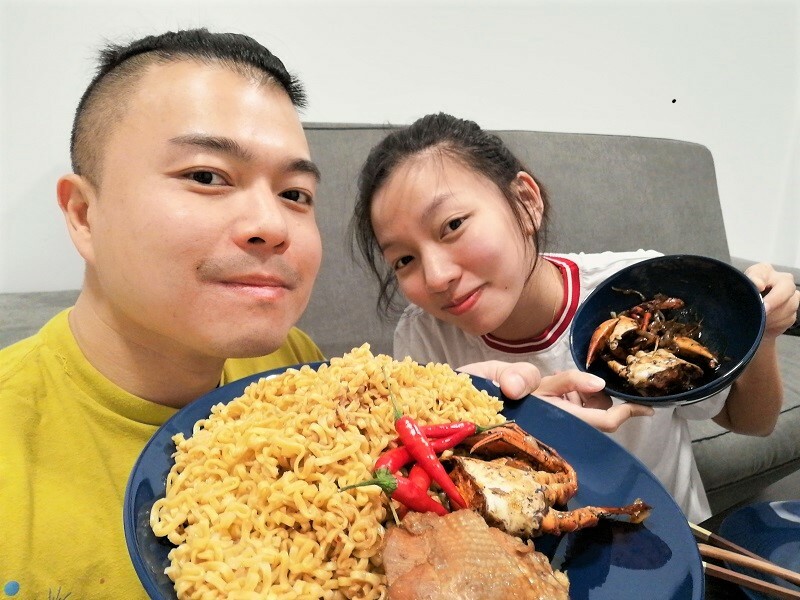 Mandy ordered pulled lamb (RM 22/100 g – 200 grams minimum order)  and I went for their beef brisket (RM 22/100 g – 200 grams minimum order) . 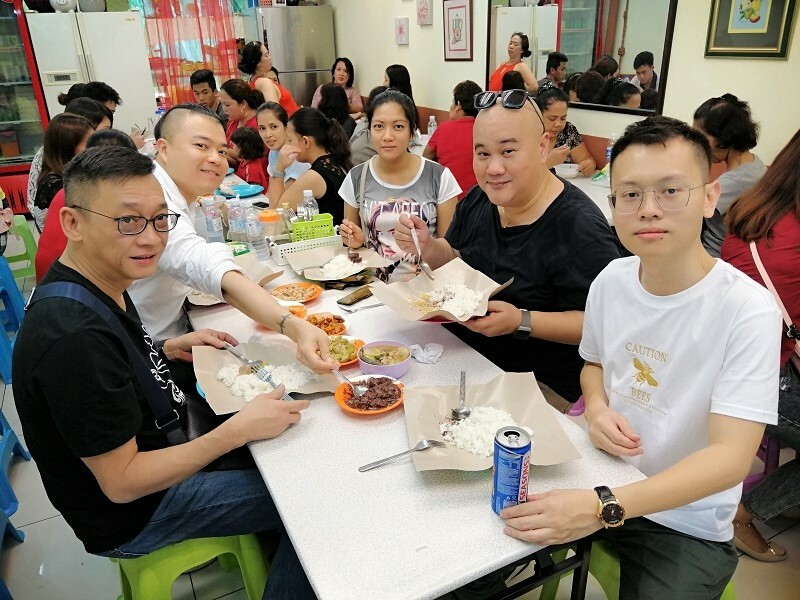 We also got one side each – Mac and Cheese (RM 7.50) 燎 and Mashed Potatoes with Beef Bacon (RM 7.50) 凜. The beef brisket was nice and smoky and we also enjoyed the pulled lamb. The sides were a bit meh but edible. They also gave us 2 complimentary buttery dinner rolls (good). Overall Burnin’ Pit’s meat products were good. 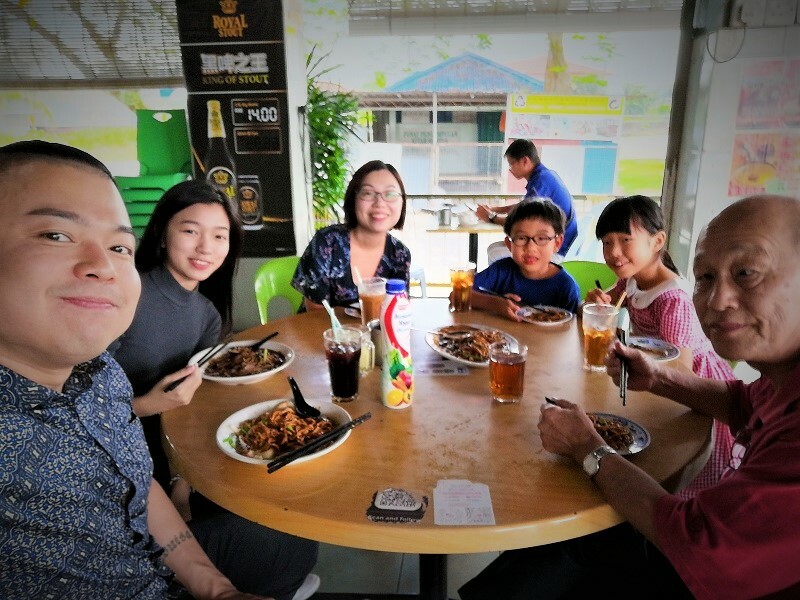 I wanted to try their percik chicken but we were too stuffed from our order. 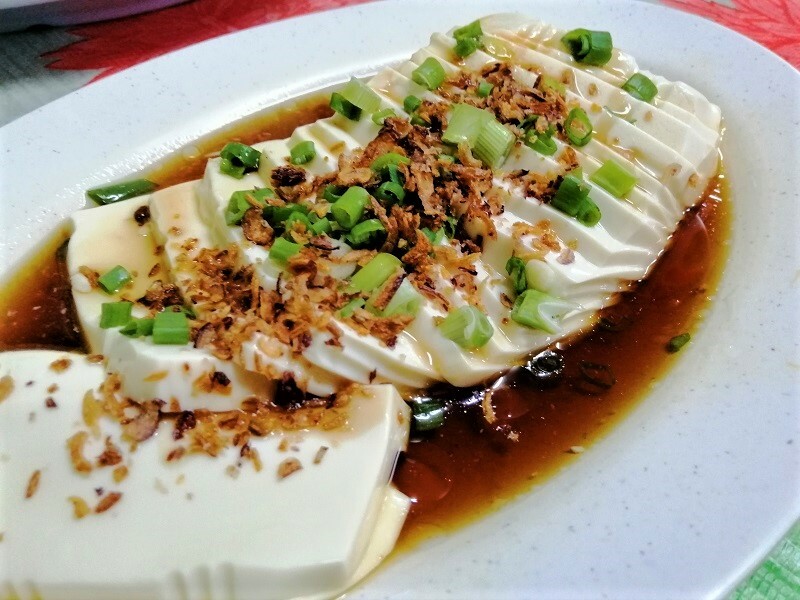 Everything was so rich and heavy – even the sides were laden with cream and cheese so you can’t eat a lot without feeling jelak. Service was prompt and attentive. 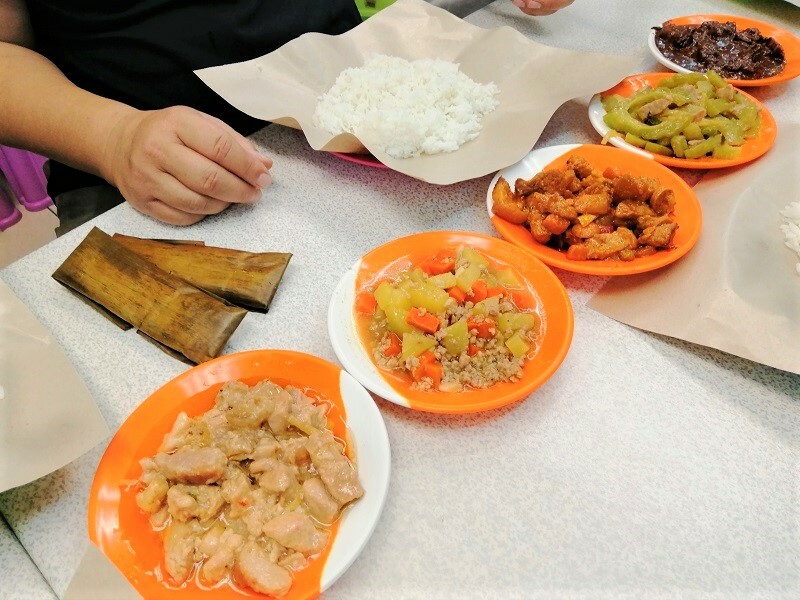  The prices were a little on the high side– our bill came up to RM 129.40 – but reasonable for the area and food. After dinner, we headed over to The Ice Cream Bar for dessert. This is run by Inside Scoop but under a different brand so they can do non-halal flavors. They did a partnership with Singleton (the single malt whisky) to produce a range of Singleton Select flavors. 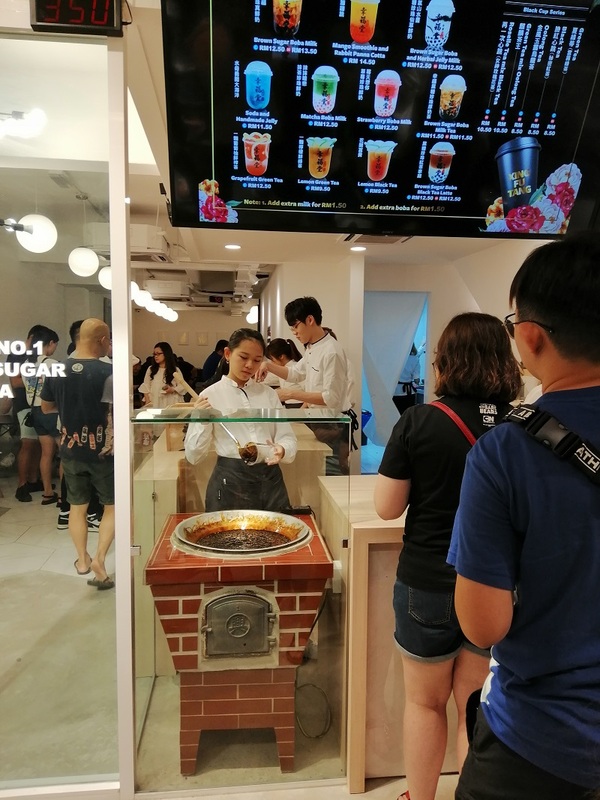 弄 They have a lot of alcoholic ice creams on offer, and they taste really good too! 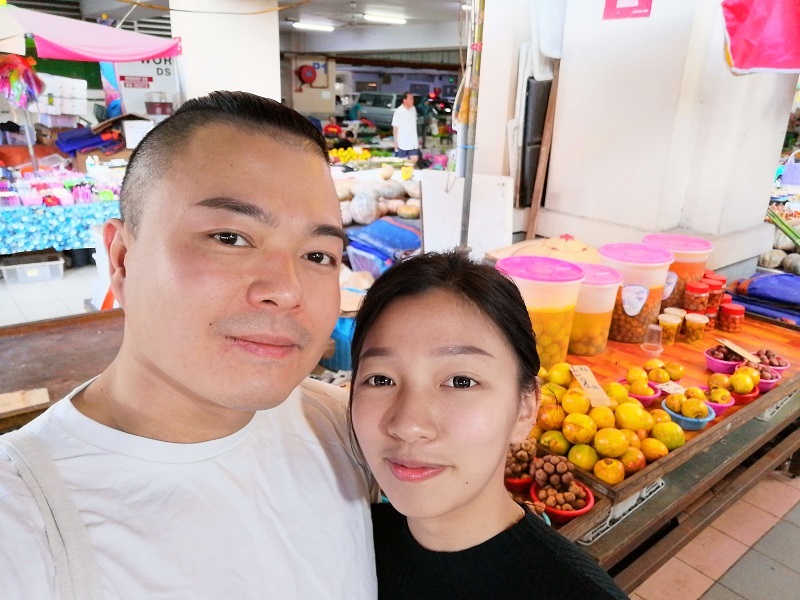 Since we’re in Desa Sri Hartamas, I thought a visit to a Korean grocery shop was in order. We walked around and Mandy bought a melon milk drink priced at a staggering RM 10 for a small bottle. 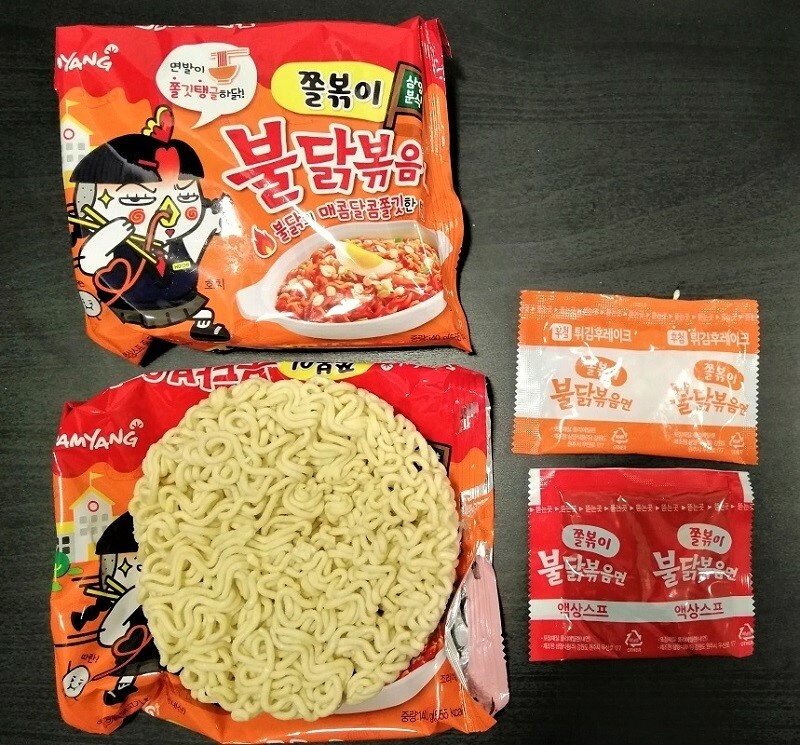  I found the new Jjolbokki Buldak Bokkeum Myeon by Samyang at a more reasonable RM 22.40 for a pack of 4. I also picked up a really cheap box of Korean jjajang mixture for RM 7.50. 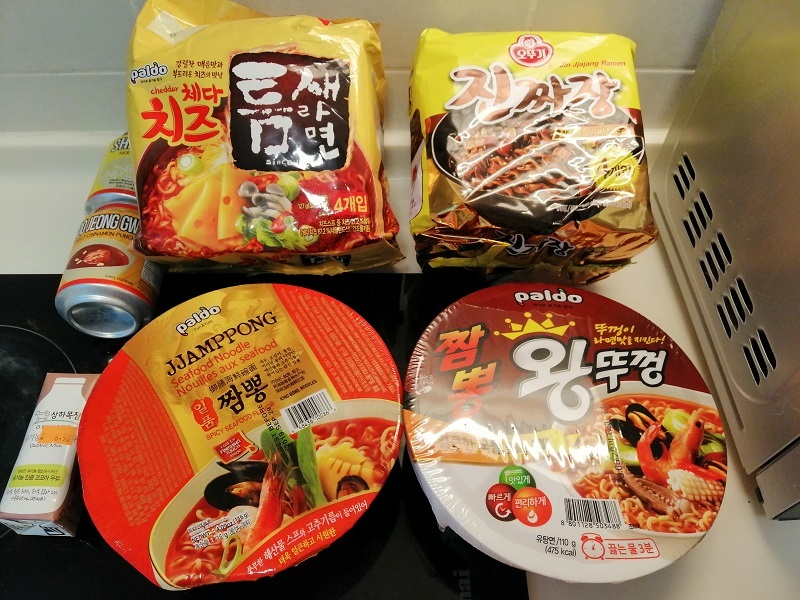 I cooked two packets of the Samyang Jjolbokki Buldak later that night.  Wow. Just wow. I eat Samyang new releases without fail coz I love instant noodles but I mostly left unimpressed. The only recent one I liked was Samyang Jjajang last year. 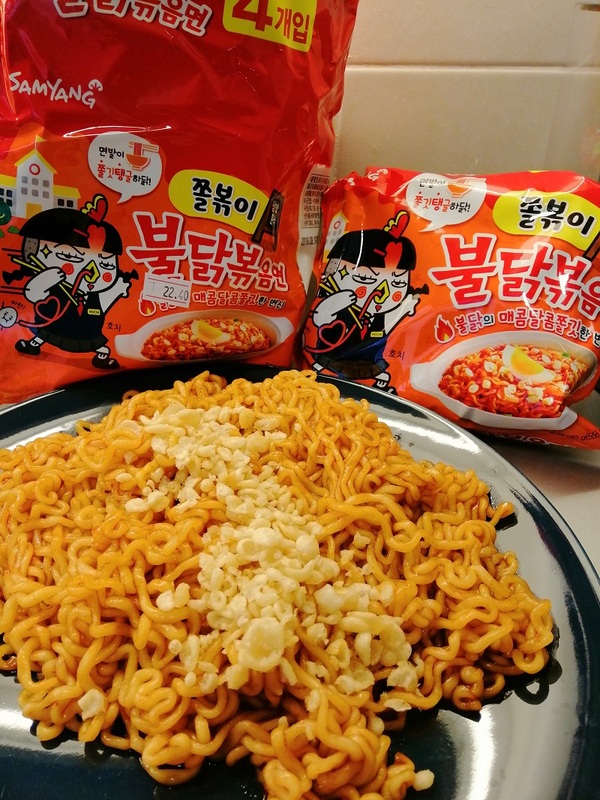 But none left a huge impression on me until Samyang Jjolbokki – the noodles are insanely chewy! It’s so textural and pleasurable to eat. 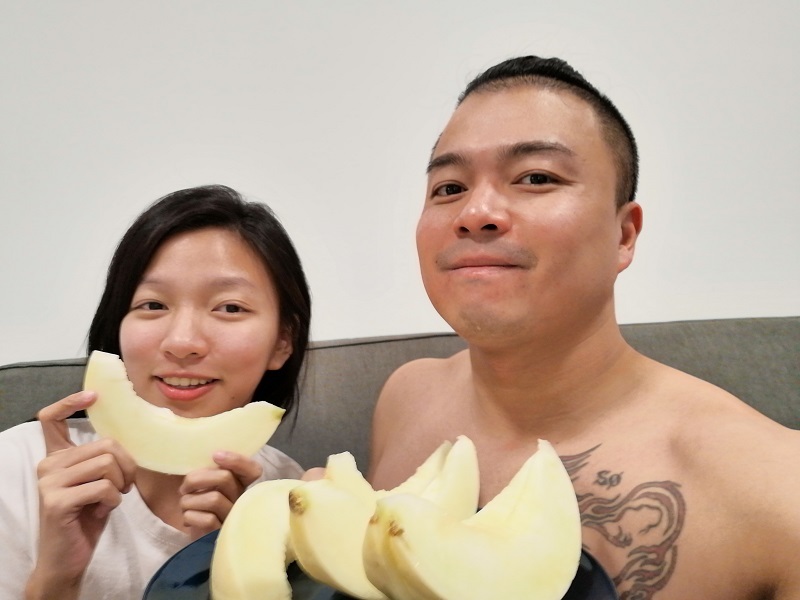 Nyum nyum nyum. 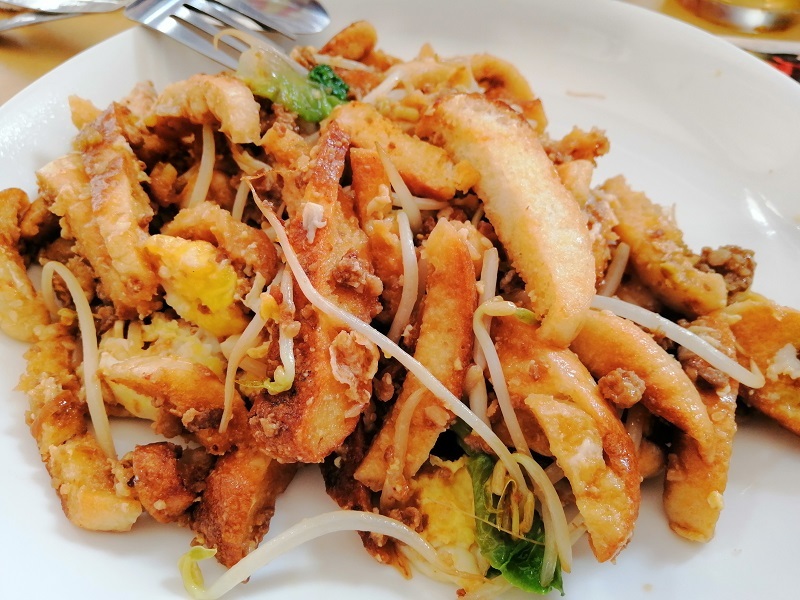 The crispy fried chicken cracker topping tastes like Mamee Chicken and goes so well with the gummy noodles. It’s a non-stop mochi party in your mouth! I need to get more of this. 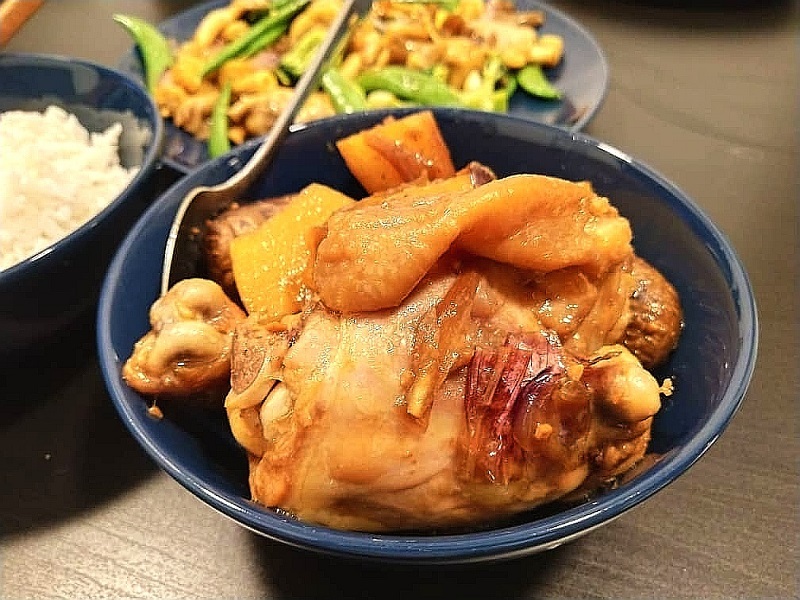 Sunday was my cooking day and I made a huge pot of ayam pongteh with 4 kg of chicken legs.  I haven’t made this in a long time and I’ve been craving for it. 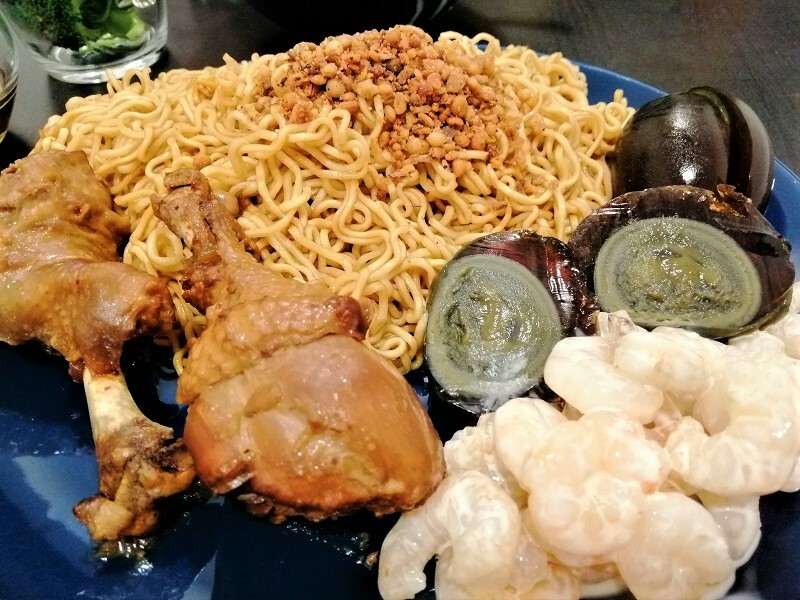 I fried lots of shallots, red onions, garlic and Bombay onions in sesame oil before adding potatoes, taucu (fermented bean paste), dark soy sauce, sucralose, fish sauce and chicken stock. I also chopped the chicken legs into drums and thighs so it’s easier to store. 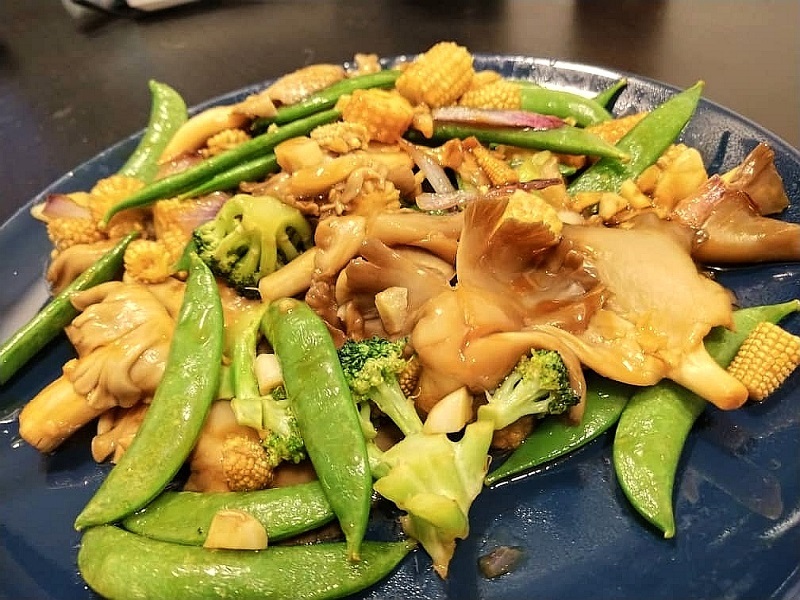 Mandy wanted some vegetables so I cooked a medley of green peas, baby corn, broccoli and oyster mushrooms in oyster sauce.  I really liked how this turned out. I only pan fried them for a while so everything is still crunchy and fresh. 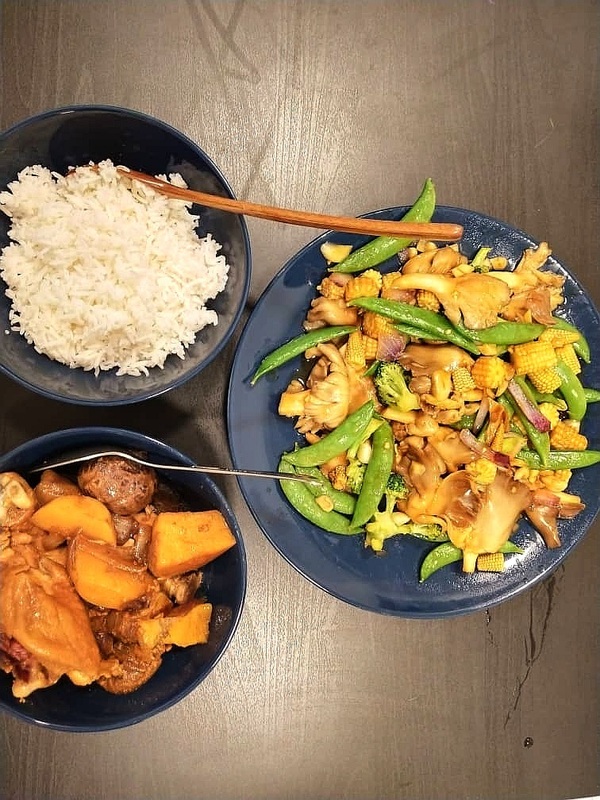 The oyster mushrooms tasted really savory and umami! The chicken was good too but overtly oily. You need to skim the top of the bowl coz there’s an oil slick there after cooking this amount of chicken. 4 kg of chicken can make the pot look like the Exxon oil spill! ️ However, it’s hard to do when the gravy is still hot and solid. I usually do it the next day after it’s been refrigerated – the fat rises to the top and solidifies, making it easily skimmable. 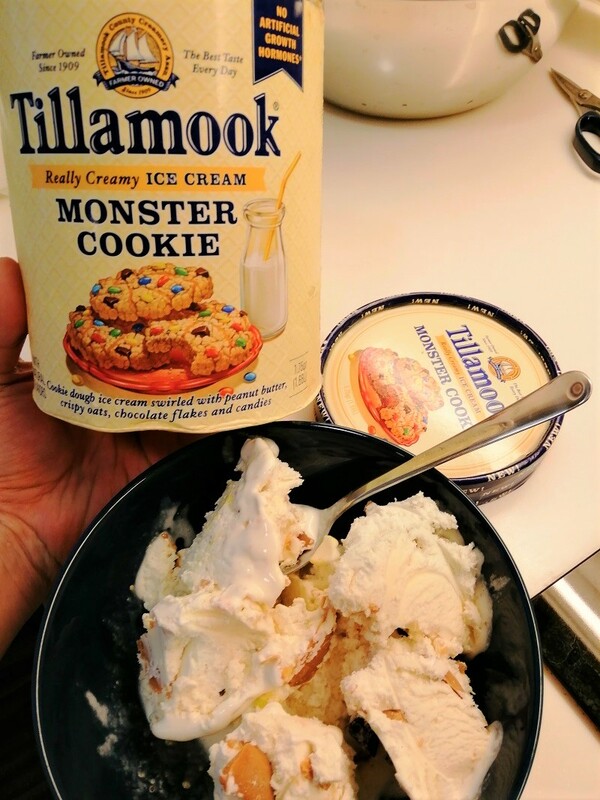 We ended dinner with Tillamook Monster Cookie ice cream.  This is a delicious concoction of cookie dough ice cream, salty peanut butter, crispy oats and M&M type candies. I’ve been indulging a bit too much though. Mandy assures me I’m not fat but I think she has a secret agenda to make me overweight and unattractive. I need to diet stating today. All the restaurants above have at least 1 Michelin star. 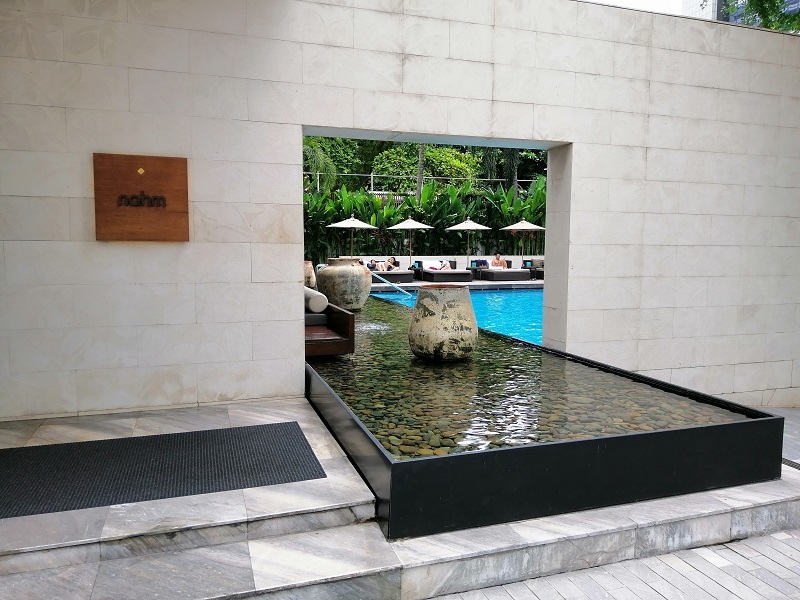 Gaggan and Waku Ghin has 2 Michelin stars. You can read more of my Michelin star reviews here. 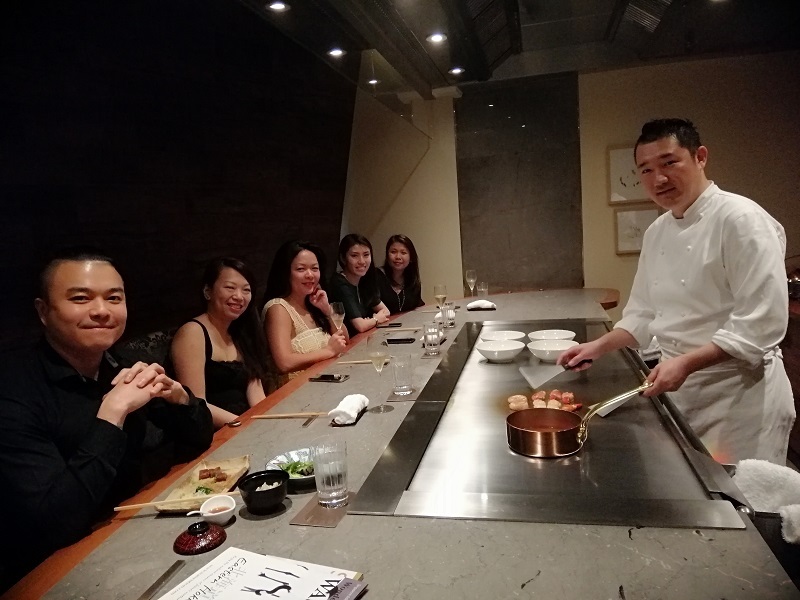 My Michelin star restaurant reviews are mostly in Singapore and Bangkok but there are some from Japan (1 Michelin star Isezushi in Otaru, Sapporo) and Paris, France (2 Michelin star Le Relais Louis XIII) whenever I go on vacation. 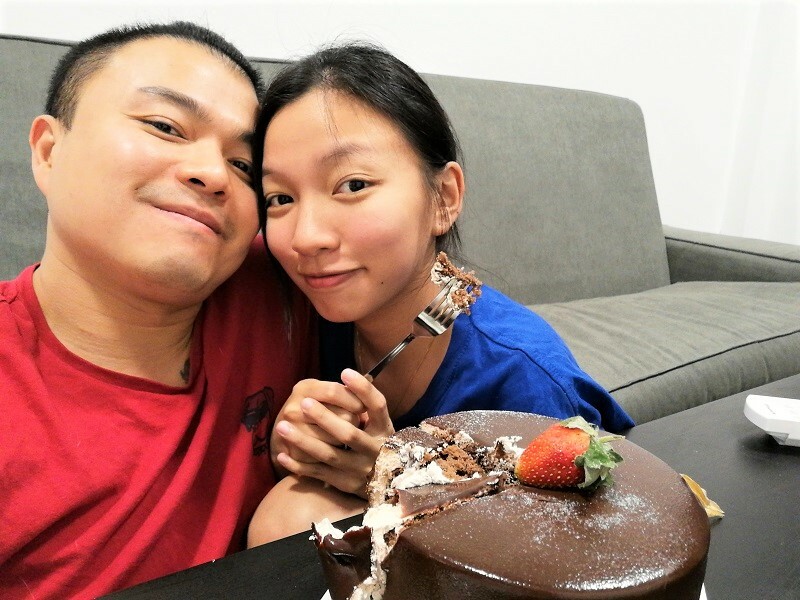 My birthday is coming up next week, so what better time to check out Dewakan? 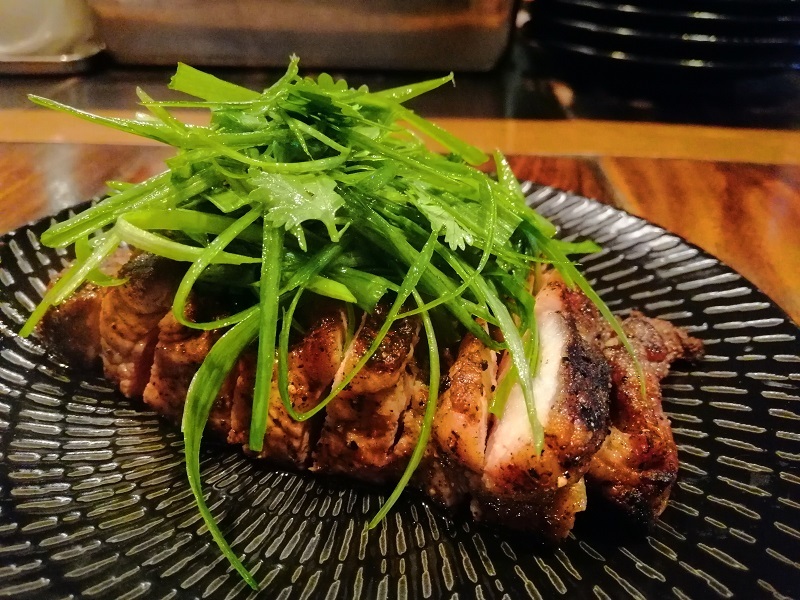  Psst…this is my real birthday this time , not the “birthdays” I’ve enjoyed multiple times at places like Shinji by Kanesaka. 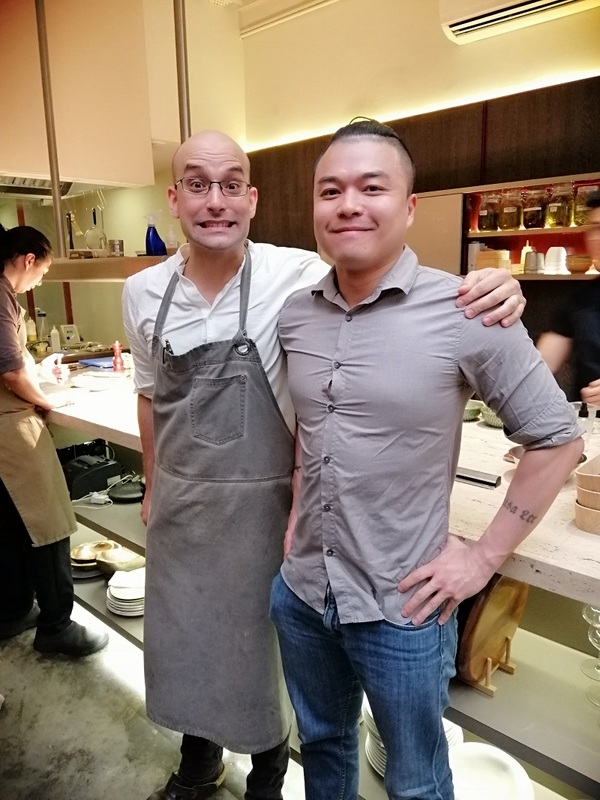  I’ll report back with a full review of the food at Malaysia’s first restaurant to be listed in Asia’s 50 Best Restaurants! The other restaurants on the list are all very solid, so I’m looking forward to it. 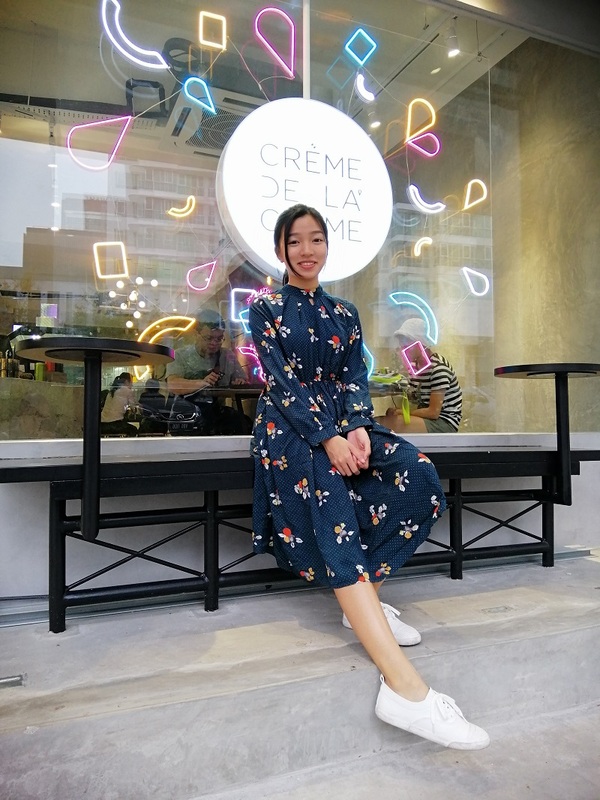 Mandy loves unicorns and desserts so I thought Crème de la Crème (CDLC) would be the perfect spot for our weekend date night. 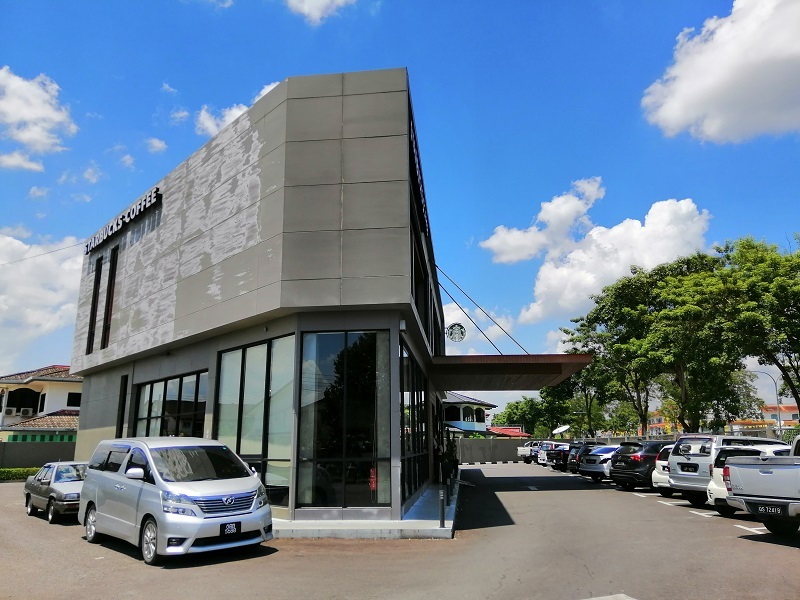 This is a new place that just opened a few days ago in Damansara Uptown. 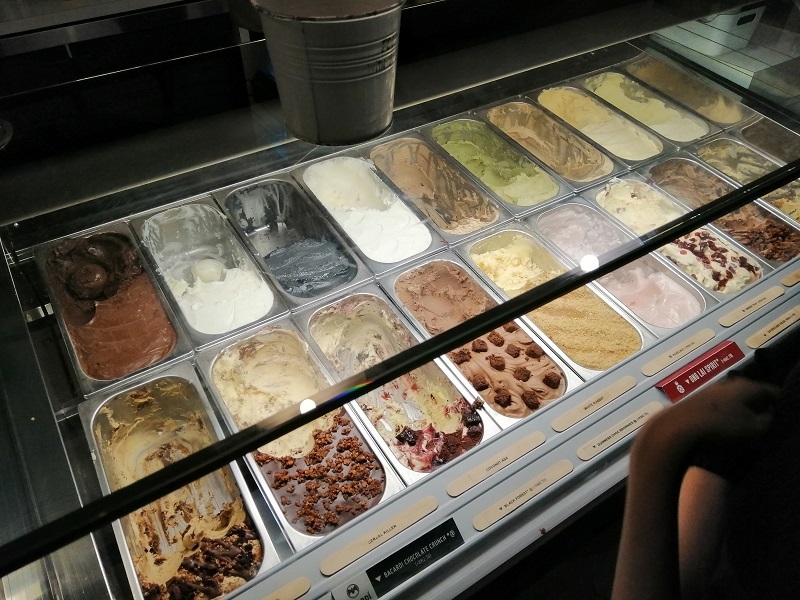 They’re a specialty ice cream shop with handcrafted ice cream made in-store. We actually popped by during dinner time so we could try these frozen delights when we’re hungry. 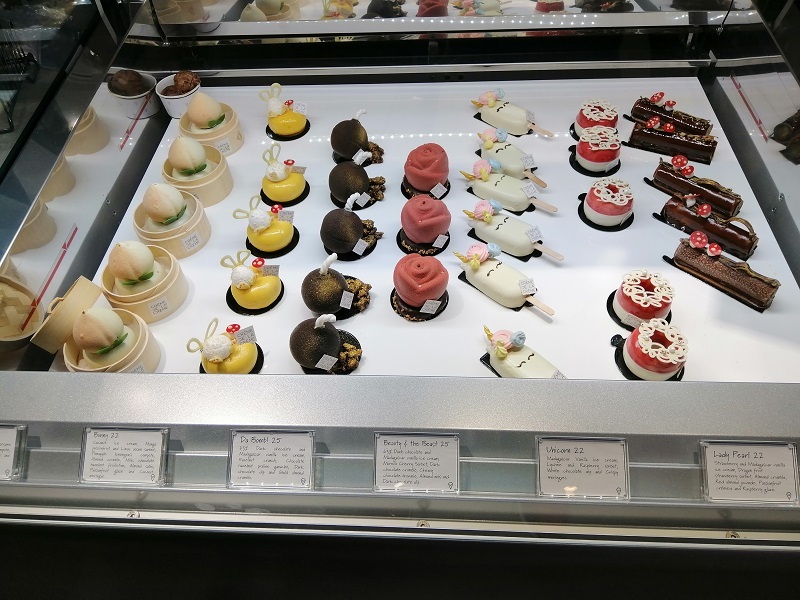 They have an interesting range of creative ice cream desserts from Beauty and the Beast (a rose shaped dark chocolate and Madagascar vanilla ice cream creation) to Da Bomb (which is shaped like one of those antique spherical bombs with a fuse running from the top). They’re all very beautiful and no doubt crafted for the Instagram crowd. 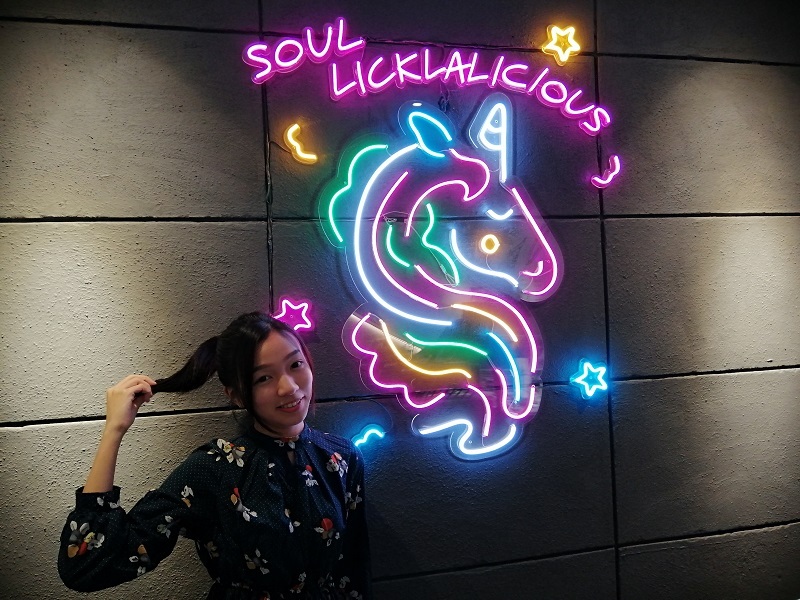 Mandy chose Unicorn (RM 22) – a Madagascar vanilla ice cream with lychee and raspberry sorbet, white chocolate dip and a pastel meringue. 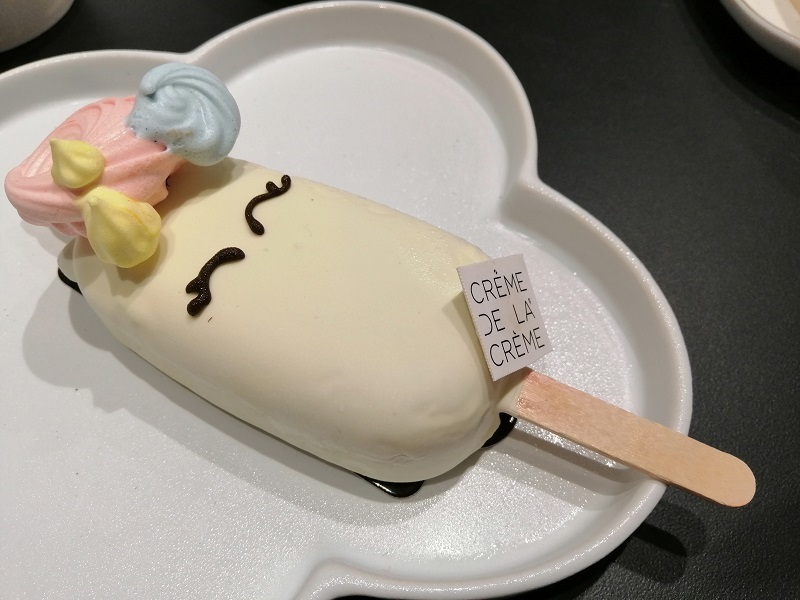 It looks like a very pretty Magnum, and I like the eyelashes, which really brings this unicorn together. The vanilla is good, contrasted by the sour sorbet components. 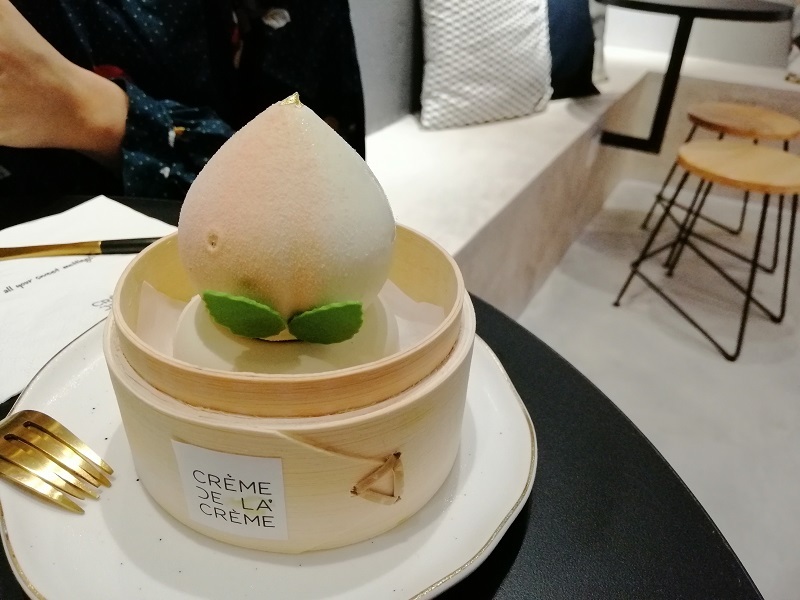 I went for the Longevity (RM 25) – Japanese matcha and black sesame ice cream with mango yuzu compote, lemon curd, matcha sponge and white chocolate dip. This reminded me of the bao that came out in Pixar’s recent animation. 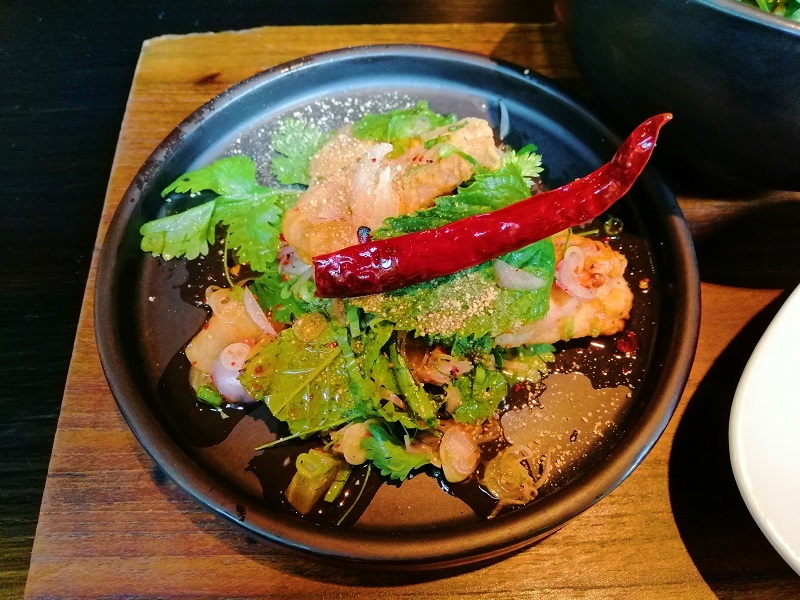 The Oriental components work well together but I’m not the biggest fan of black sesame – would not have ordered it if I had bothered reading the description. I’ll be the first to admit I choose based on presentation. Haha. 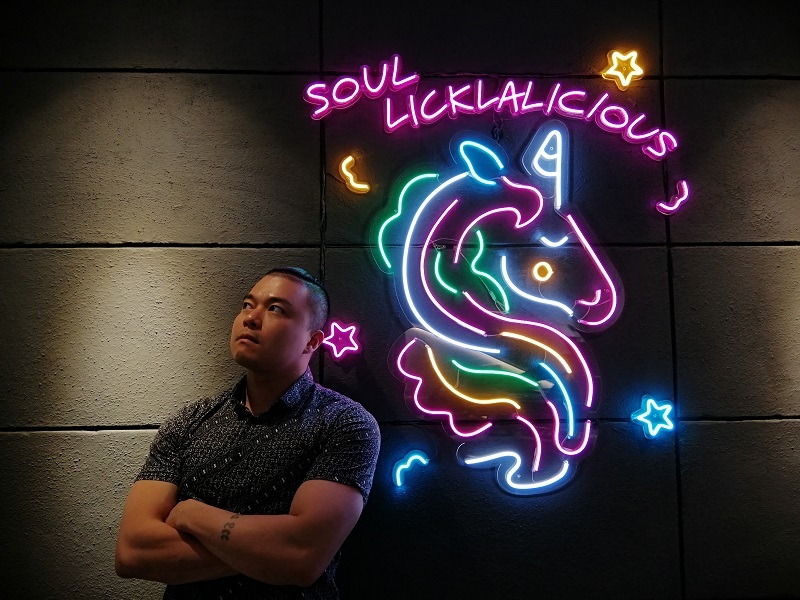 We wanted to try their Unicorn Drink (RM 18) but it was sold out on that day. 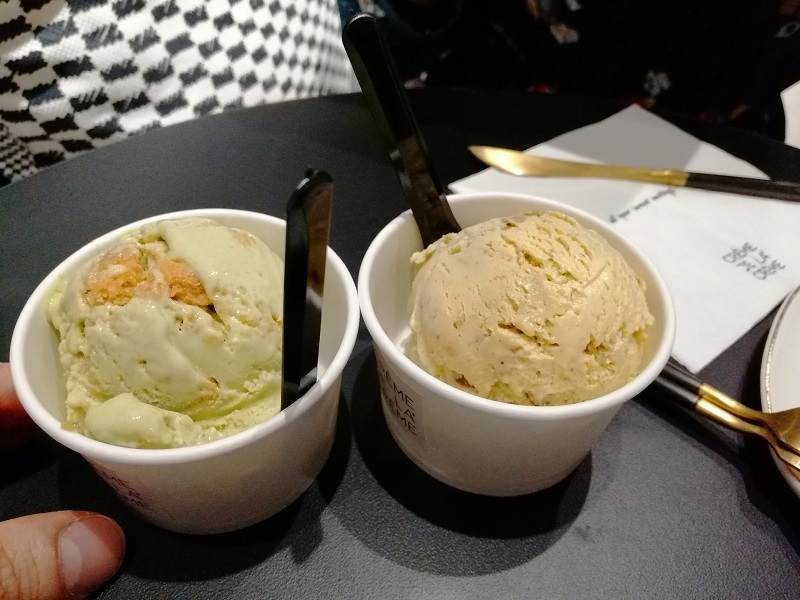 We both didn’t want coffee coz it was late so we had another dessert instead – two scoops of ice cream! I chose Roasted Pistachio (very good and burnt tasting) and she had Kaya and Toast (the bread bits are super crunchy). I really liked their store made ice cream. 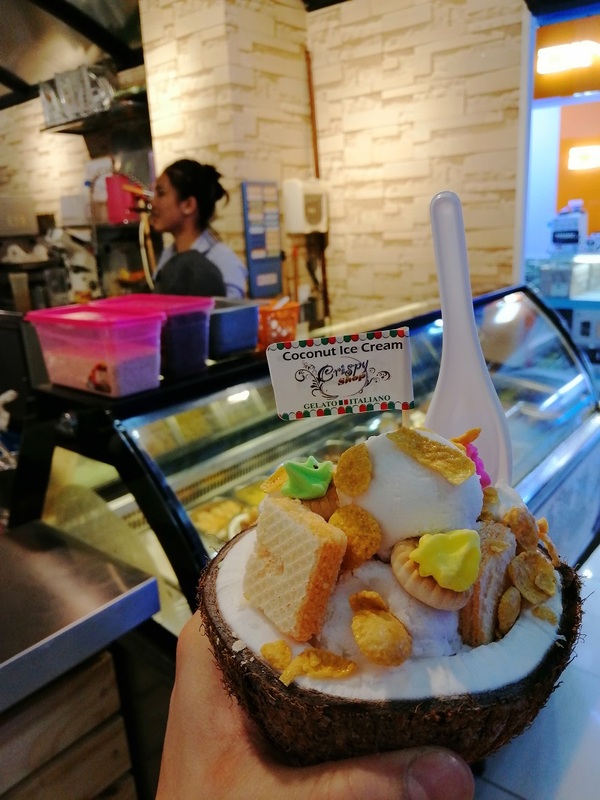 They have very different flavors and local twists and the ice cream is well made. I particularly enjoyed their roasted pistachio. The burnt and toasted notes really come through. It’s a flavour profile I really enjoy. 10/10. 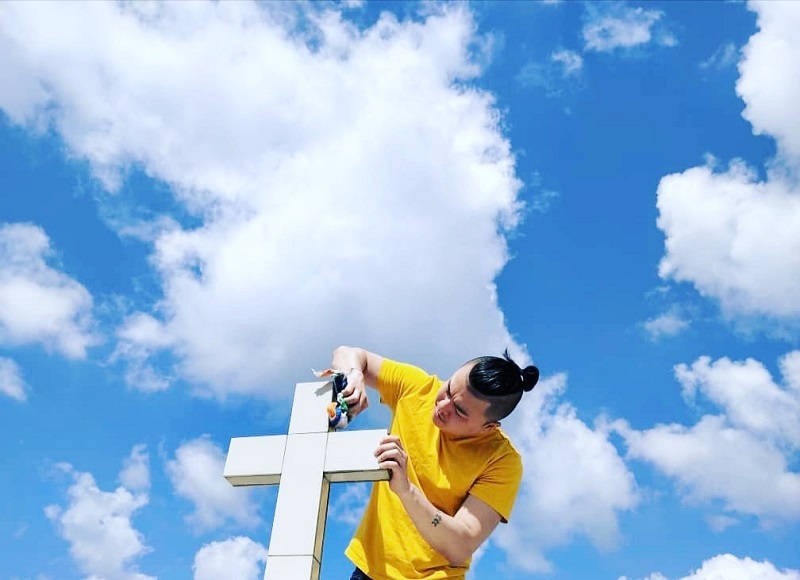 There are lots of spots where you can take photos for the ‘gram too. 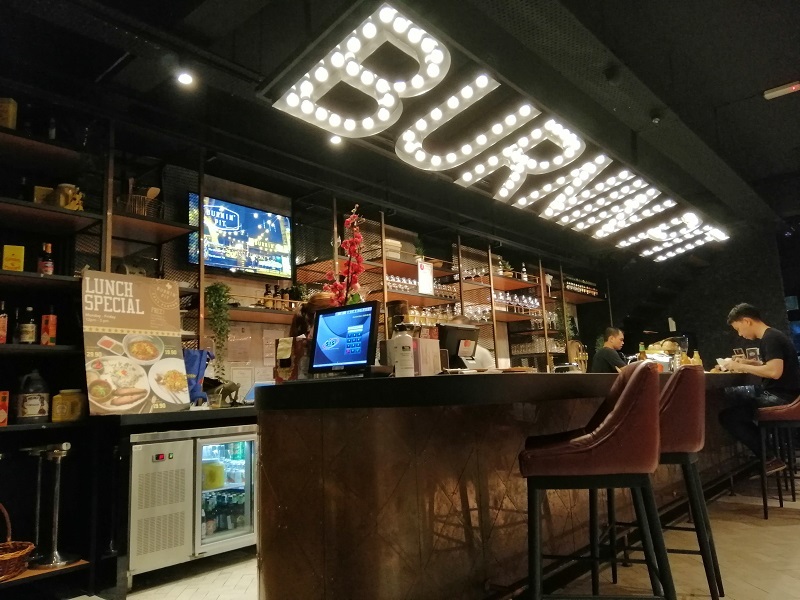 Most new F&B spots prioritize these feature walls nowadays. The bill came up to RM 76.10. Not cheap for a dessert outing but on par with similar establishments. 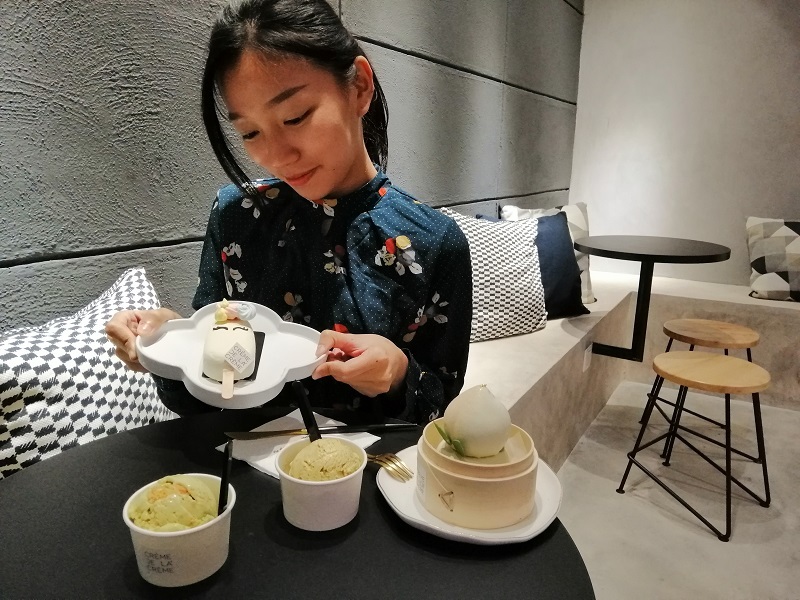 We ordered a little too much and it was cloying to eat so much sweet stuff but sharing one of their mini ice cream cakes or having a scoop of ice cream each would have been perfect! We needed something salty after that (and we haven’t had dinner) so we headed to Burger Mbira around the corner. This place has good reviews and I read an article that (falsely) claimed Burger Mbira makes their own patties. 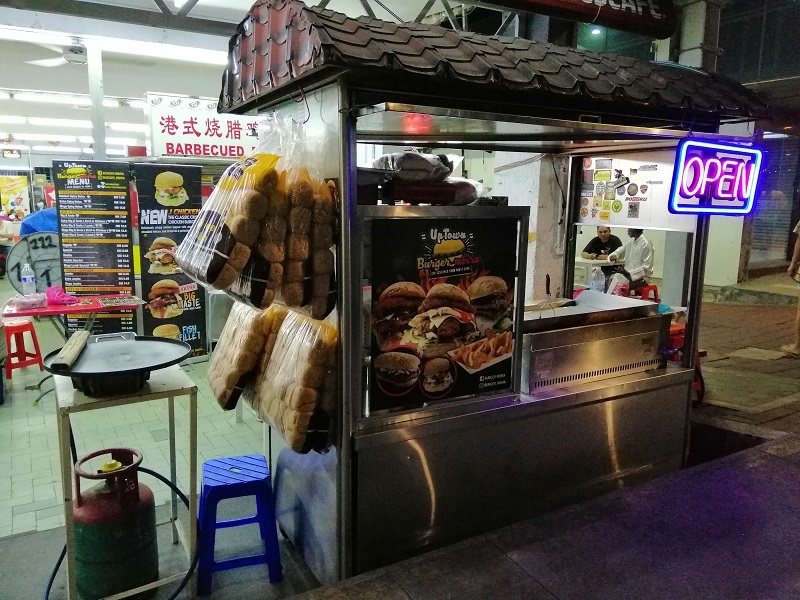 This is untrue – they use Ramly beef burger patties as can be seen by the stack beside their grill. 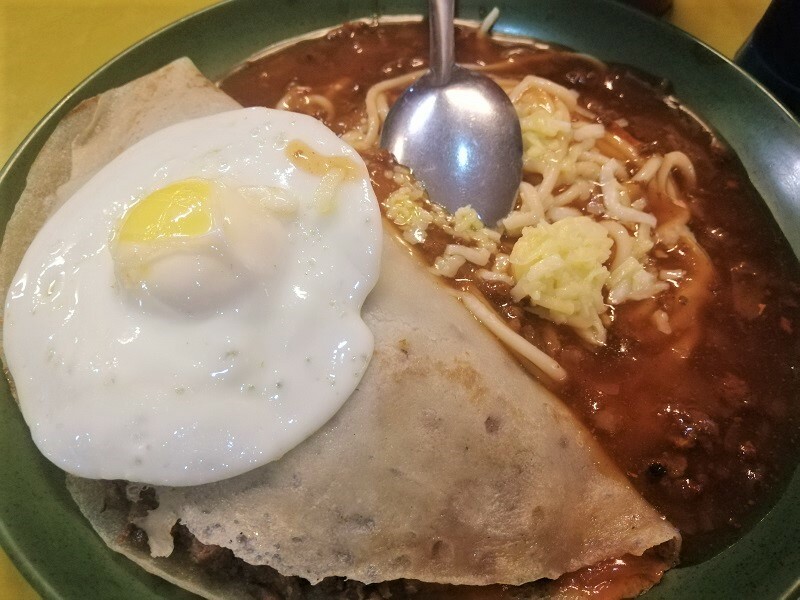 I asked if they have homemade ones and they said they do not, they only use additional toppings like hash browns to add some zest to their offerings. I went for the Deluxe Big and Tasty (Beef) as recommended by the lady. This was a standard Ramly beef patty topped with a chicken slice and crispy hash brown. 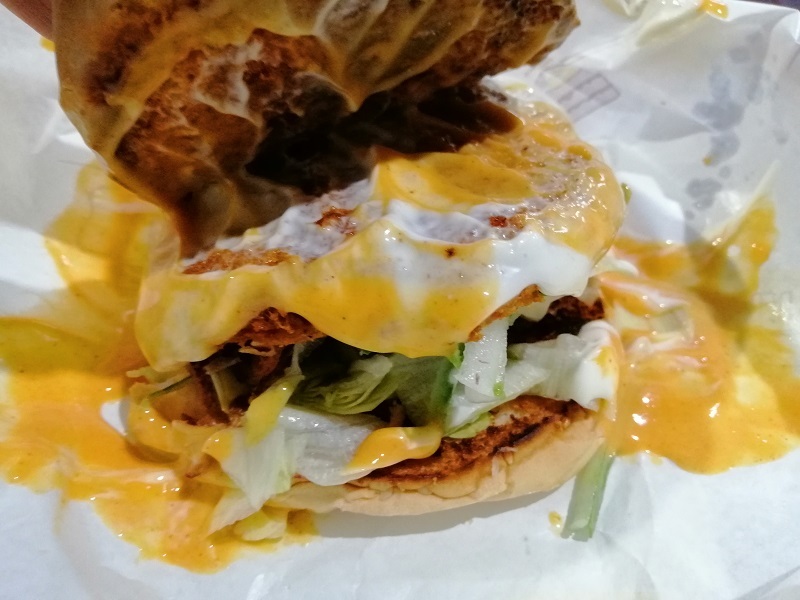 It’s not bad and I like the crunchy hash brown inside the burger. However, it took 40 minutes for the burger to arrive. That’s an insanely long wait for what is essentially a Ramly burger with a few pre-made, store-bought flairs. Mandy had the Chicken Spicy Deluxe. 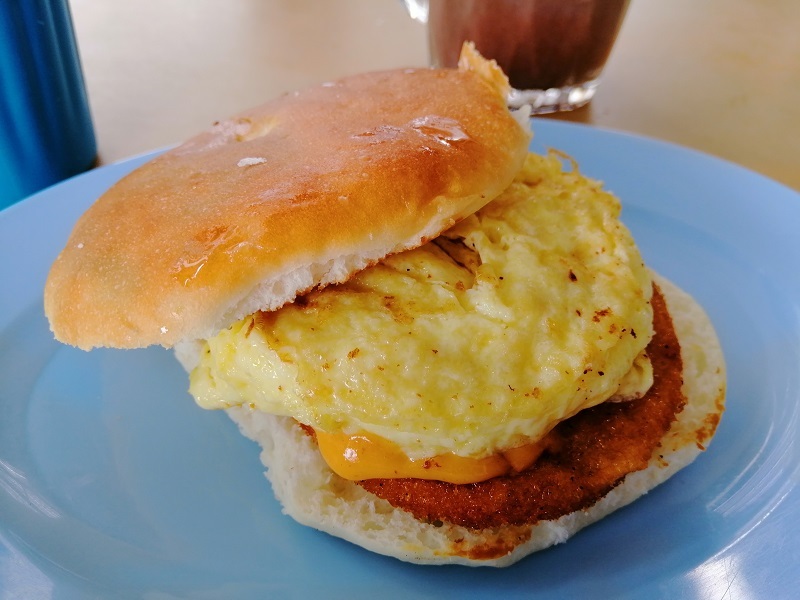 This patty may be homemade or perhaps they just deep fried a regular Ramly chicken burger patty. It doesn’t taste extraordinary. 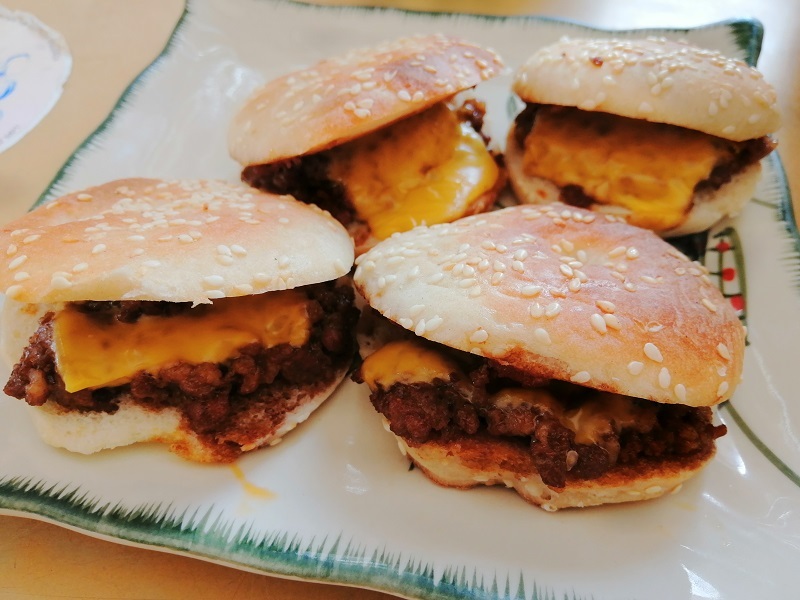 There’s nothing remotely gourmet about the burgers here – these are merely street corner burgers masquerading as something more with a few off-the-shelf items added. 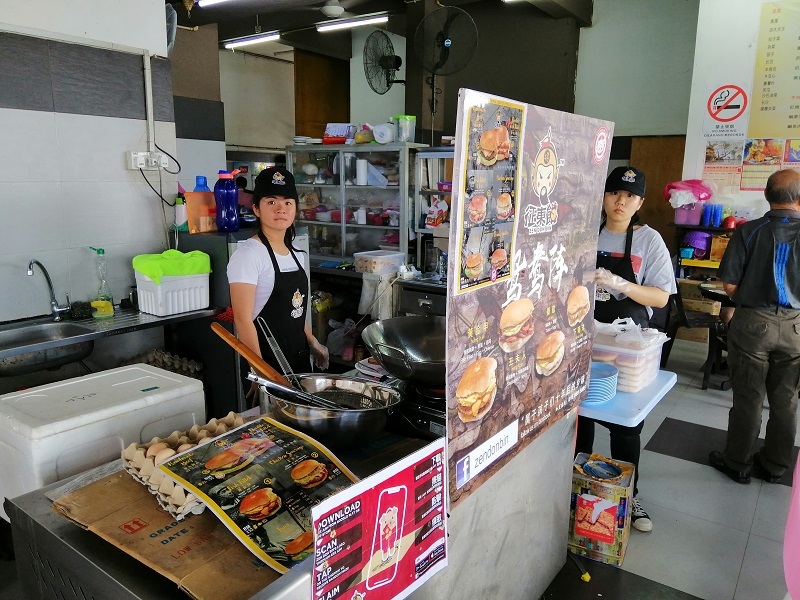 It’s like The Mac’s in USJ – I don’t see why we should be glorifying mediocre food assembled with store-bought ingredients. Give this a pass. 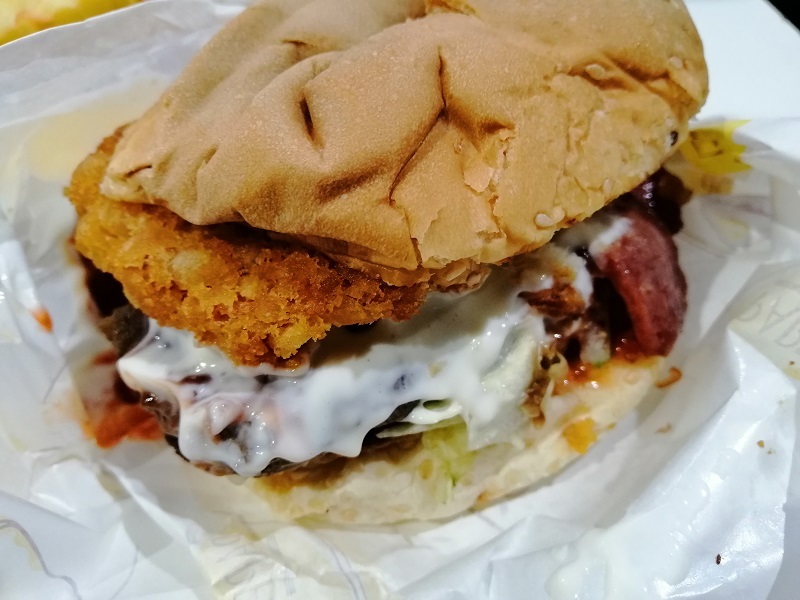 You can get way better burgers at places like myBurgerLab. On Sunday, I decided to cook engkabang butter rice! 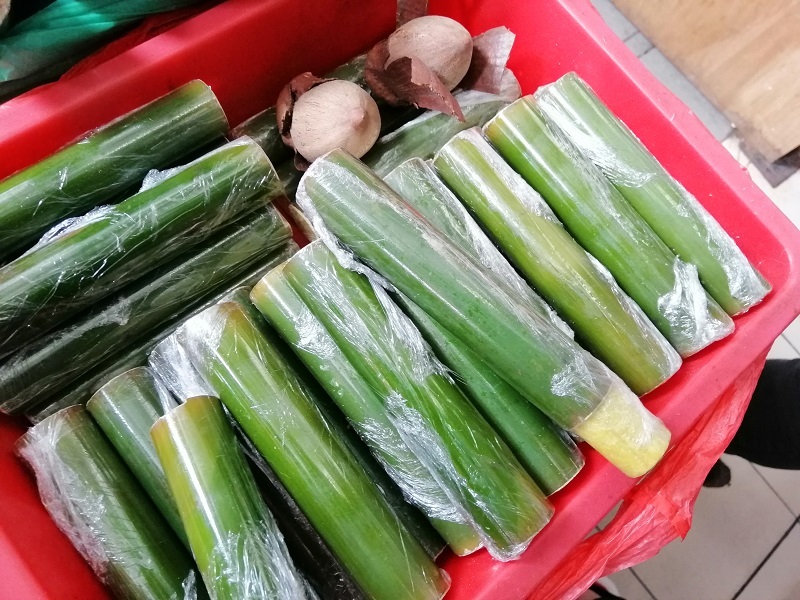 I bought two sticks of these beauties in Sibu – one for RM 20 and the other RM 15. 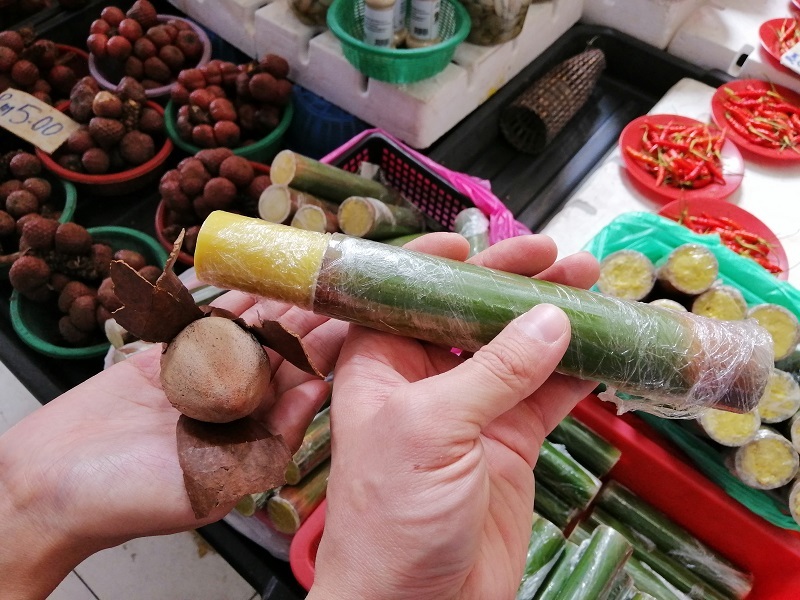 Engkabang is a type of nut in Borneo and the locals extract the oils and make it into a paste, which is then sold in short bamboo lengths. 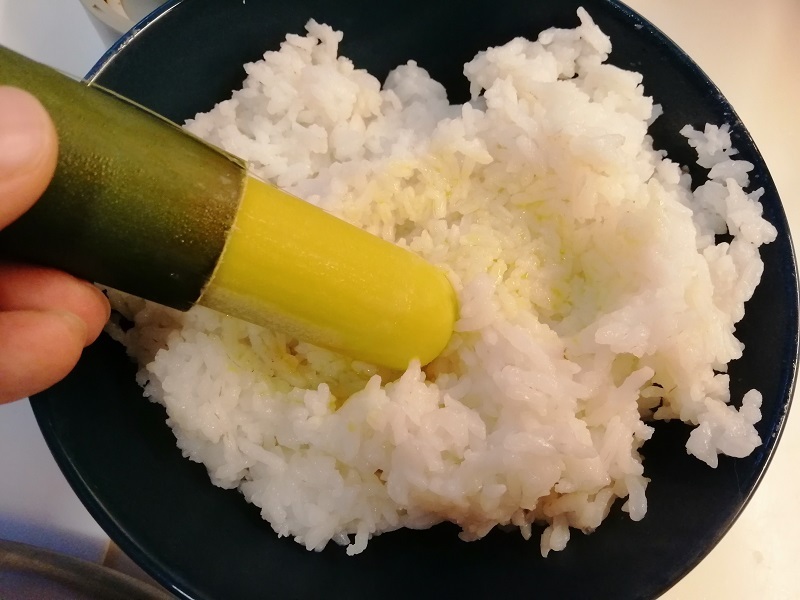 You just push the inner tube of engkabang butter out and let it dissolve in warm rice. It has an unusual jungle-y nut taste which is quite addictive! 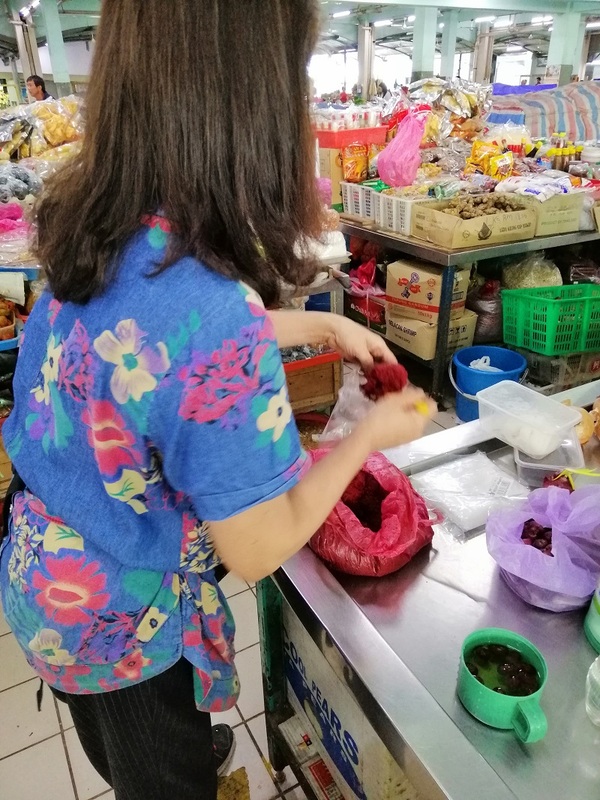 I also bought some ang chow (red yeast rice wine sediments) in Sibu and I used it to cook pork belly. This is more fried than stewed. I first stir-fried ginger in hot sesame oil before adding pork belly slices, ang chow and other seasonings. It tasted really good paired with the engkabang butter rice! One of my better recipes. 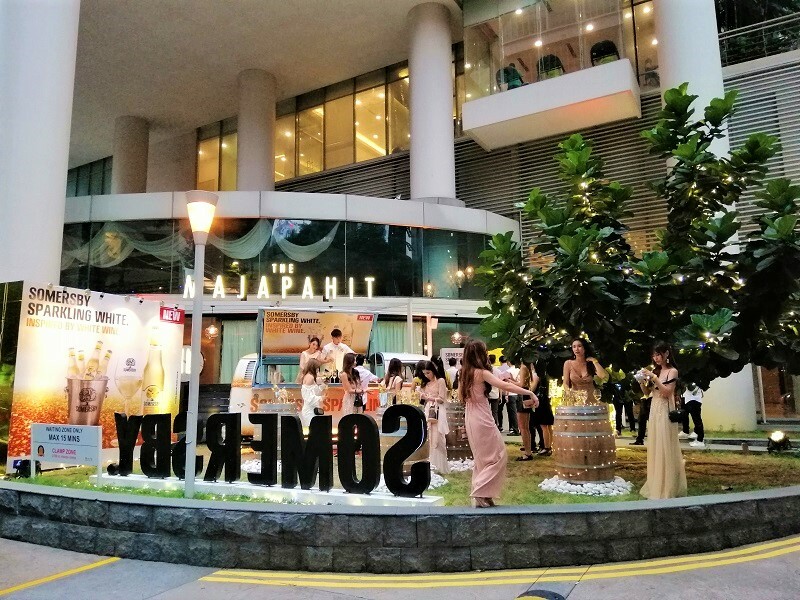 Malaysians were the first outside of Europe to sample Somersby Sparkling White – a newly launched cider inspired by white wine. 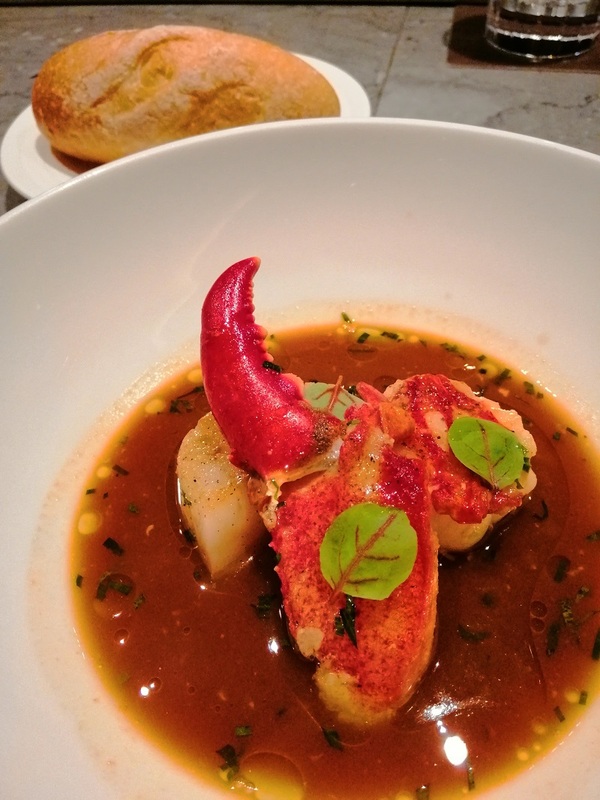 It’s less sweet than their regular offerings and pairs well with the traditional white wine pairings of seafood, white meat, ham and cheese. 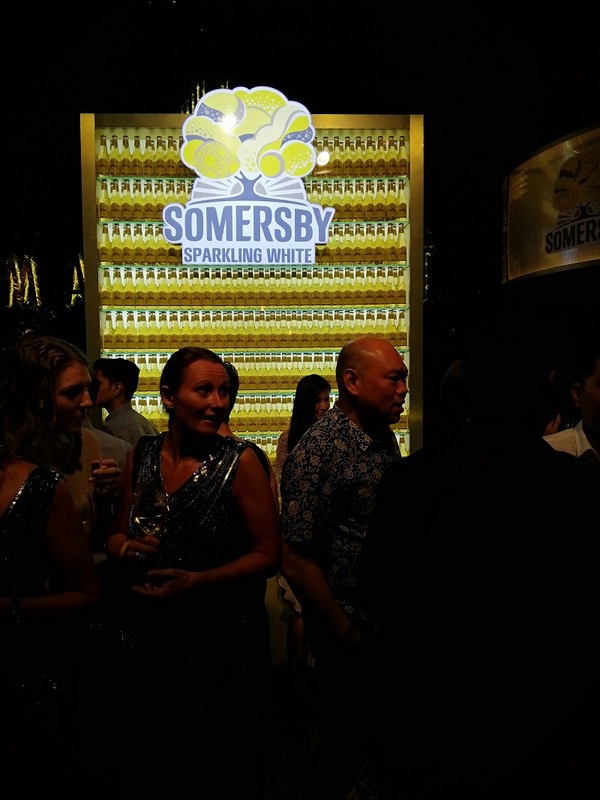 Somersby is targeted more towards females and youth and as I remembered, there were lots of young female Instagrammers at their previous event. This had nothing to do with my decision to attend though. Honest. Carlsberg events are the only events I attend with any kind of regularity nowadays. I barely registered the eye candy. I’m in a fulfilling relationship and my eyes feel no need to feast on supplementary flesh. Except for oysters. 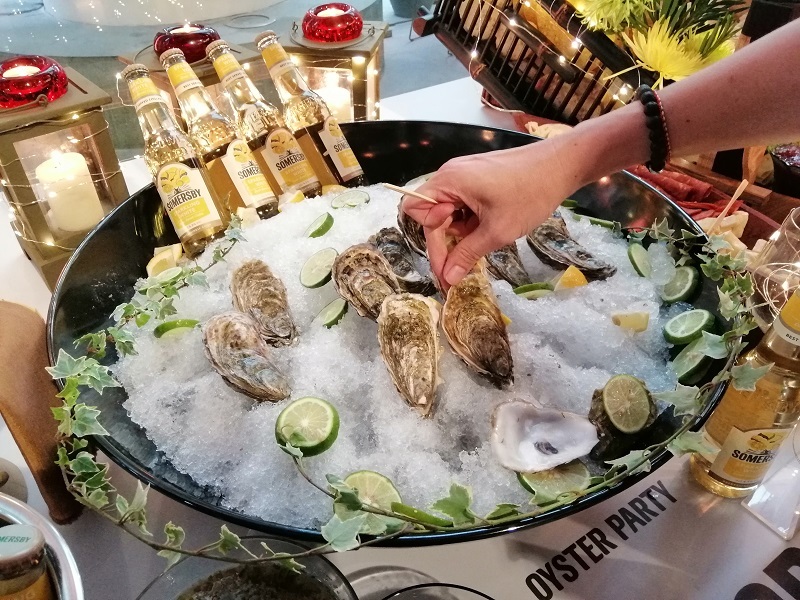 I love the oyster bar they had set up coz raw oysters are one of those things I love to eat but am too cheap to order in restaurants. I will happily partake if someone else is picking up the bill though. I also indulged in the delicious shrimp skewers they had. These are only the hors d’oeuvres, mind. They also had a dinner spread for later. 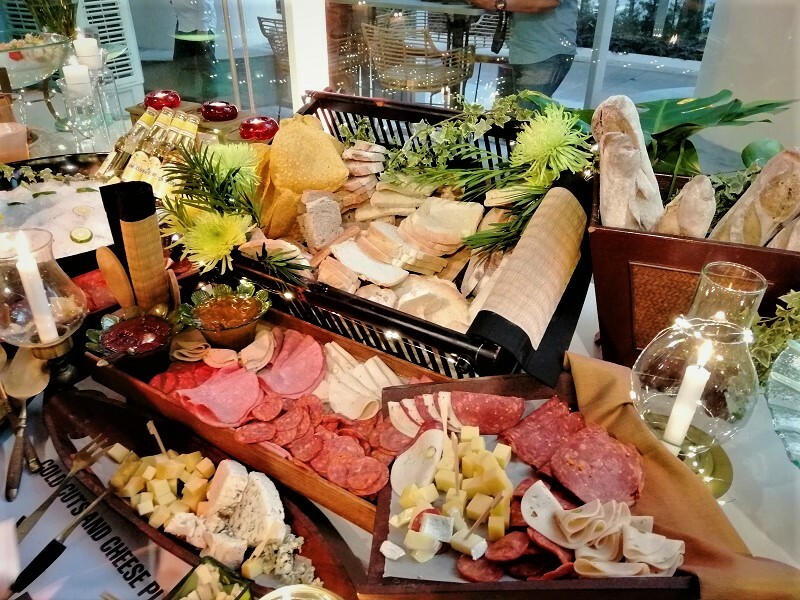 The featured foods also included cheese and cold cuts – all things that go well with Somersby Sparkling White cider. I liked how they only served the new cider at first so everyone gets a chance to try it out. 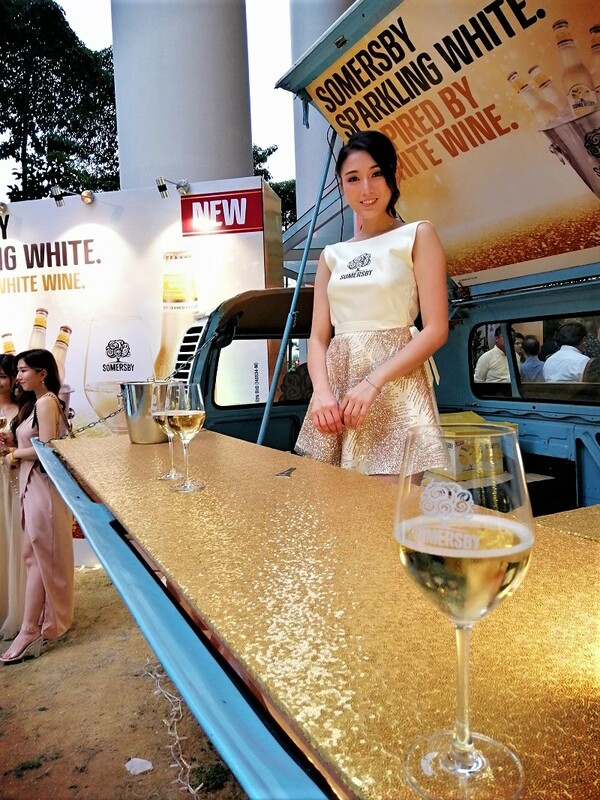 The Sparkling White wine rack was really cool! This is a tall, backlit display that was perfect as a photo op. 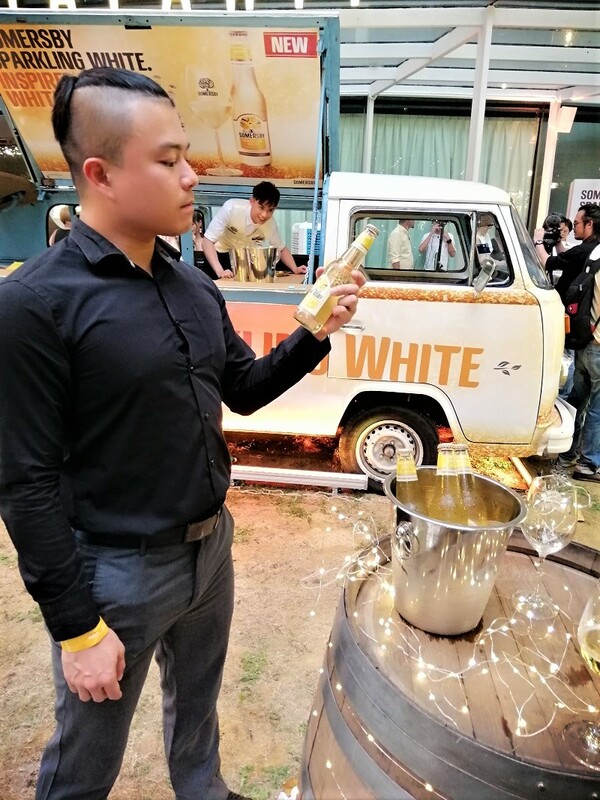 There’s a Somersby Sparkling White Kombi van parked at the exterior, which proved very popular with the Instagram crowd too. There was a launch event by the MD of Carlsberg Malaysia, Lars Lehmann, before dinner was served. 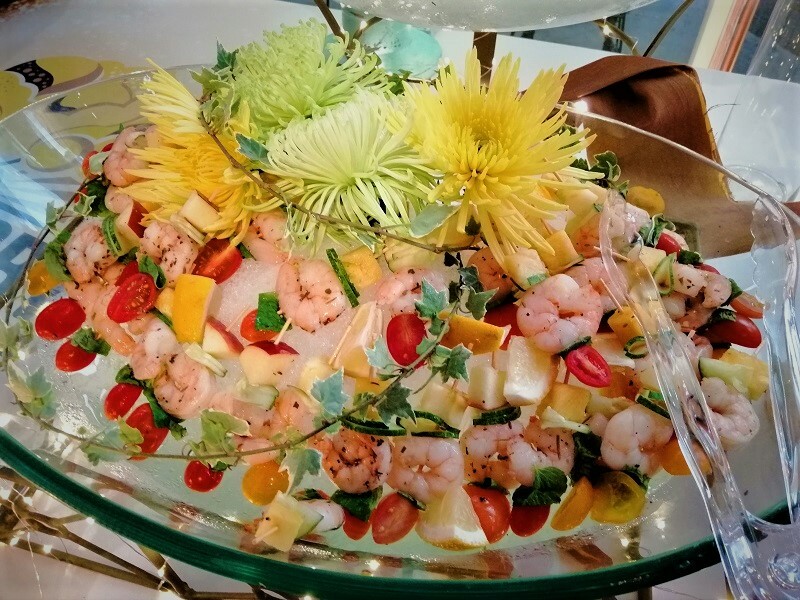 The buffet dinner was quite upscale – none of the usual suspects you find in similar setups. 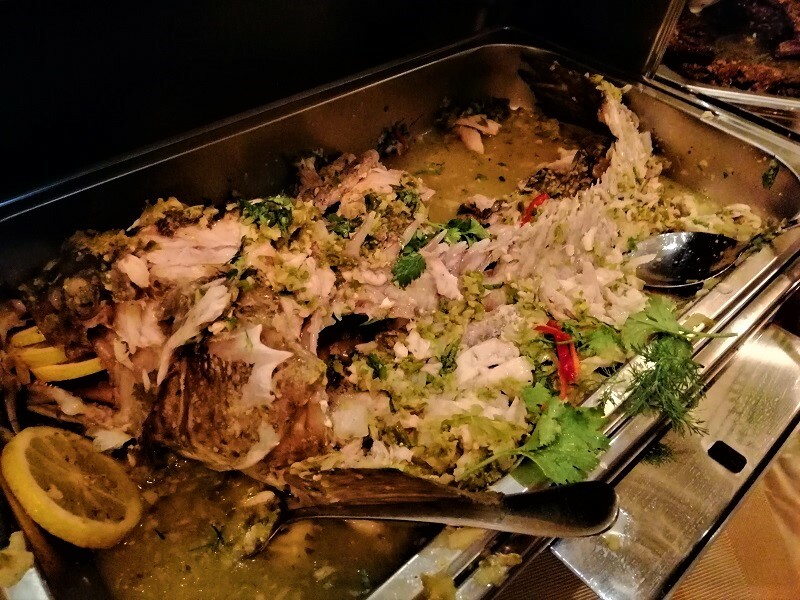 This event featured whole giant grouper fish, huge deep-fried king prawns, sliced beef steak, and crispy BBQ chicken wings. I regretted eating so much for lunch. I wish I had saved space for this spread. 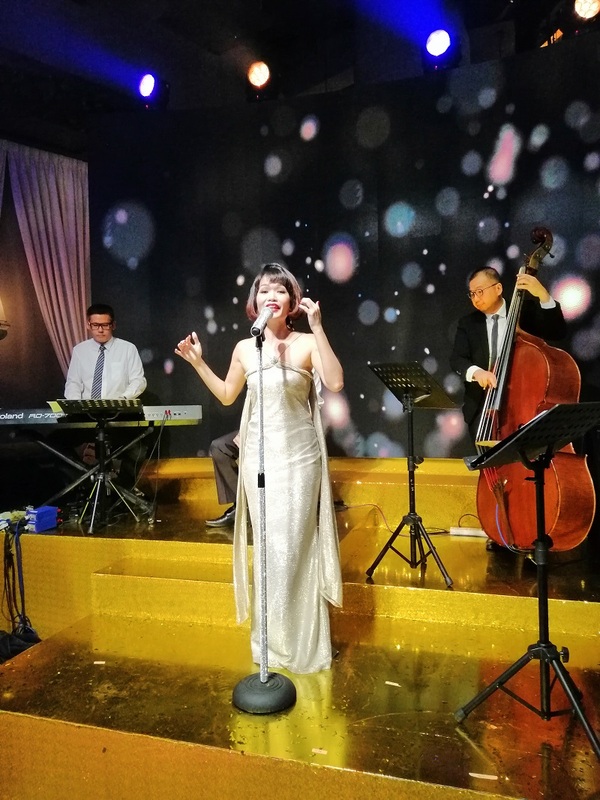 Entertainment was also provided throughout the night with a live band performance featuring Janet Lee as the vocalist and a violin performance by Grace Tan. 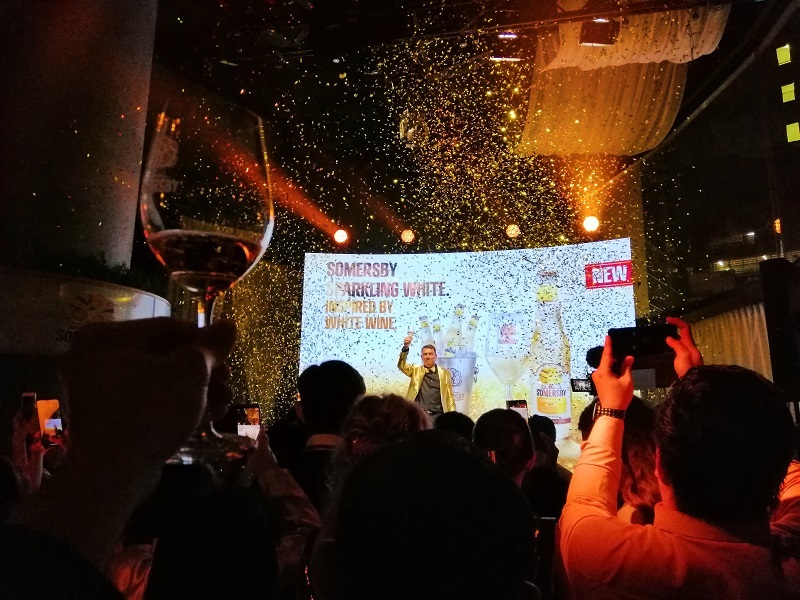 I really enjoyed the new Somersby Sparkling White cider. It’s very easy to drink, without being too cloying. One of my gripes about the regular Somersby line is that it’s too sweet. 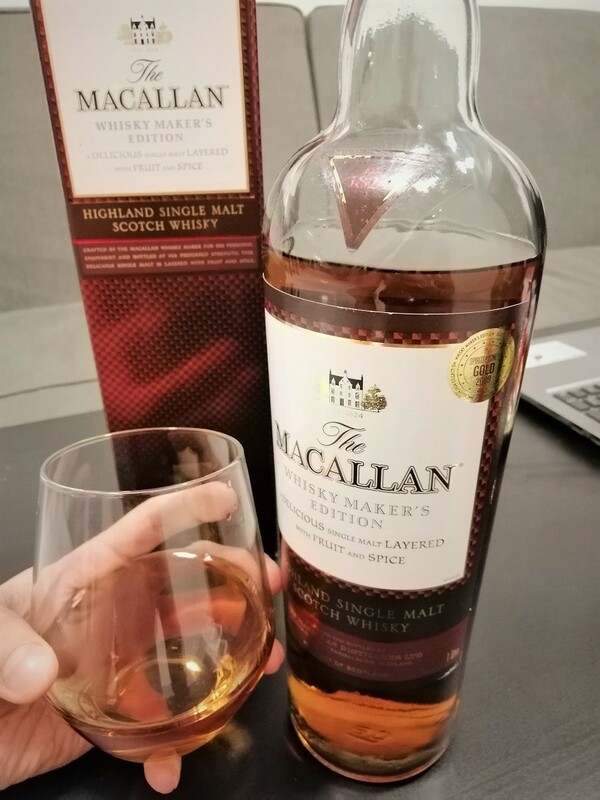 As someone who prefers hoppy beer and peaty whiskey, I don’t enjoy saccharine notes in my alcohol. 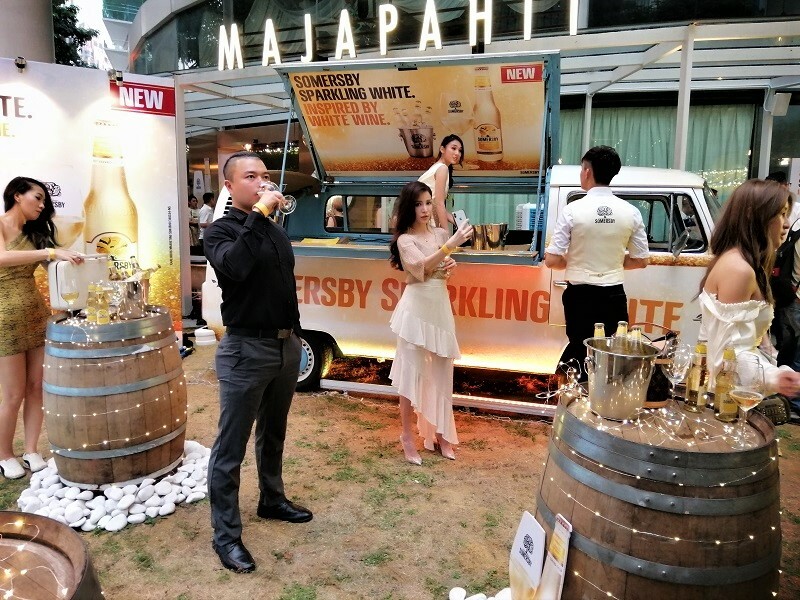 Somersby Sparkling White strikes the perfect balance between sweet and refreshing – without any of the dry acidic notes which some people dislike in white wine. 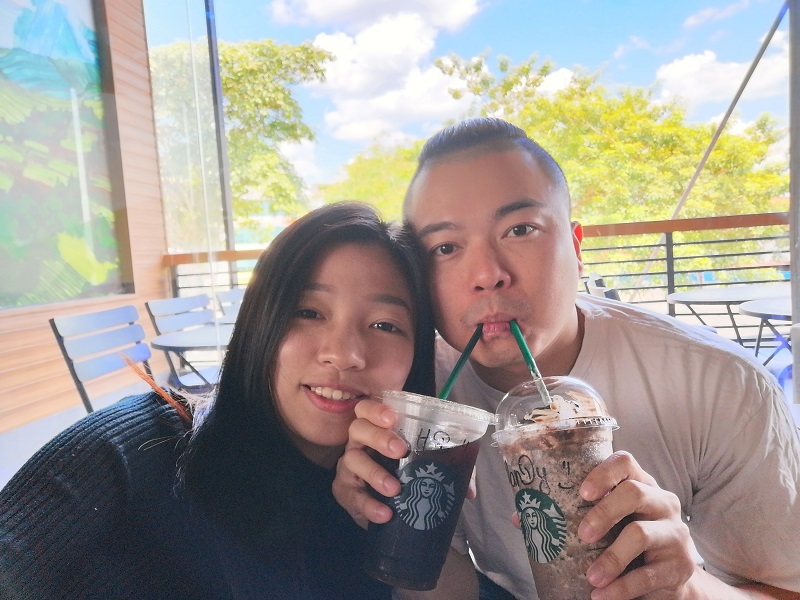 Saturday is our date night and I listed 3 options for Mandy to choose from – Carpenter’s Daughter, Big Hug Burger and Outdark Malaysia. 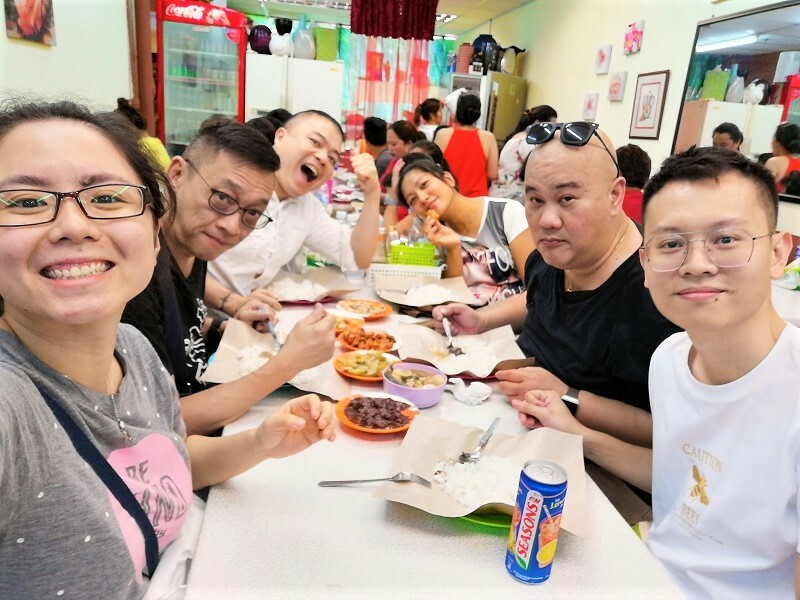 They’re all around the SS15 area coz she wanted to check out Xing Fu Tang. 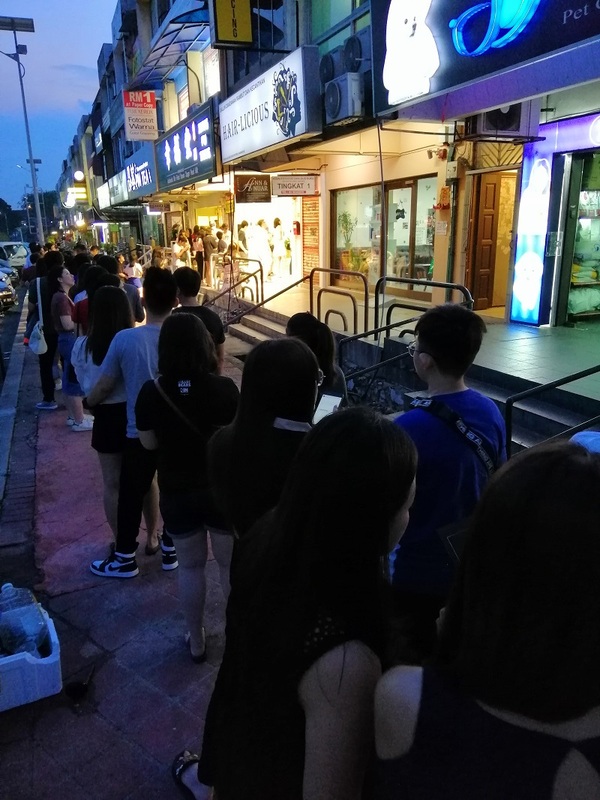 That’s the latest bubble tea shop from Taiwan to open in Malaysia and the queues are insane. 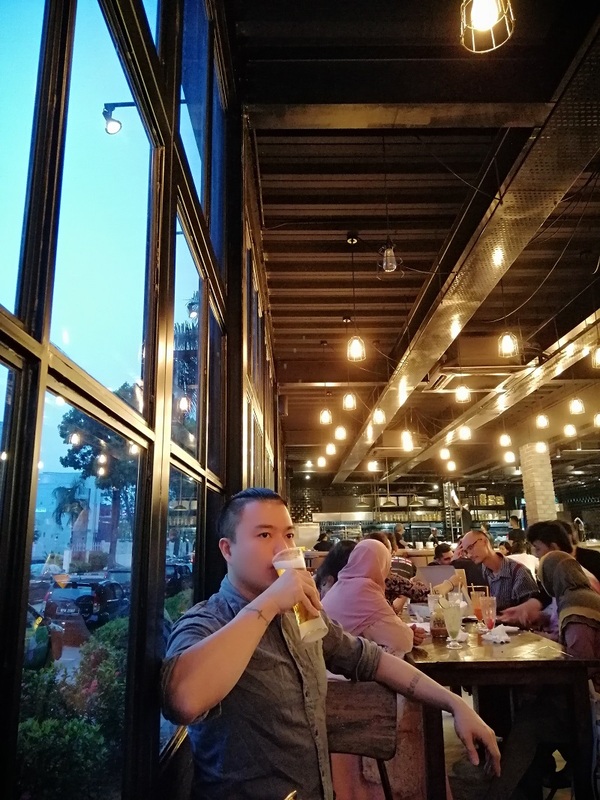 We actually went there first but had to wait till 7:30 pm for their drink allocation to open up so we headed to Outdark. Outdark Malaysia is a Korean franchise that came from Busan. I went to Busan a few years ago for a work trip – it’s a nice place but I prefer Japan to Korea. 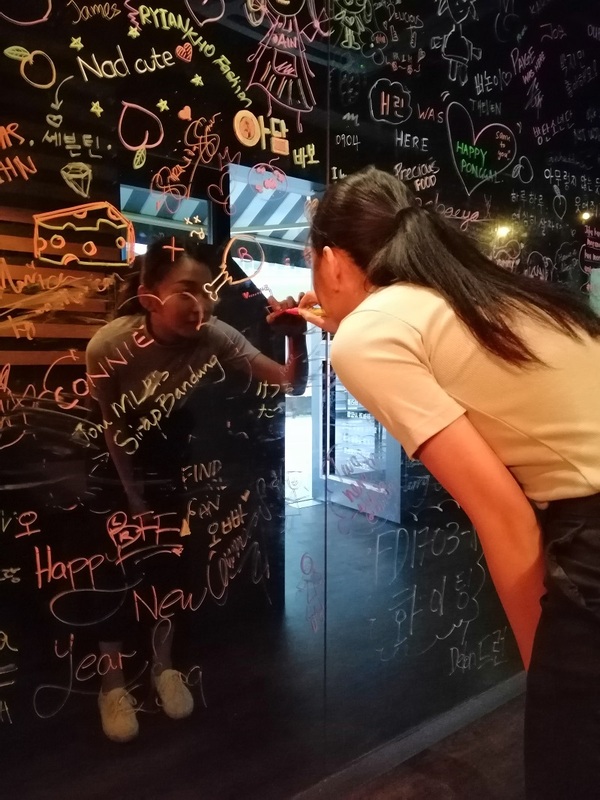 They had a glass wall where you can write on with felt tip markers and Mandy drew both our names there. 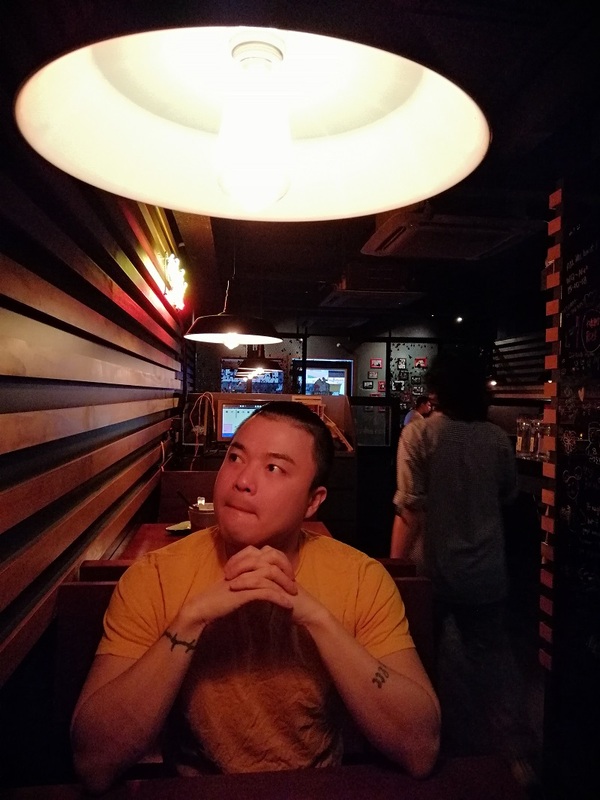 I like the ambience of the restaurant – the warm lights provide a nice vibe. However, the tables can be a bit sticky despite the guy wiping it twice, the second time quite carefully. It may be the type of lacquer which makes it prone to retaining the stickiness from food instead of wiping clean. We ordered the The Ultimate Cheese Kingdom (RM 88). 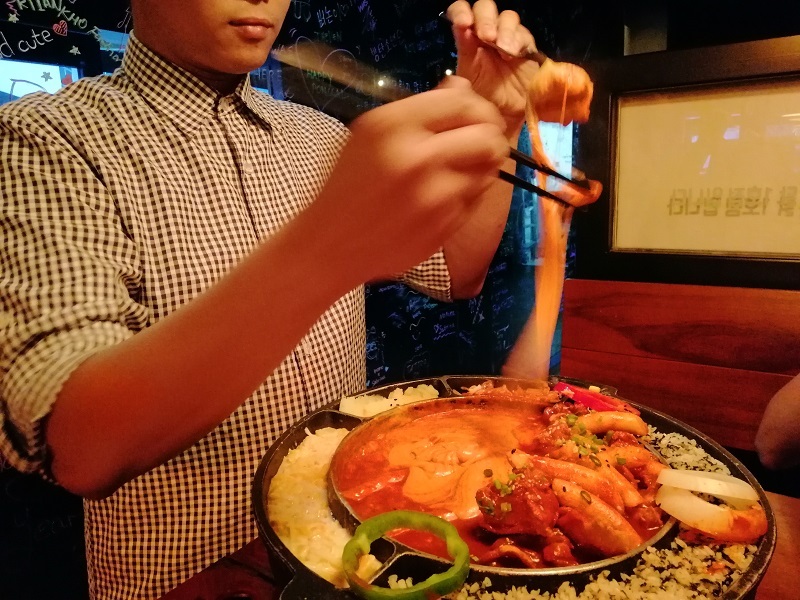 This is their flagship dish of Korean fried chicken, tteokbokki and gooey cheese. There are sides of kimchi, short grained rice with seaweed, sweet corn with more cheese and mashed potatoes. The server waits for the cheese to melt then wraps each fried chicken in a cocoon of cheese. It tastes pretty good. The fried chicken is covered in a sweet tomato and gochujang sauce which can be very cloying in large amounts but the savoury cheese cuts through the sweetness well. We both enjoyed it. The bill came up to RM 104.50 including drinks which is decent for a weekend dinner. They serve reasonably priced soju compared to grocery stores too. 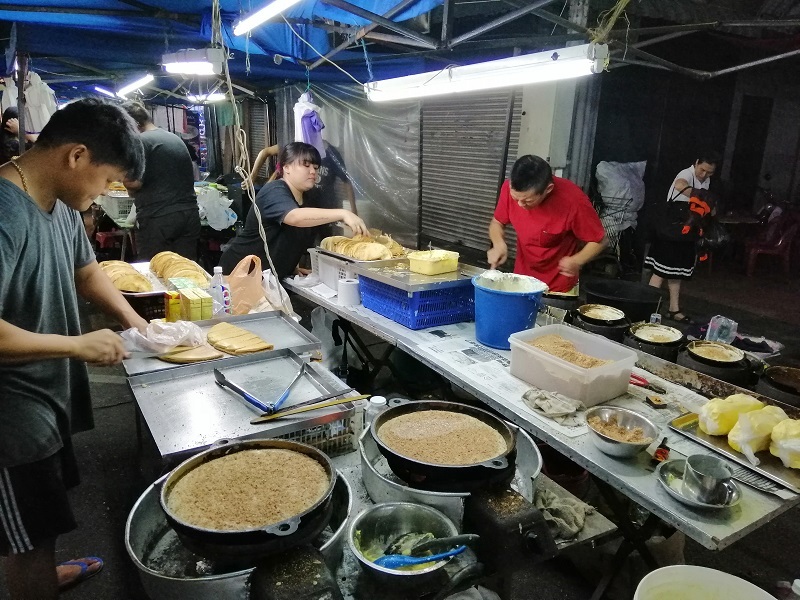 We left promptly at 7:30 pm and joined the long queue in front of Xing Fu Tang. There was a girl giving out tickets. 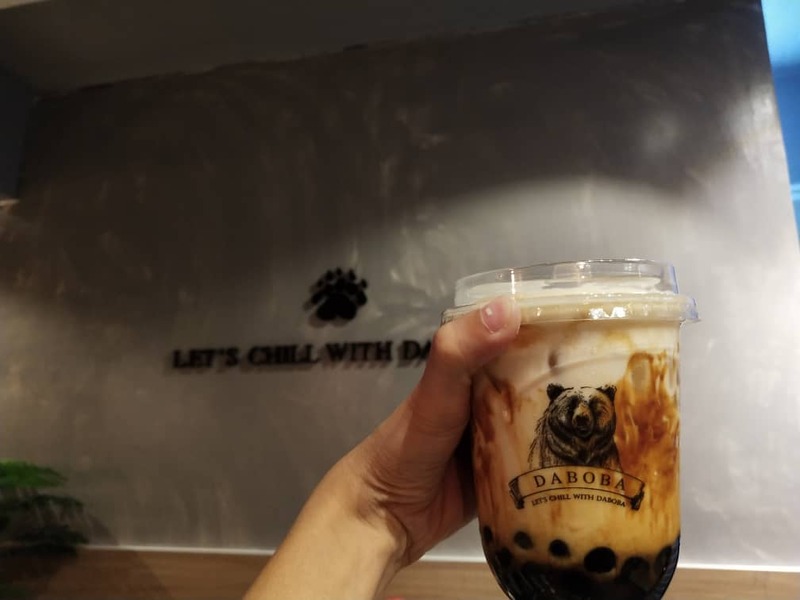 Each slot (about 2.5 hours between slots) only has a maximum of 100 cups of their signature Stir-fried Brown Sugar Pearl Milk and 25 cups of their Strawberry Pearl Milk tea. I hear these tickets are fully taken up within 10 minutes! Each person can only have 2. I wouldn’t doubt it. 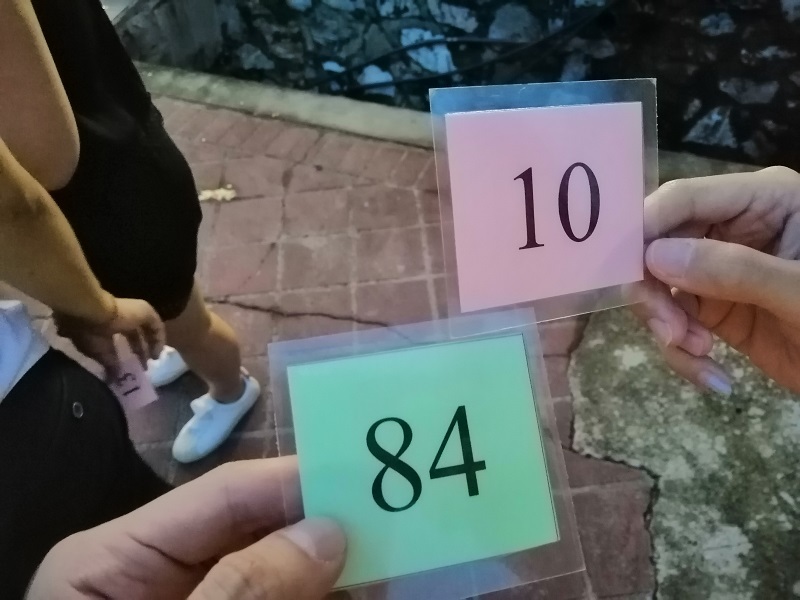 We got 84/100 for the brown sugar boba and 10/25 for the strawberry boba and we were there at 7:30 pm when the slot opened! Part of the problem is the newness – it’s only been open 4 days so people want to see what they’re about. It took us 45 minutes before we got to the front. There’s a staff stir-frying the brown sugar pearls in a huge wok. This is then poured into a cup, making sure to get the liquid on every side, to produce their signature look. 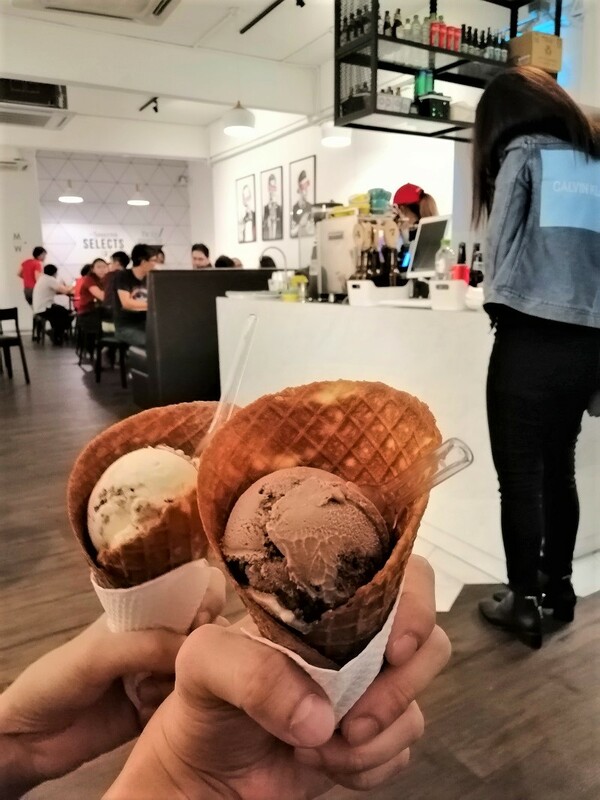 It costs RM 25 for two bobas which is on par with other imported Taiwanese brands. They also use a better barista fresh milk to make their drinks. 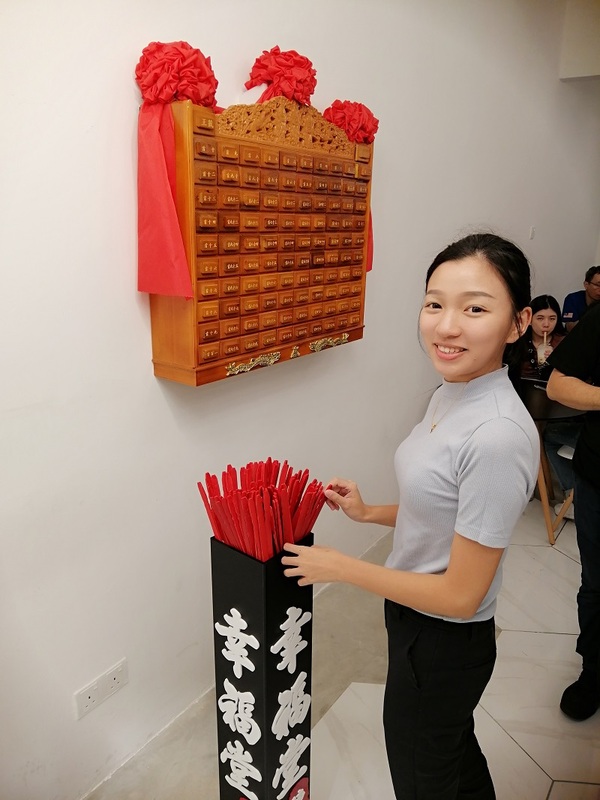 One quirky thing about Xing Fu Tang is they let each person who buys a drink have a go at their lucky draw. You pick a random stick from a huge basin and the number is matched to one of the drawers. This is similar to the Buddhist fortune telling sticks. 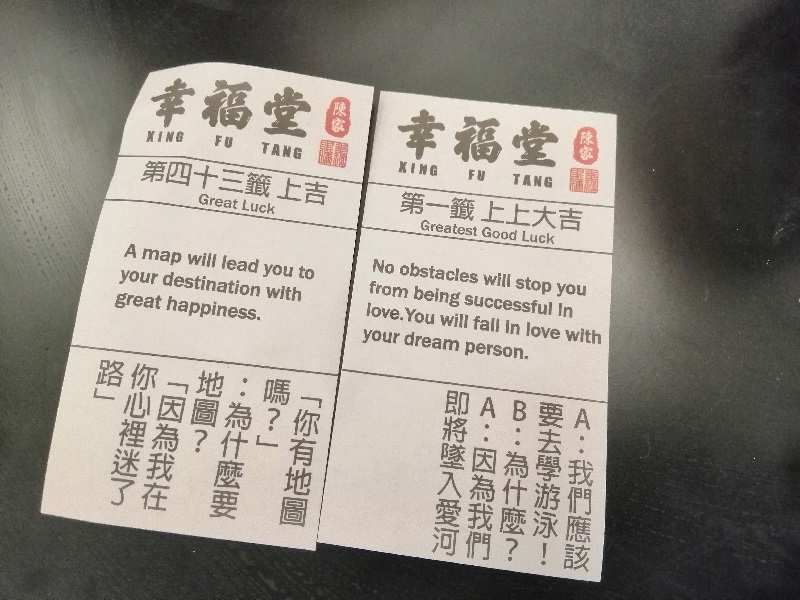 You basically get your fortune told, with a grand prize of a free boba drink. Mandy got Great Luck while I got Greatest Good Luck. We both wondered if they have a Bad Luck drawer. Probably not. 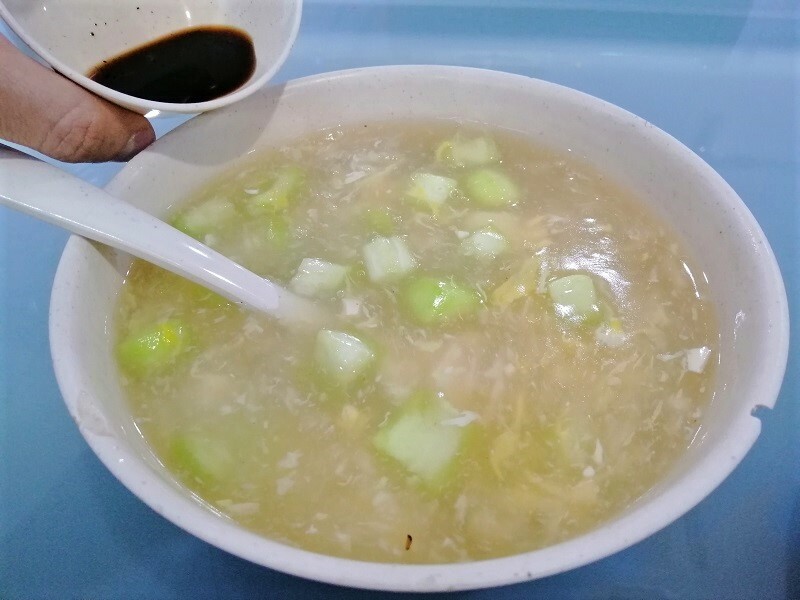 Xing Fu Tang’s flagship Stir-fried Brown Sugar Pearl Milk was disappointing though. It tasted tepid and dilute. It’s still better than the commercialized Chatime/Tealive but nowhere close to The Alley’s standard. It’s milky, but not very tea-like. Mandy gave it 7/10 compared to The Alley’s 9/10. 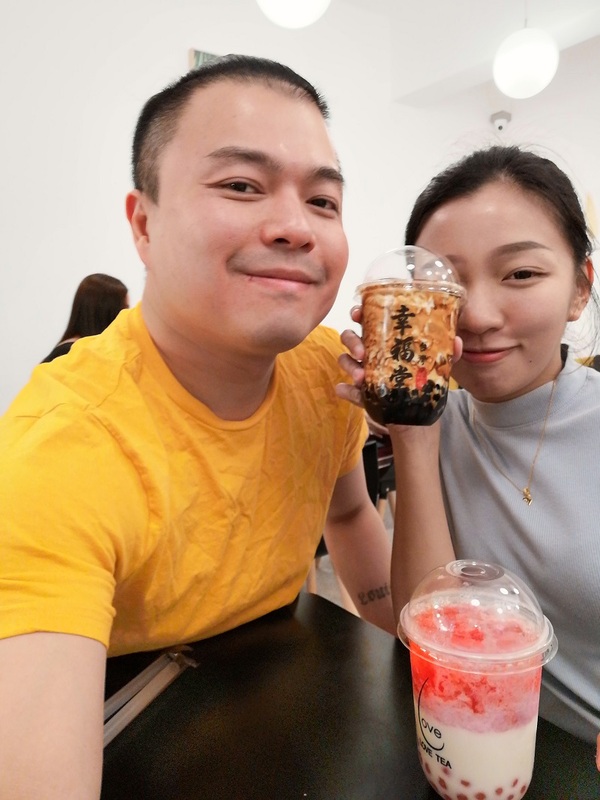 The Strawberry Pearl Milk Tea was better – acidic and refreshing, yet sweet. I quite enjoyed it! I made a care package for Mandy and surprised her by putting it on our living room coffee table with no comment for her to find. 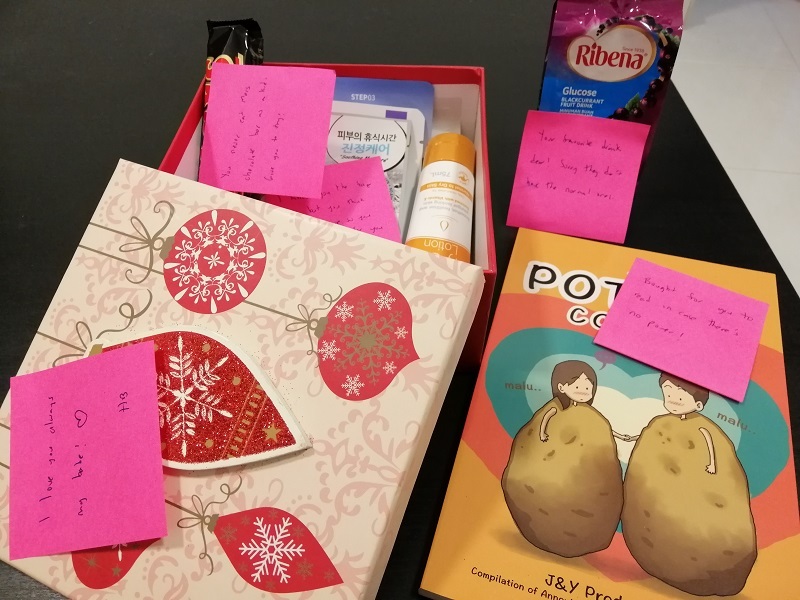 I filled it with Korean and Japanese face masks, a chocolate bar, a packet of Ribena, a lotion and a comic book. I noticed she really enjoys masks but finds them expensive on her salary so I thought I’ll get them for her. She uses them so frugally that I felt sorry for her. Haha. Sunday night was my experiment with homemade Sarawak laksa. I bought the paste during my trip to Kuching over CNY. Mandy’s mom provided me with some mystery seeds which she says tastes good in laksa so I thought I’ll make some. I made a deluxe version with chicken leg, lots of prawns, sambal, lime, coriander and shredded omelette. 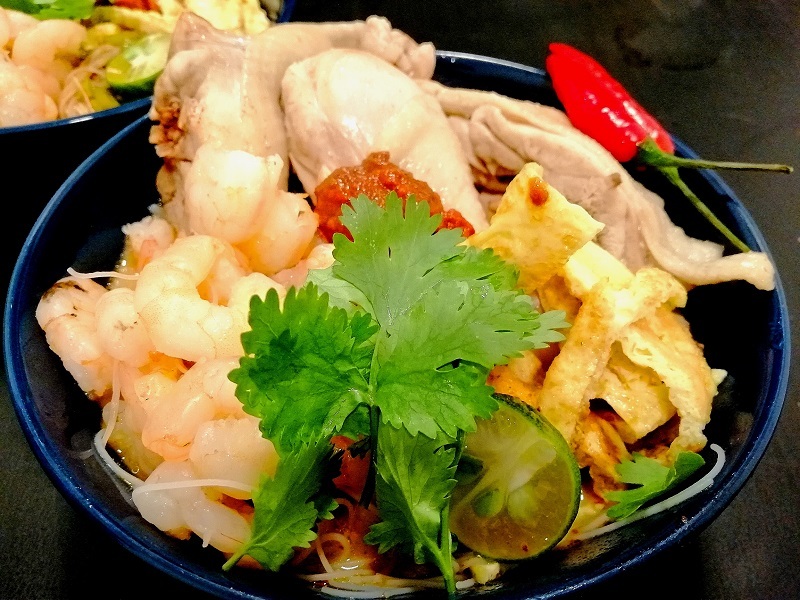 You can barely see the rice vermicelli! It’s decent but missing something. 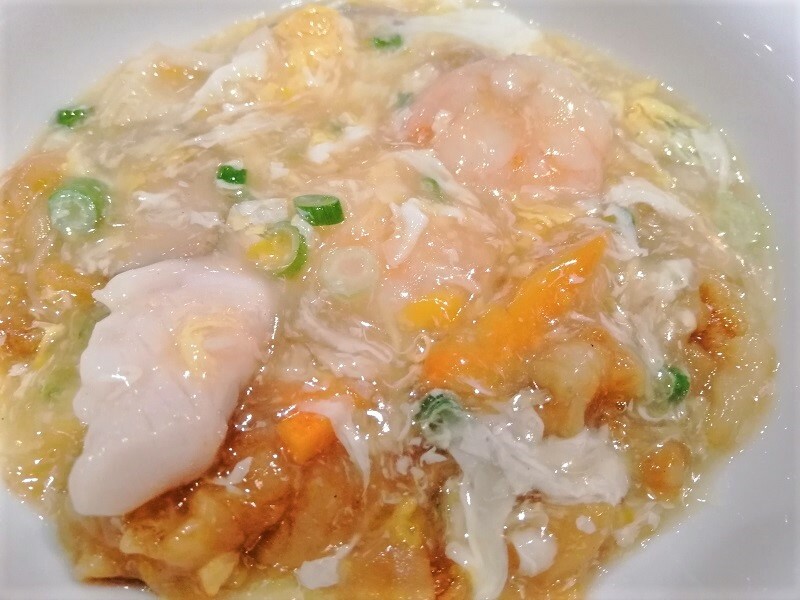 I’ll cook the paste with prawn heads and shells next time. We’re off to Sibu next weekend for Ching Ming! 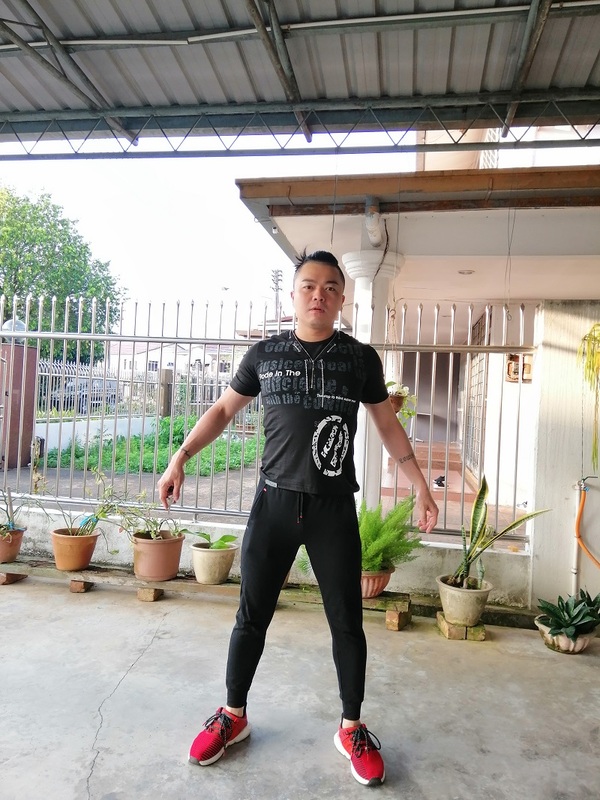 I also have a work trip to Penang this Friday and another one to Ipoh when we come back from Sibu so it’s a busy week ahead. The first thing I did after sending Mandy off to the airport was take a Grab to Kubah Ria. I’ve been craving for Pizza Ria, our local Kuching pizza/pasta/pancake chain. 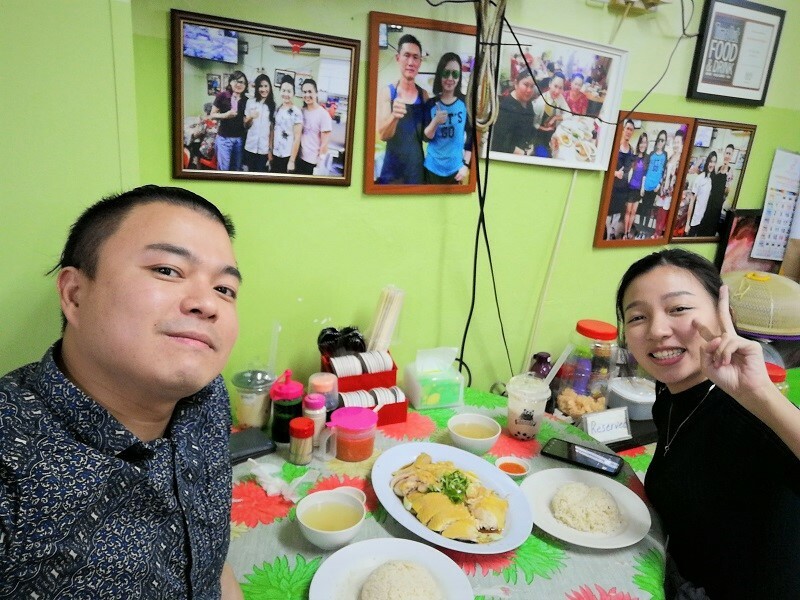 This is their original outlet in Satok – they’ve been open for over 30 years at the same spot! 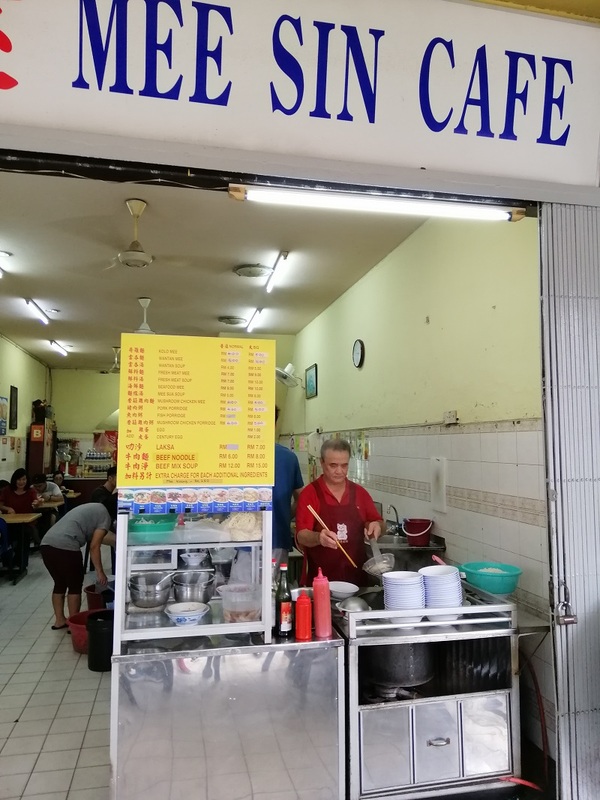 My dad used to bring me here when I was a little kid (we moved to Sibu when I was 7). 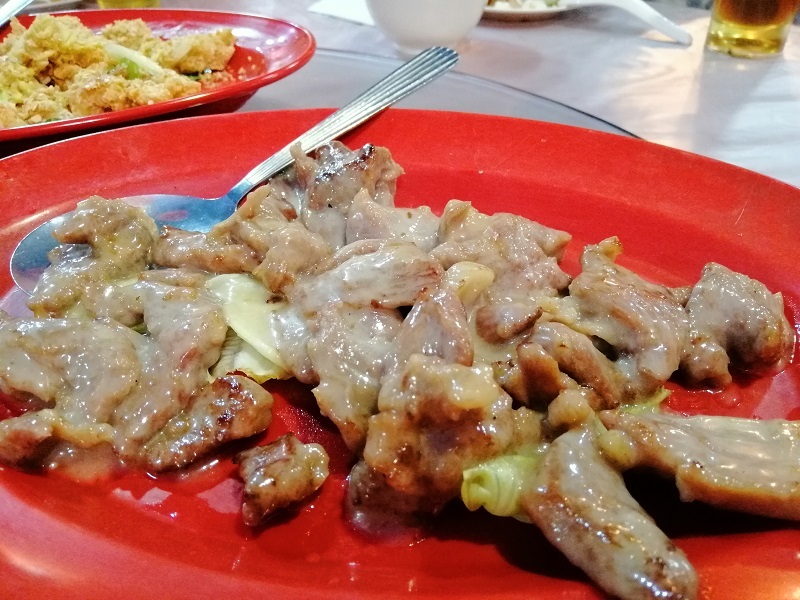 I also indulged in my favorite beef pancake many times when I was working in Kuching around 24-25 but I haven’t eaten it since. That’s a good 12 years without this sinful creation. 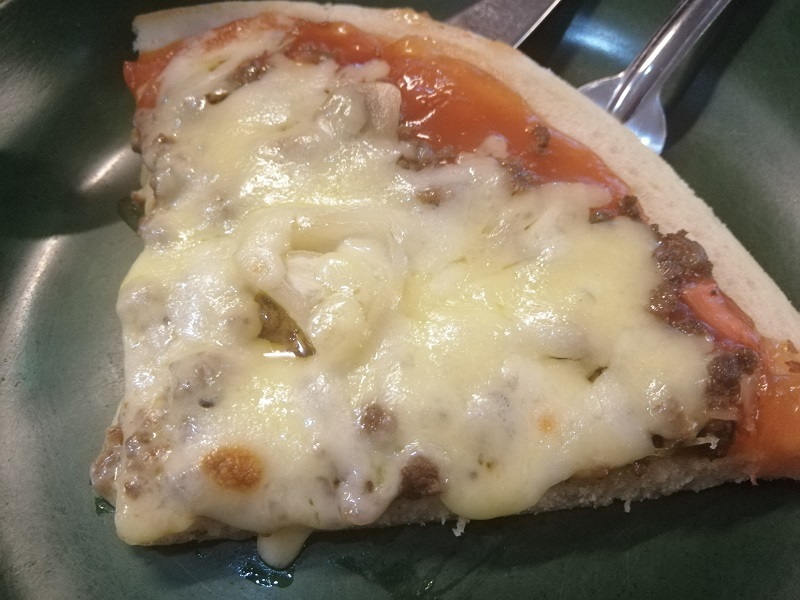 It’s basically mince beef inside a crepe that’s doused with tomato sauce but it’s extremely nostalgic. 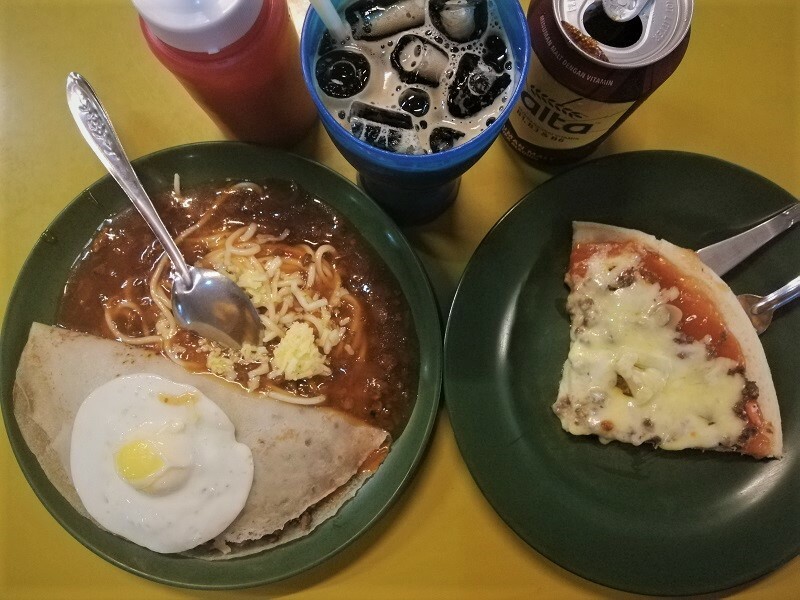 The best pairing is Pancake + Spaghetti (RM 8.50) – you get both options on your plate. You can even request to have it mixed up into a gooey mess! The pancake used to be topped with a made-to-order sunny side up runny egg but they’re all line produced now so that reduced the enjoyment factor a little. 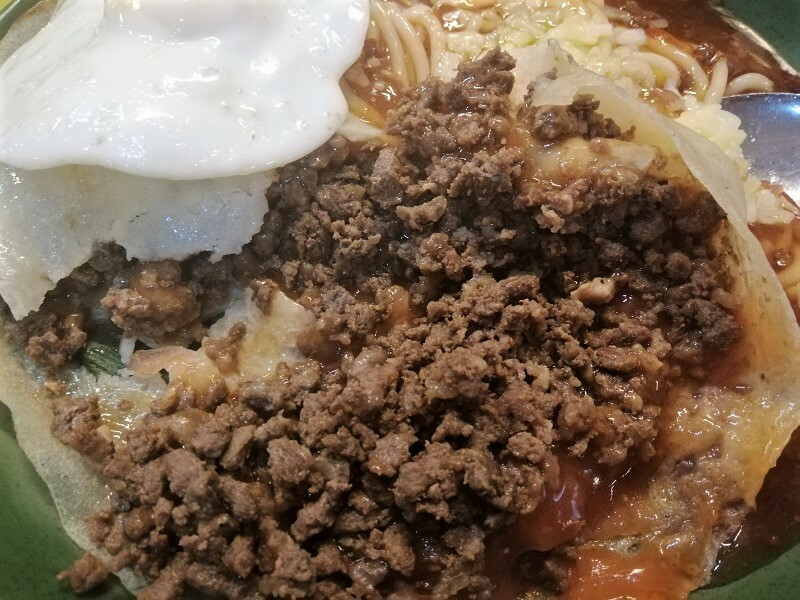 The runny yolk mixed into the minced beef was one of my favorite things – a bite with umami tomato sauce, gossamer thin pancake, savory minced beef and creamy yolk is the perfect mouthful! You can’t leave here without ordering a slice of pizza too. It’s not the best but I love it. You probably wouldn’t enjoy Pizza Ria if you didn’t grow up eating it. 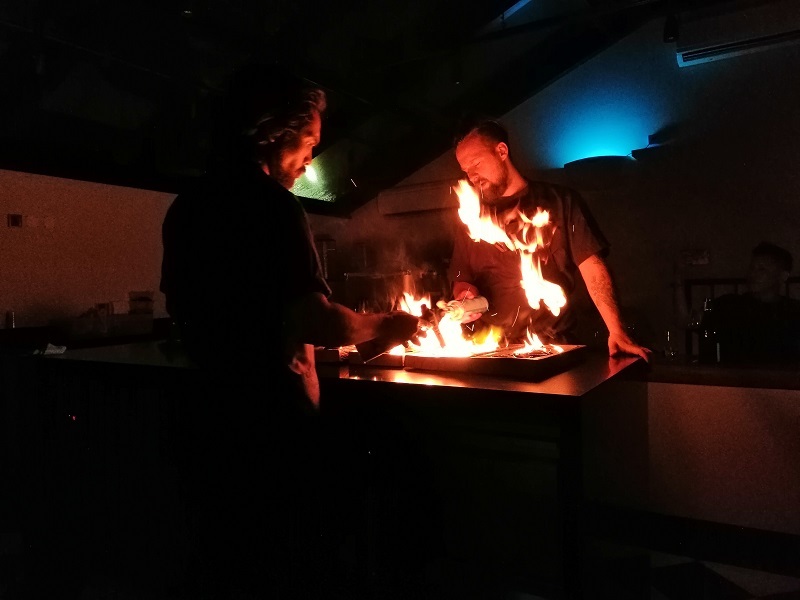 This isn’t exceptional cooking. It’s the taste of nostalgia. 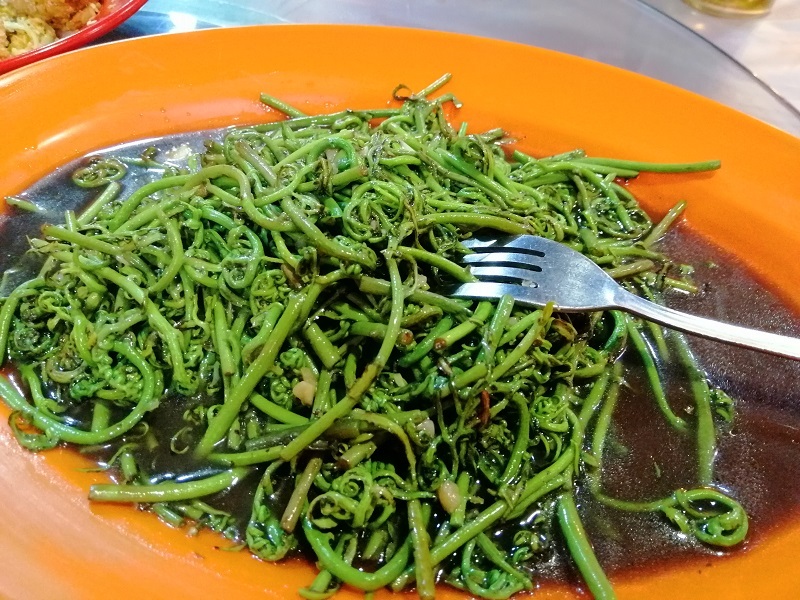 Every true-blooded Kuchingite should have fond memories of eating this, especially if you’re born in the 80s or 90s. I’m glad I had a chance to revisit my childhood. It was delicious! 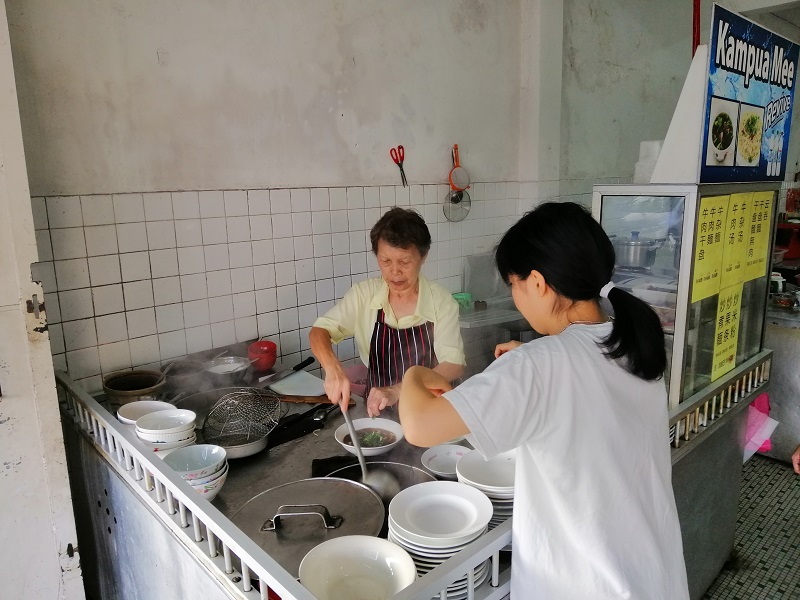 I woke up bright and early to go to Choon Hui Café the next day. This is the place made famous by Anthony Bourdain. 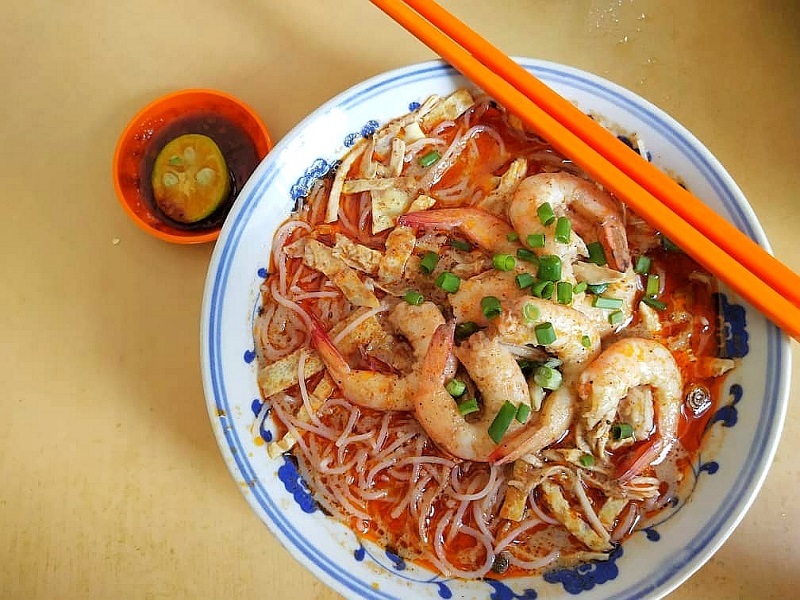 He claims it’s the best Sarawak laksa in Kuching. Unfortunately, it wasn’t open and wouldn’t be open until a few days after I leave. Alas! 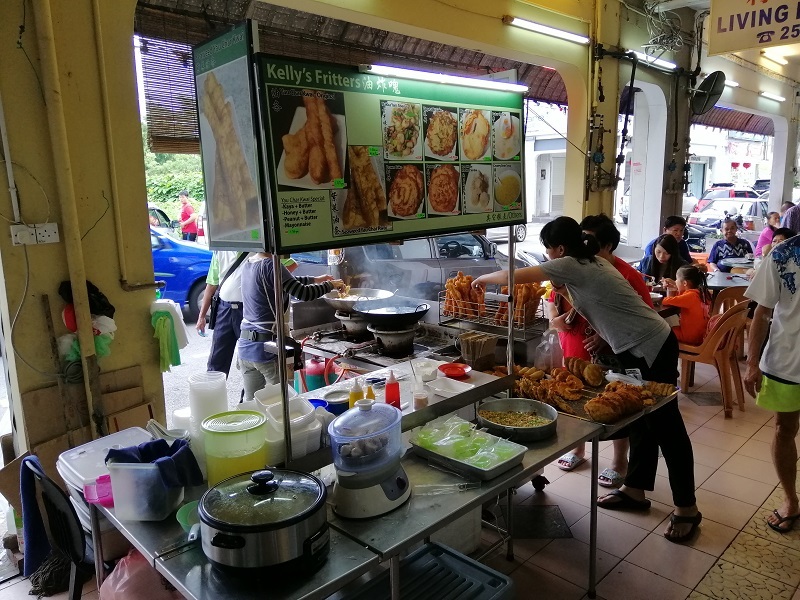 Not to be dissuaded, I went opposite to the only kopitiam open at 7 am to eat some breakfast. 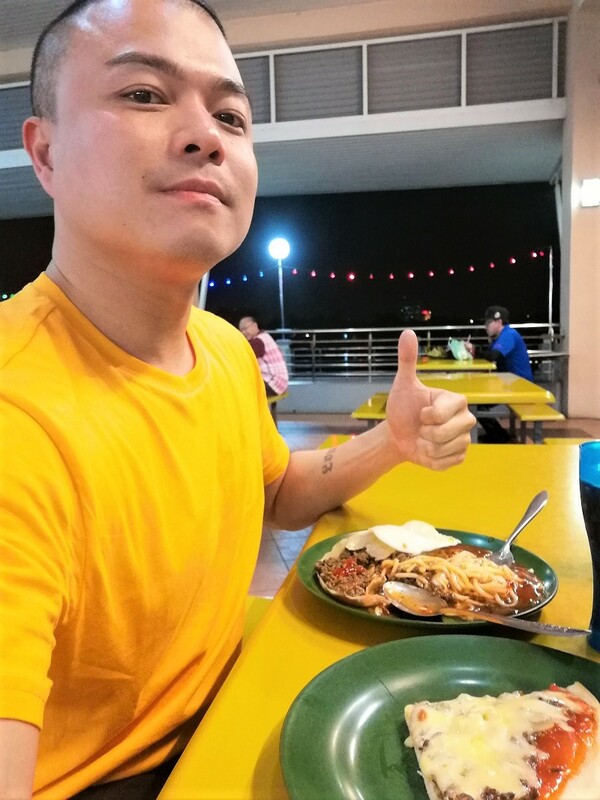 I ordered kolo mee, which took over 1 hour to arrive! 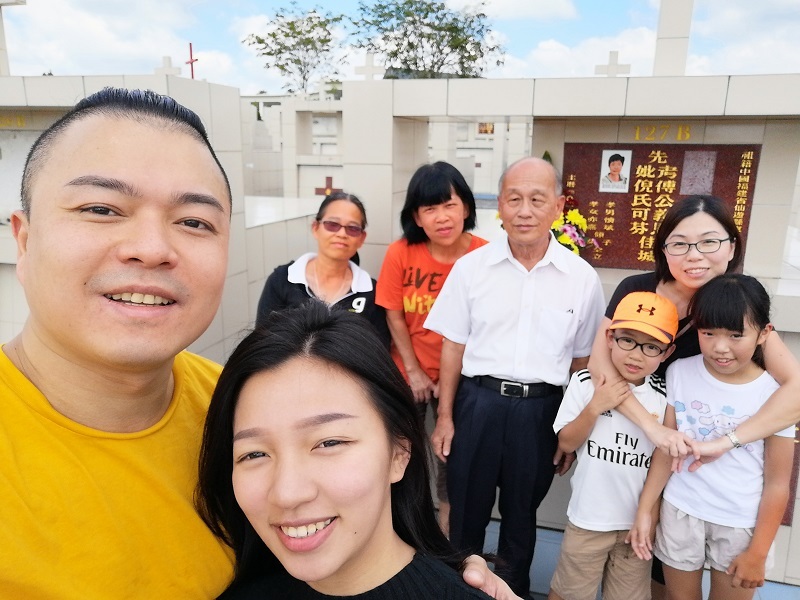 To be fair, the guy warned me that it’ll take a long time to arrive since many out-of-town people were back for Chinese New Year. I probably wouldn’t have minded if it tasted good. Unfortunately, it was almost inedible. 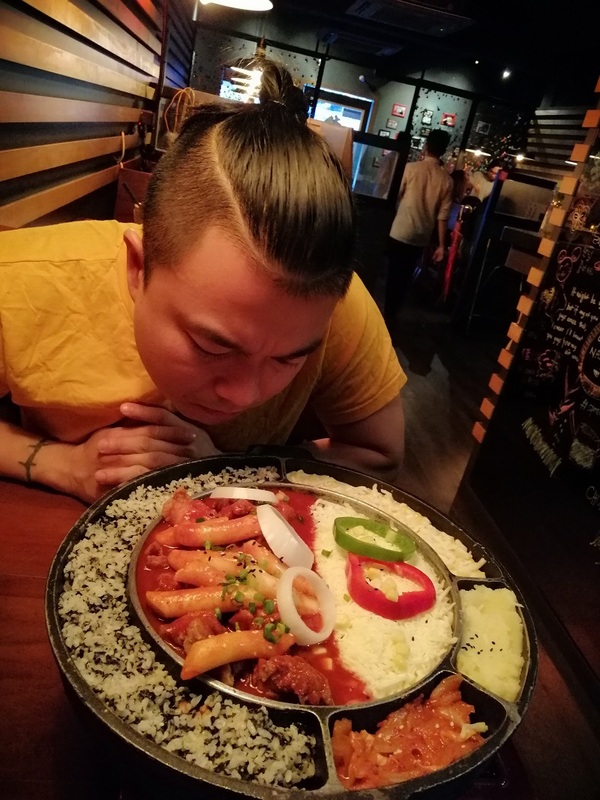 The guy was so rushed he barely tossed the noodles and the texture was disappointing. The flavour was barely there too. I left the bowl after eating two mouthfuls. That’s something I very rarely do as I don’t like wasting food. It was that dismal. Thankfully, my morning meal was saved by Kelly’s Fritters. This was a stall selling various fritters. I went for heh piah (prawn fritters). 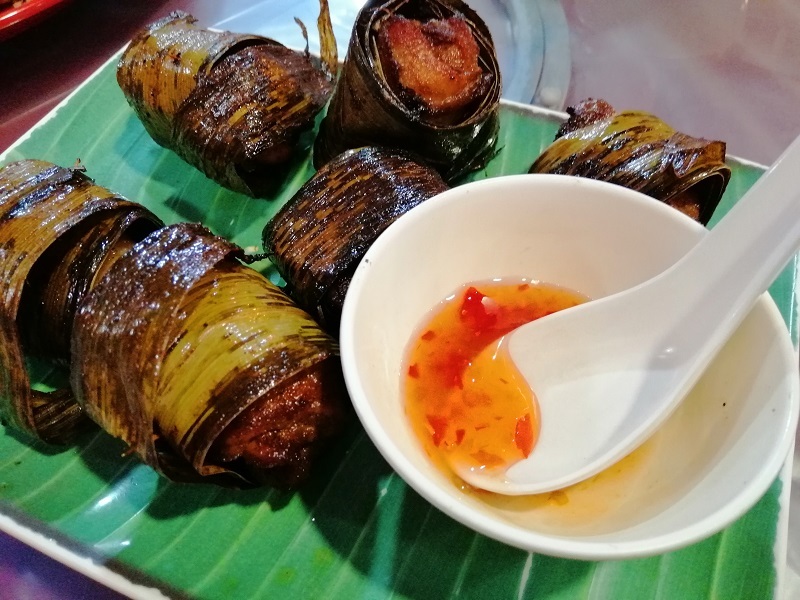 These is a crispy Kuching specialty served with a chilli dipping sauce. 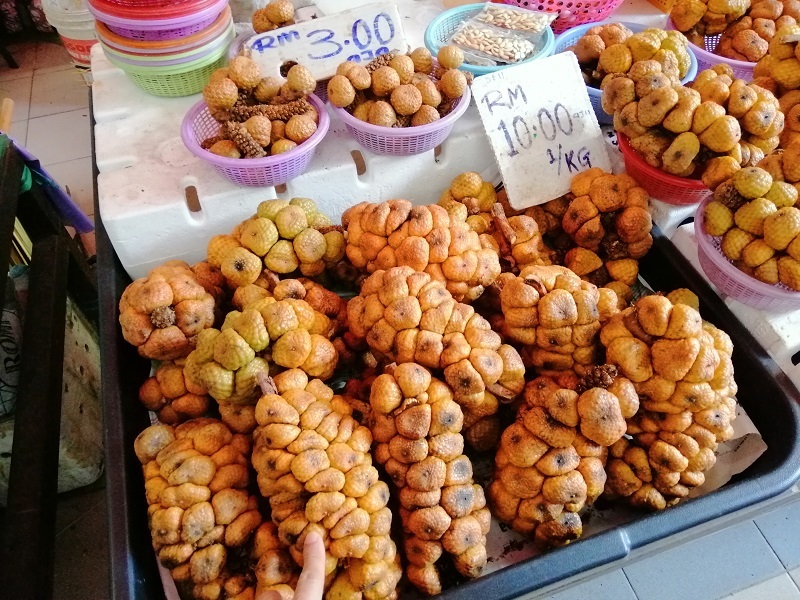 I have fond memories of eating this during tea time at the start of my career in Kuching. 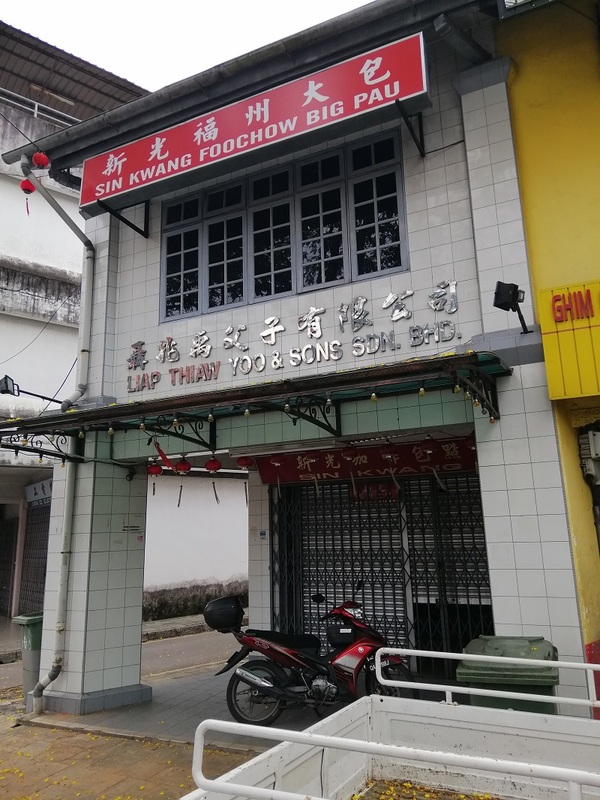 I went to Sin Kwang Foochow Big Pau twice over two days but they sold out and closed before I arrived both days. 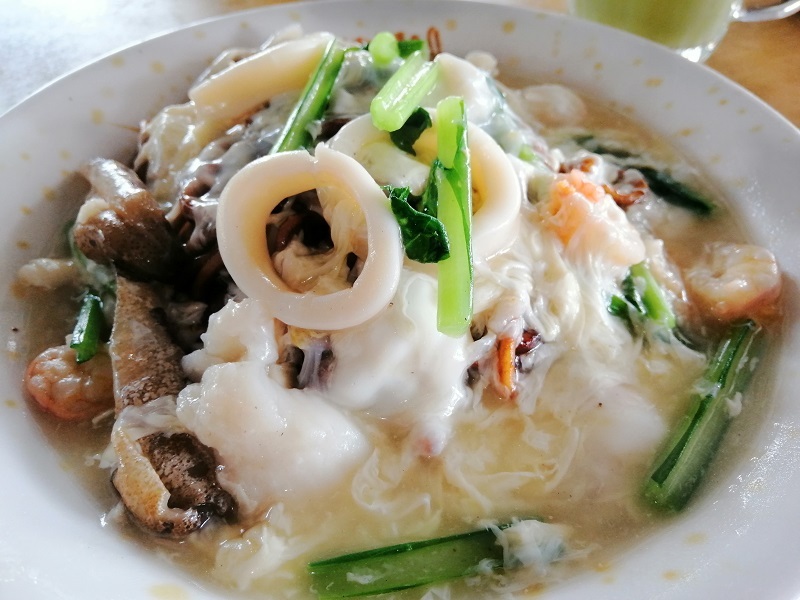  This is another item I ate during my working days in Kuching. 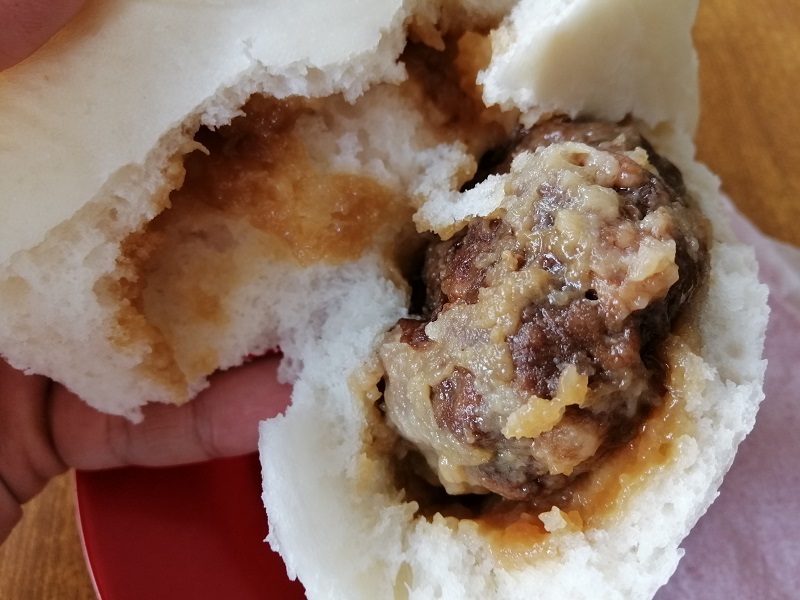 It’s a huge pao with pork and egg. Quite delicious! Too bad I didn’t have a chance to eat it again. 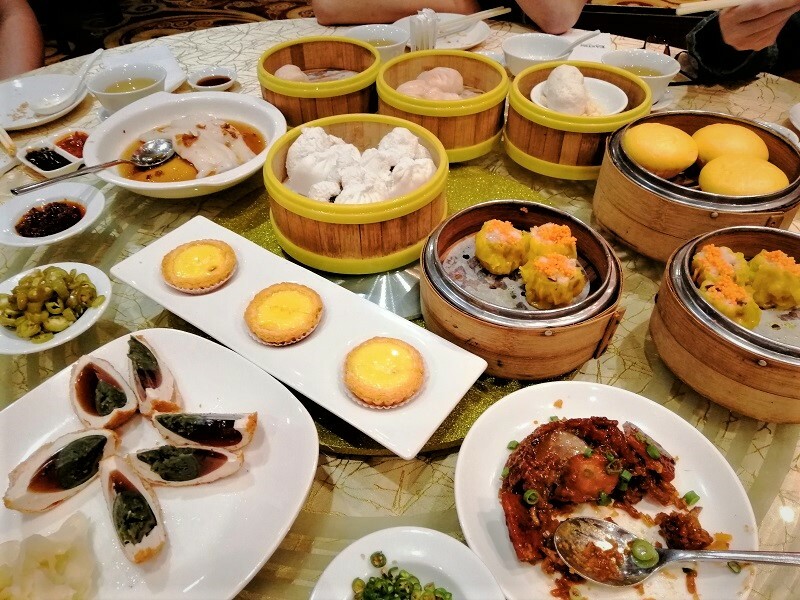 Mandy suggested Hock Hai Dim Sum Café down the road. 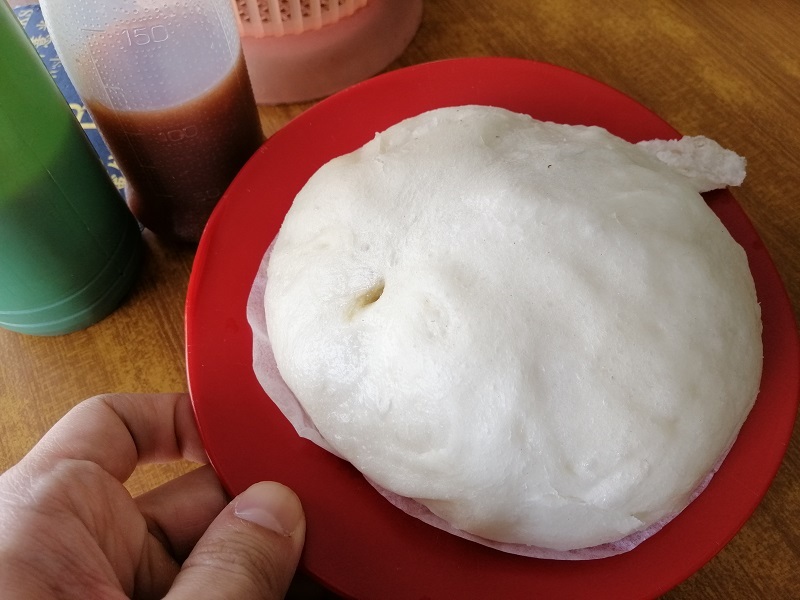 They also have a big pao, at a fraction of the price of Sin Kwang (RM 3.40) but it was oversteamed. The bottom is hard and crusty. There’s no egg inside and the mystery meat is a rolled-up ball instead of identifiable chunks. Sin Kwang’s version is way better. 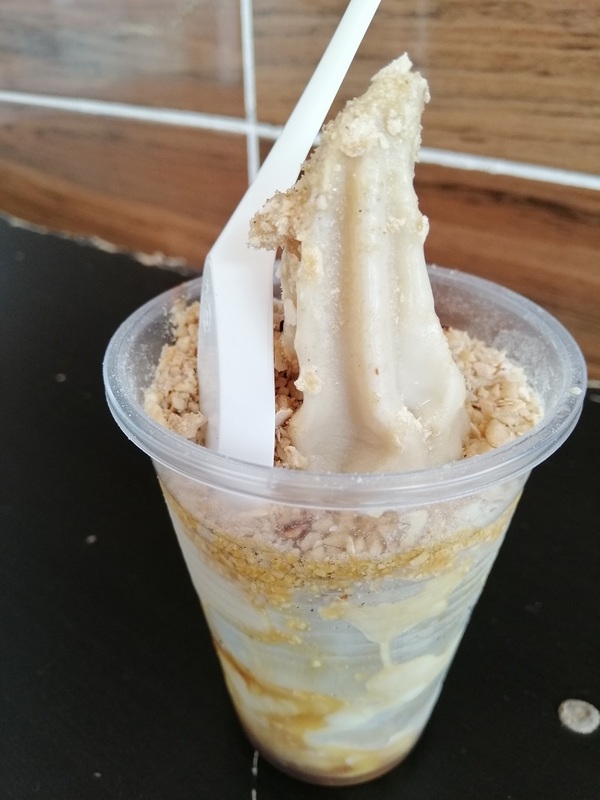 I have never eaten gula apong ice cream in Kuching before. It wasn’t available back then. This is a relatively new thing. Now there are many different ones mushrooming around town. I had to try it! 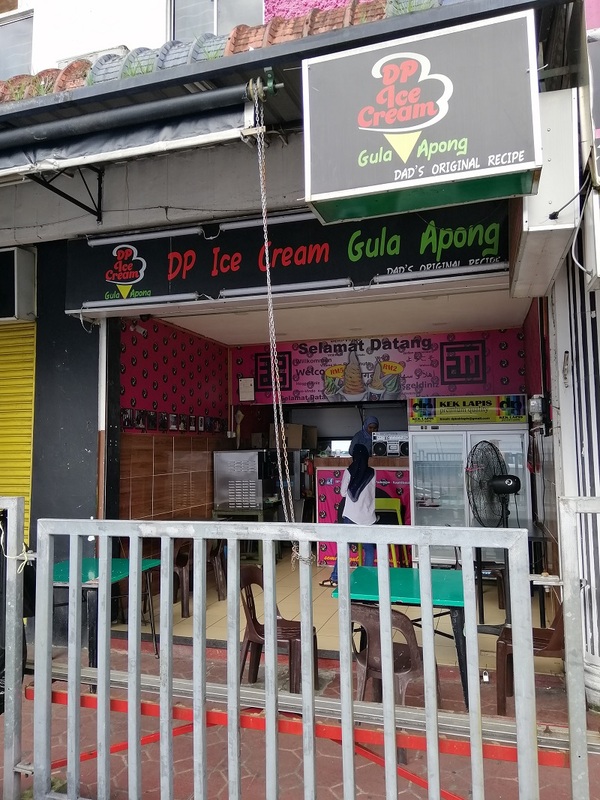 I wasn’t impressed with DP Ice Cream Gula Apong’s version though. It was very icy and diluted. Disappointing. 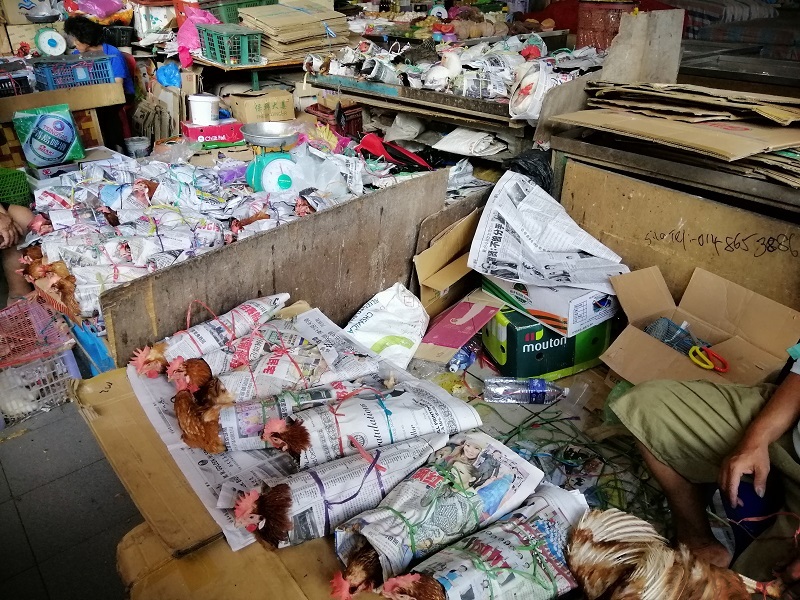 Since Kuching hawkers don’t like making tons of money, a lot of stalls are closed over the first week of CNY. 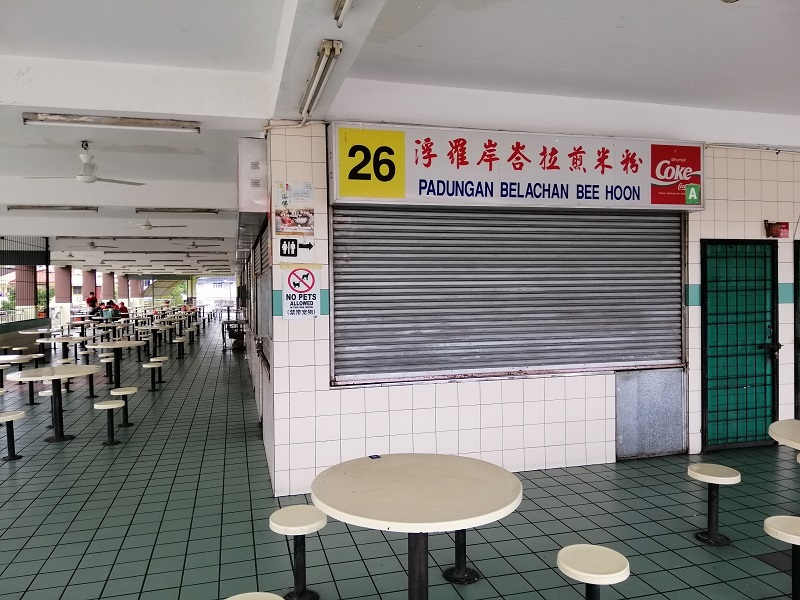 That includes all the belacan bee hoon stalls in Song Kheng Hai rugby field. Sigh. 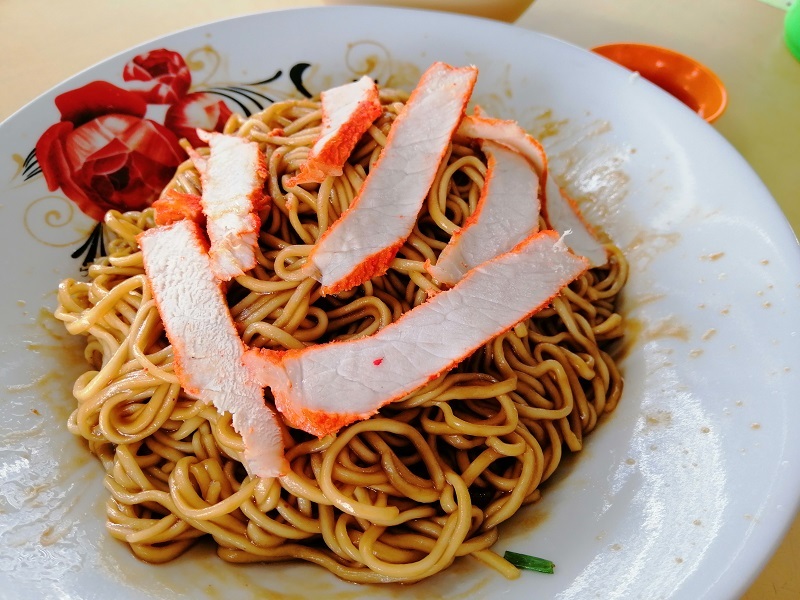 However, I managed to get my tomato crispy mee fix. 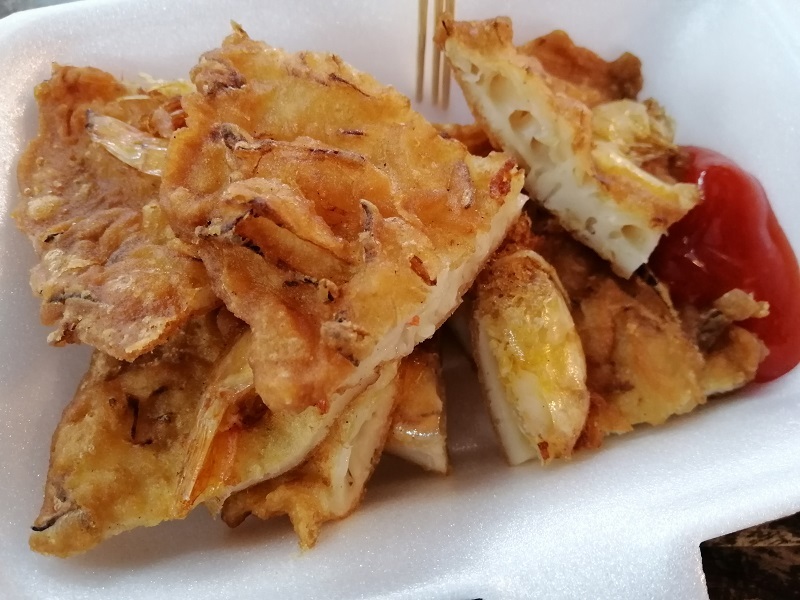 The best version is in Hui Sing Hawker Center but that’s quite far away so I had this at a random coffee shop in Padungan. It was pretty good too! I had this at an odd hour too – 3-4 pm in the afternoon. You can’t do that in most places. 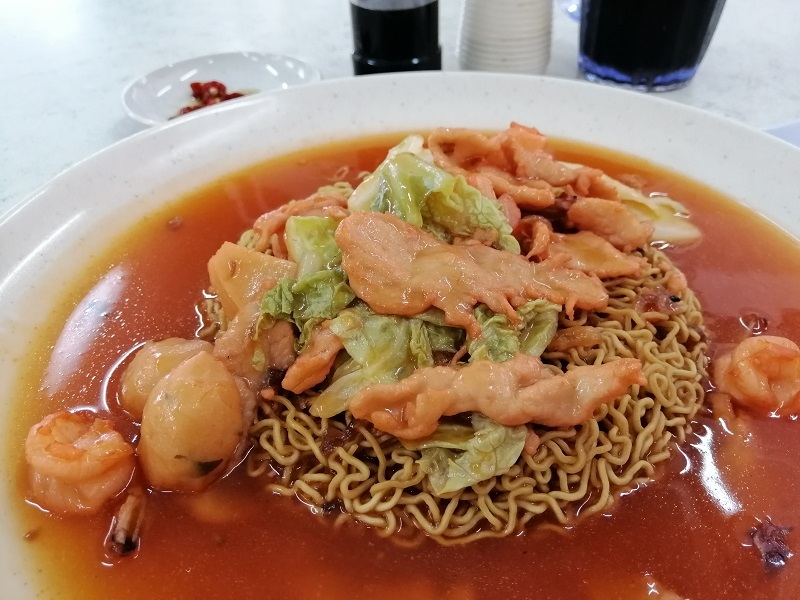 These noodles are kolo noodles that’s been deep fried and doused with seafood filled tomato sauce. 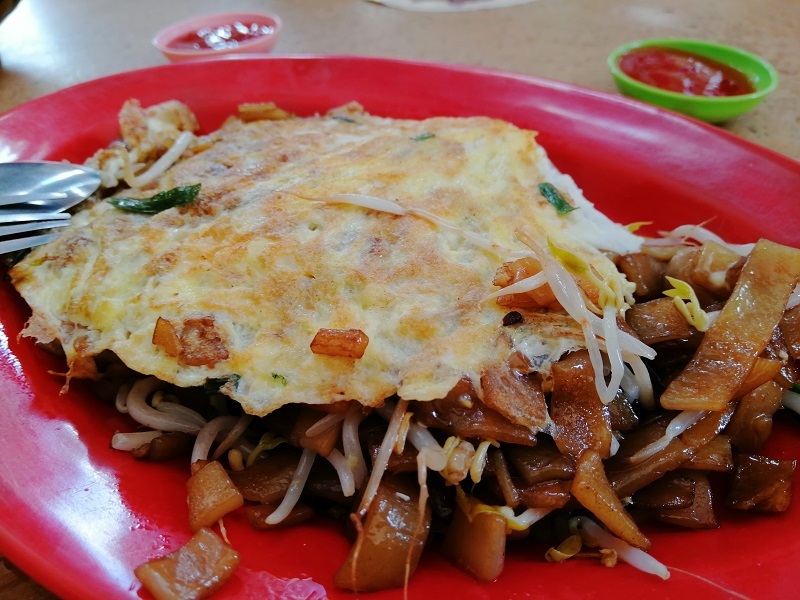 They have a kueh tiaw version too but I prefer the noodle ones. 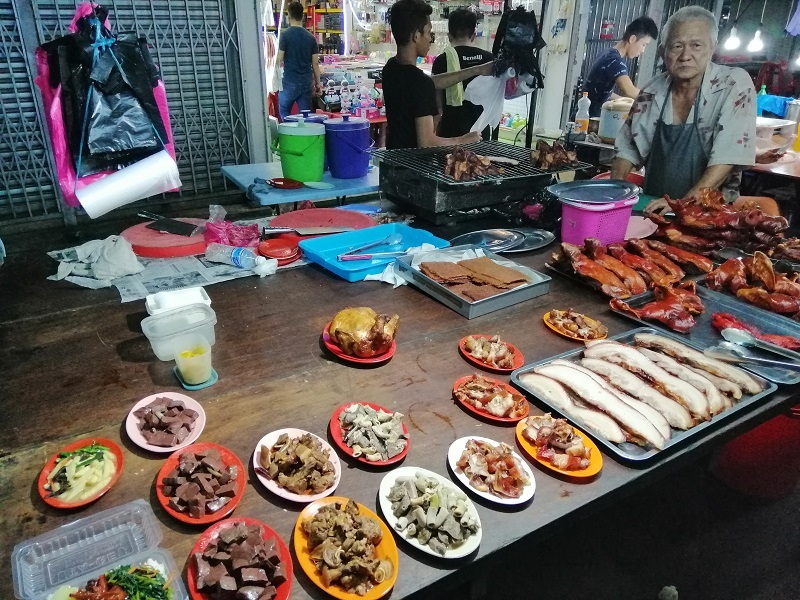 Another must-eat in Kuching is kueh chap – various innards and offcuts of the pig in a thin braising liquid. 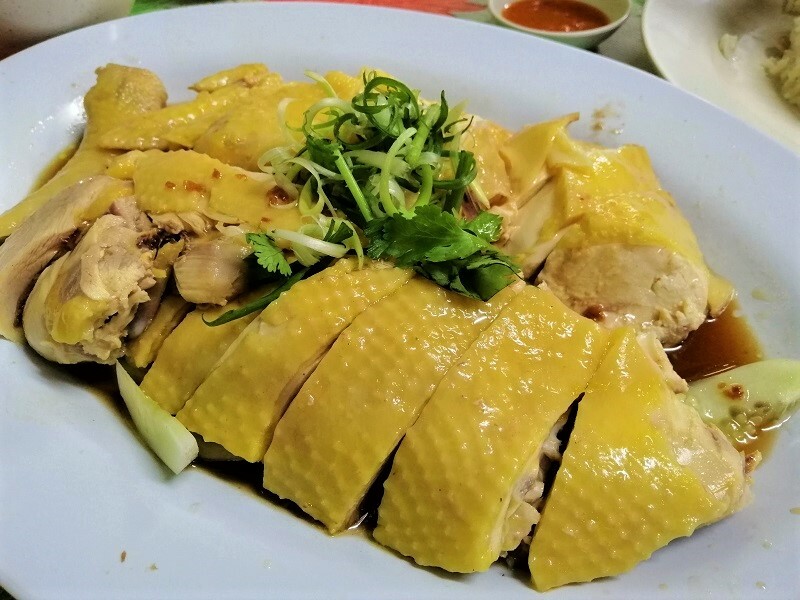 It’s served with rice sheets. 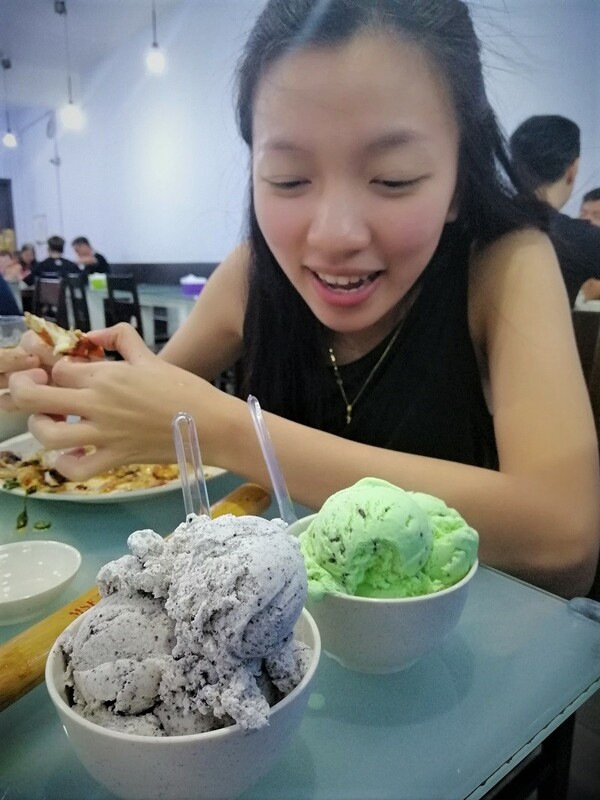 I’m actually not a fan of kueh chap. 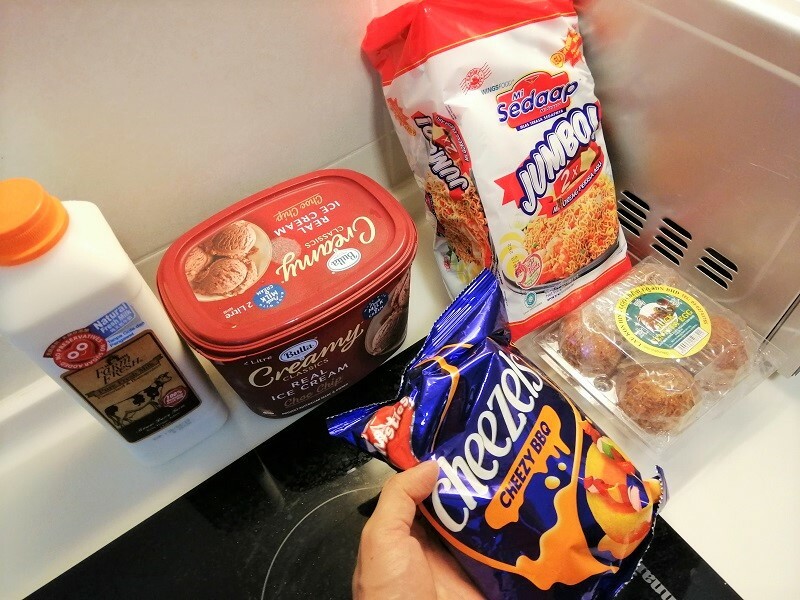 I never crave for these things but it’s nice to eat once in a while. 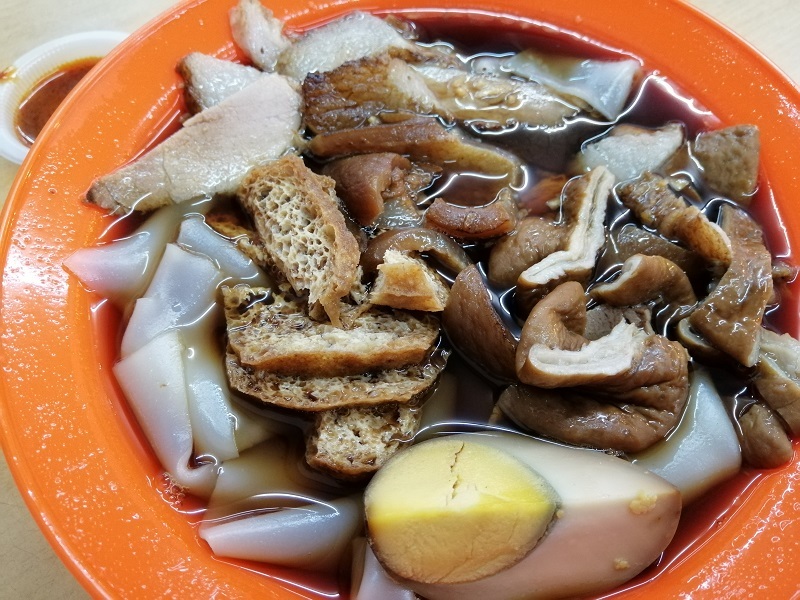 I can’t remember the last time I had kueh chap. Definitely more than a decade ago. I also found a durian stall at the cat statue in Padungan. I hear this is the designated seasonal fruit vendor’s location now. 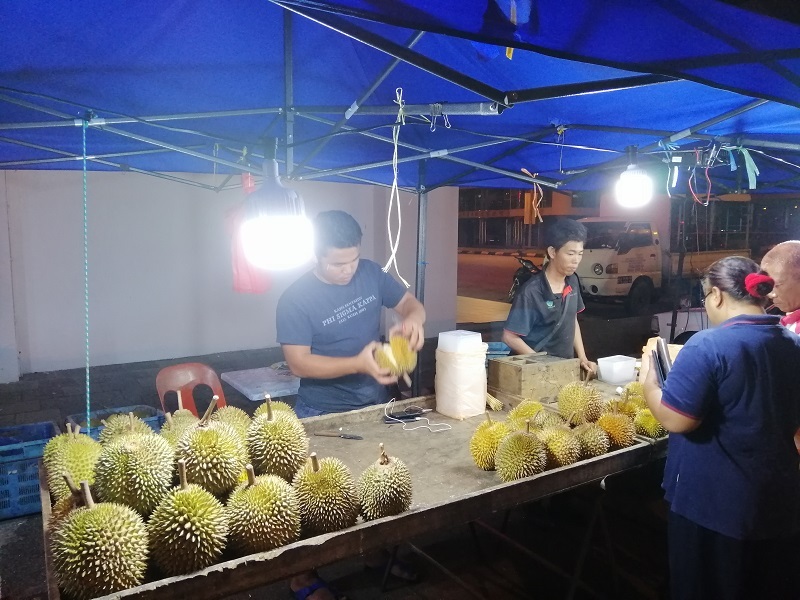 We don’t get branded durian cultivars in Sarawak, but that is slowly changing. 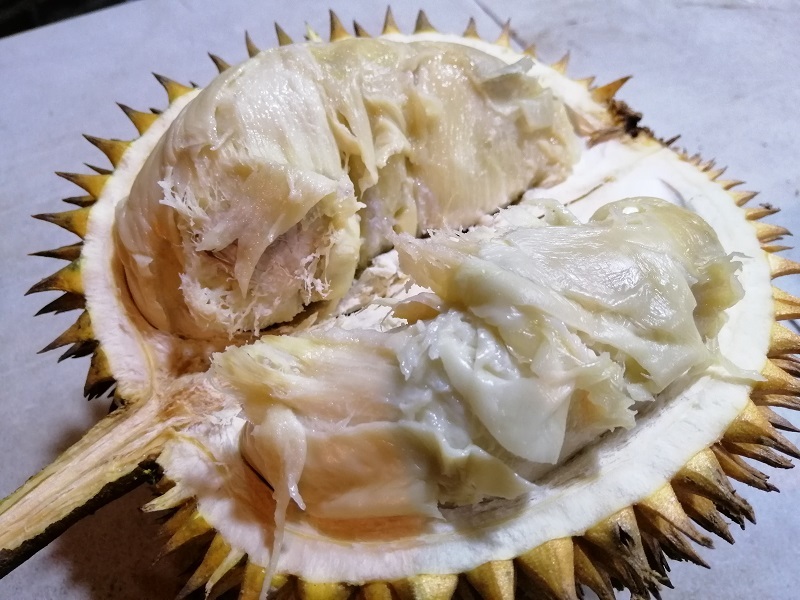 This is a kampung durian for RM 10. Not bad! 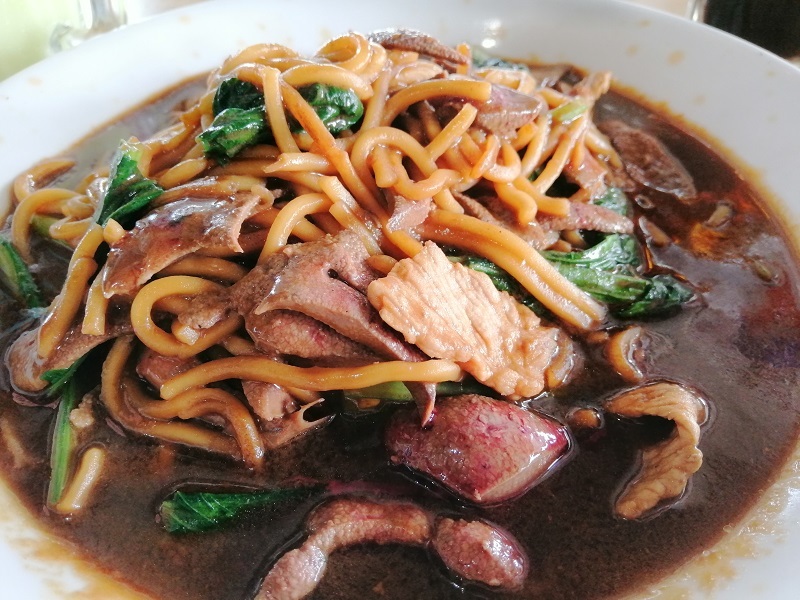 I managed to squeeze in one last meal at Mee Sin Café before I had to catch my flight to Pontianak. 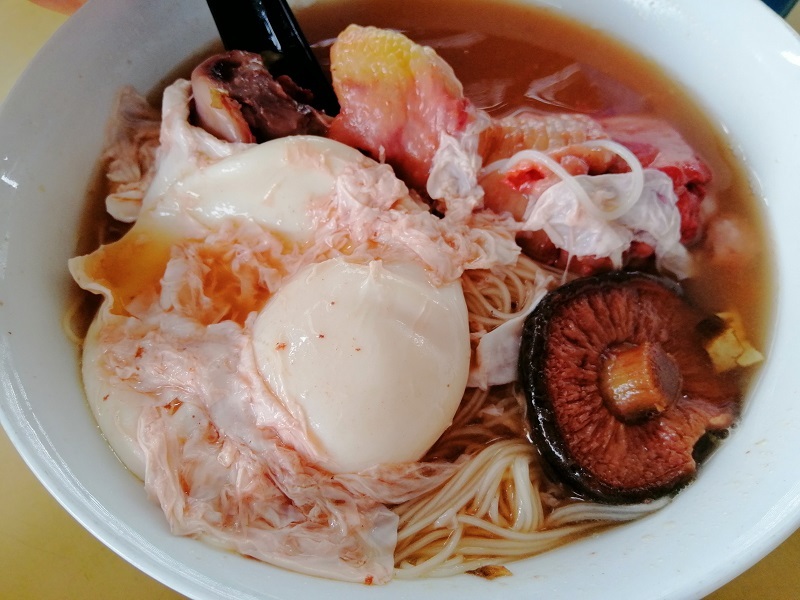 I woke up very early at 6:30 am and went there to eat seafood kolo mee. 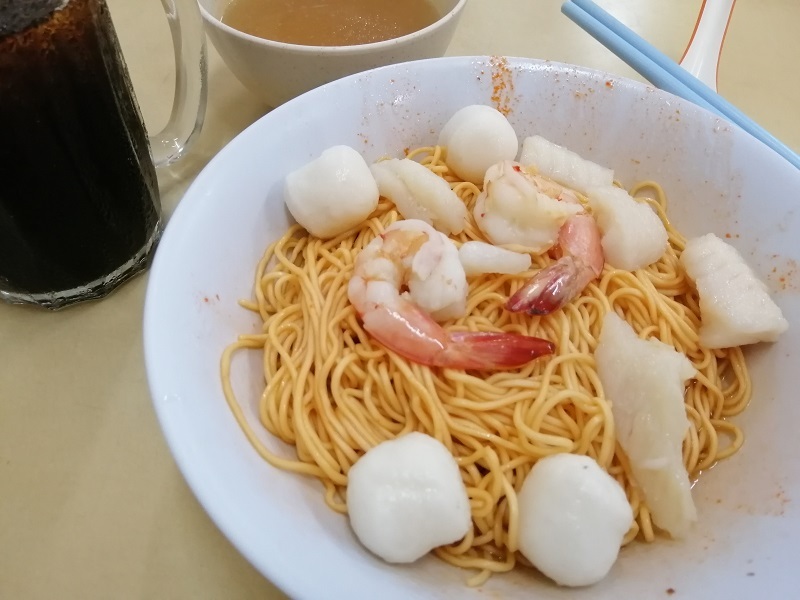 They’re famous for sheng rou kolo mee (fresh meat kolo mee) but I prefer the seafood version. 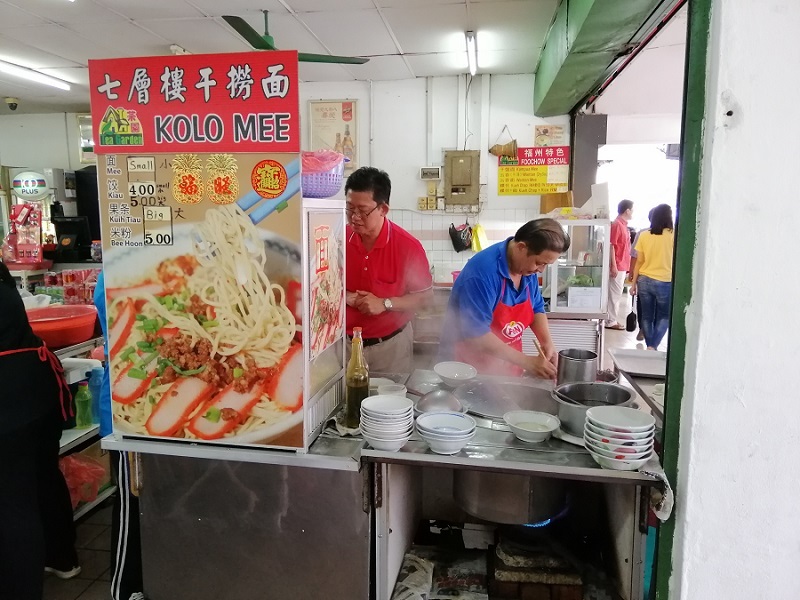 The kolo mee here is very delicious! I requested for cha siu oil to be added so it’s red. 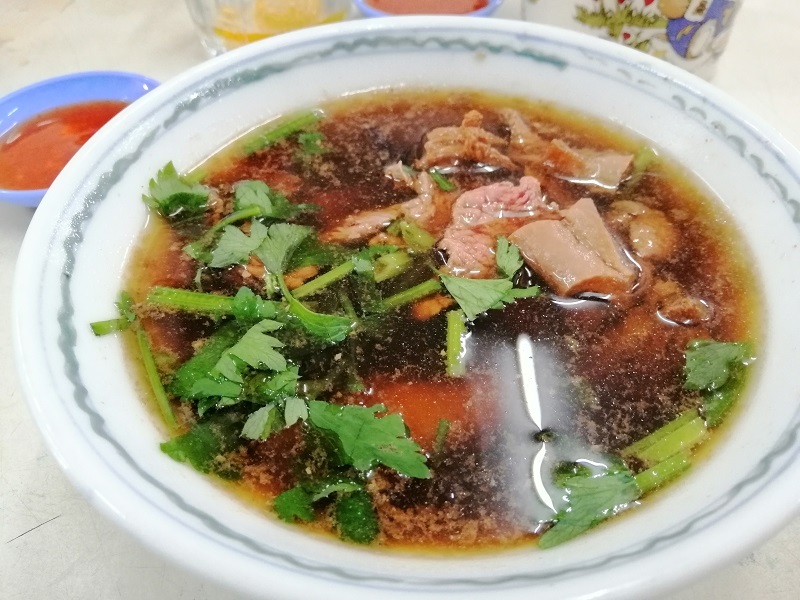 The proper way to order this is “pang ang” (literally “put red”). 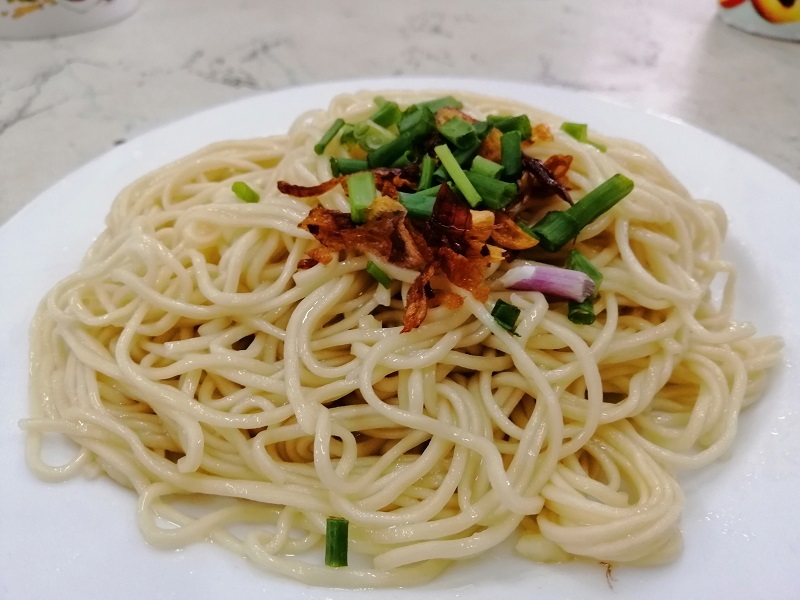 The kolo noodles were springy and chewy, a very pleasing toothsome bite. This more than makes up for the disappointing kolo mee I had the previous day. 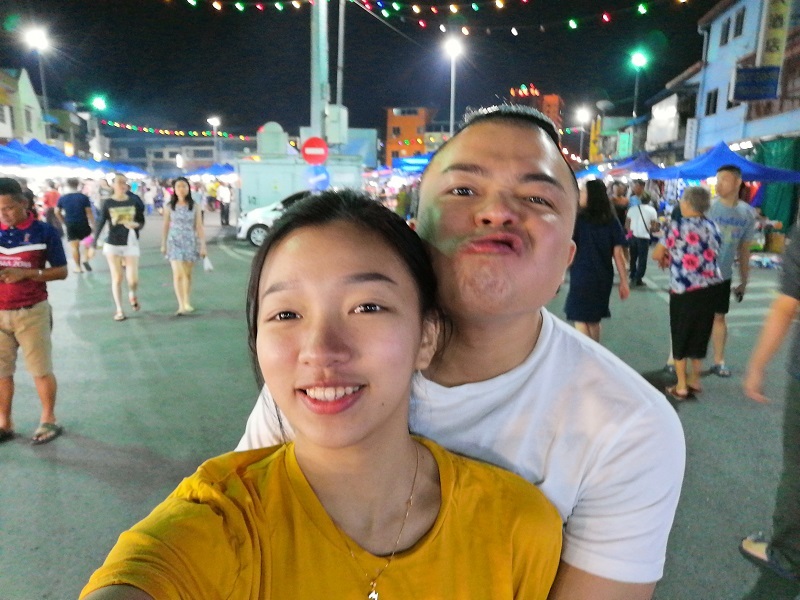 I’ll love to go back to Kuching again to catch up on the places that I’ve missed or were closed. I suspect I’ll come here more often now that my girlfriend’s hometown is Kuching.